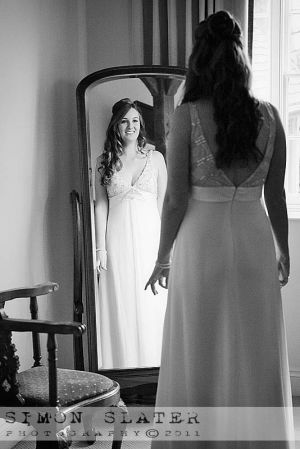 Towards the end of October I had he pleasure of photographing Tori and Andy’s wedding at Crockwell Farm near Eydon, Northamptonshire. 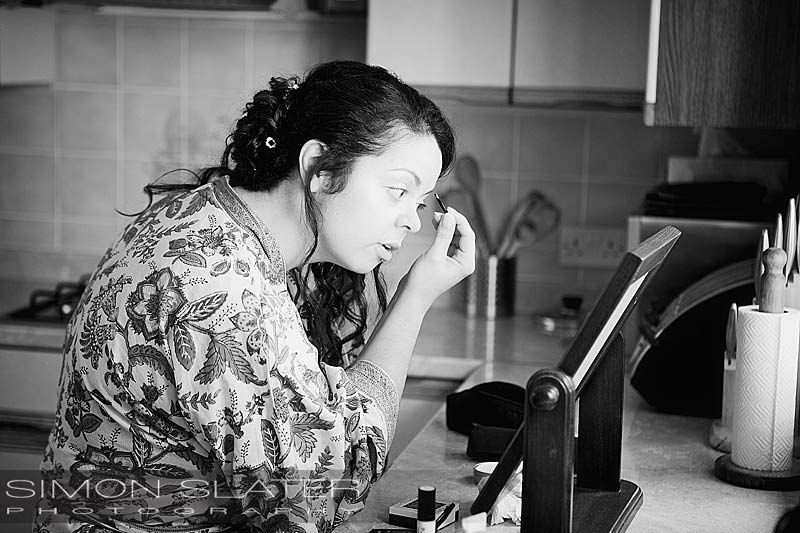 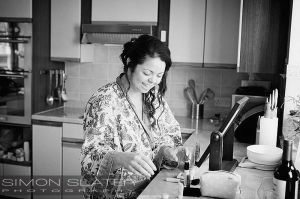 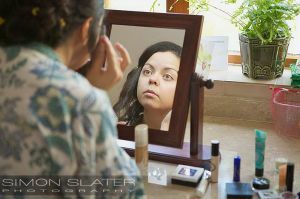 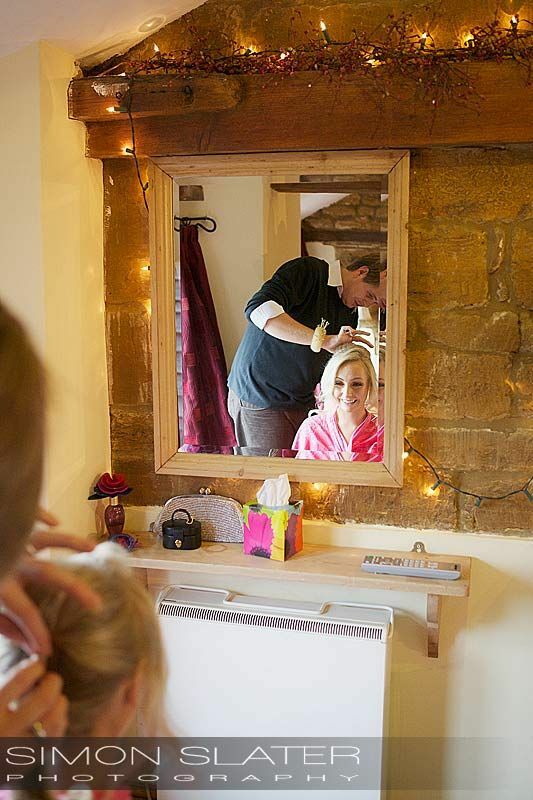 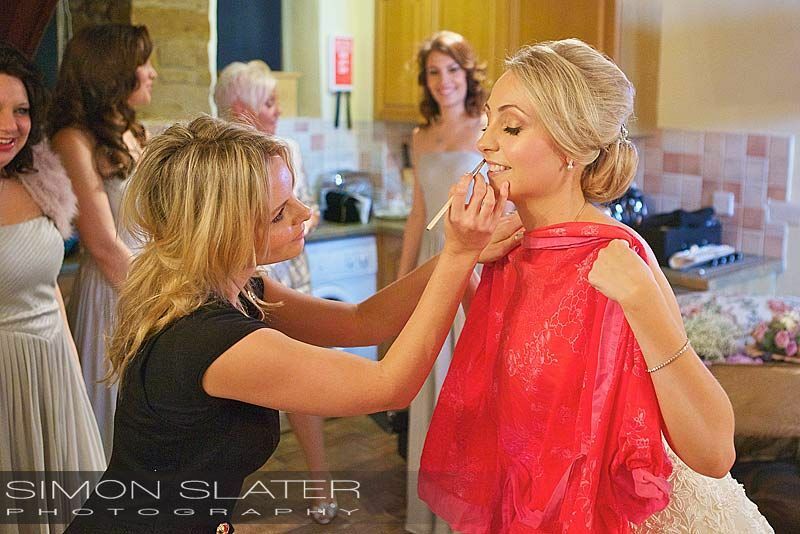 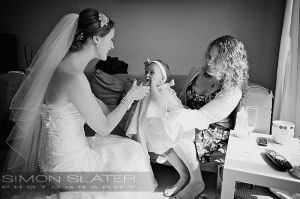 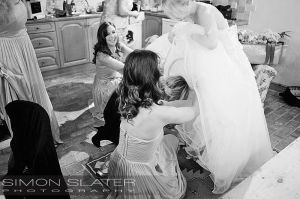 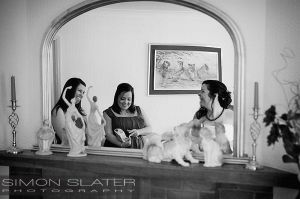 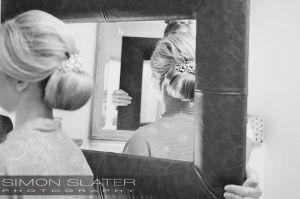 Tori got ready in one of the lovely cottages at Crockwell Farm with the help of her bridesmaids, mother and future mother-in-law. 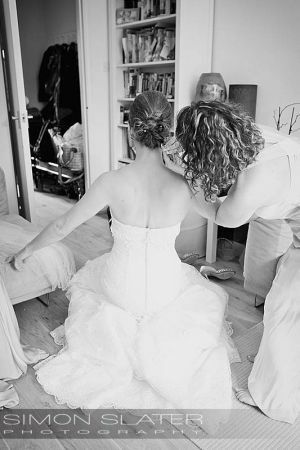 It was a true case of ‘constructive chaos’ with the hair dresser and make-up artists and everyone getting ready in one space. 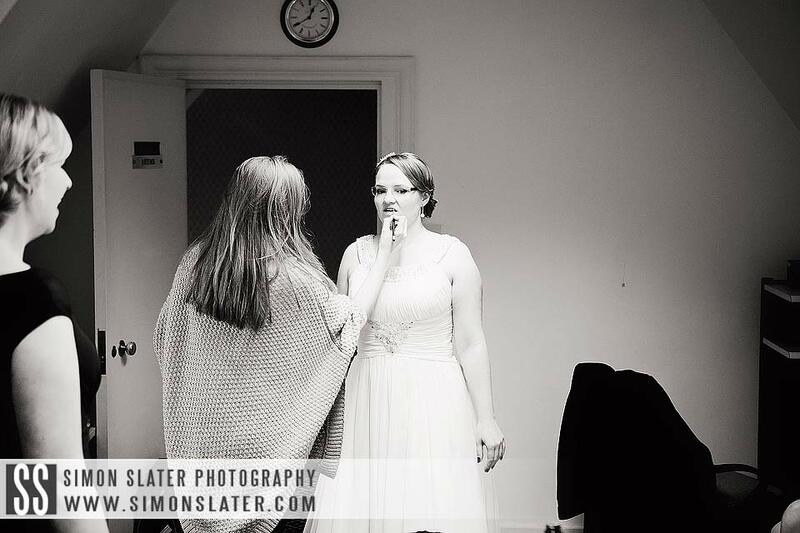 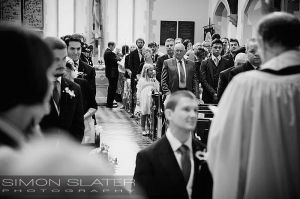 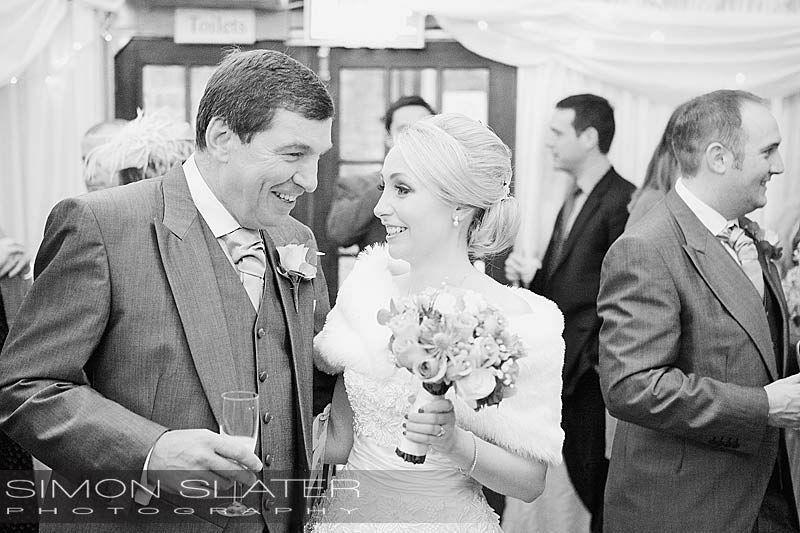 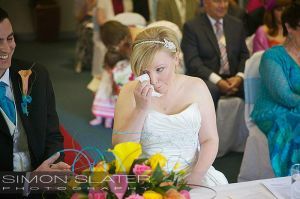 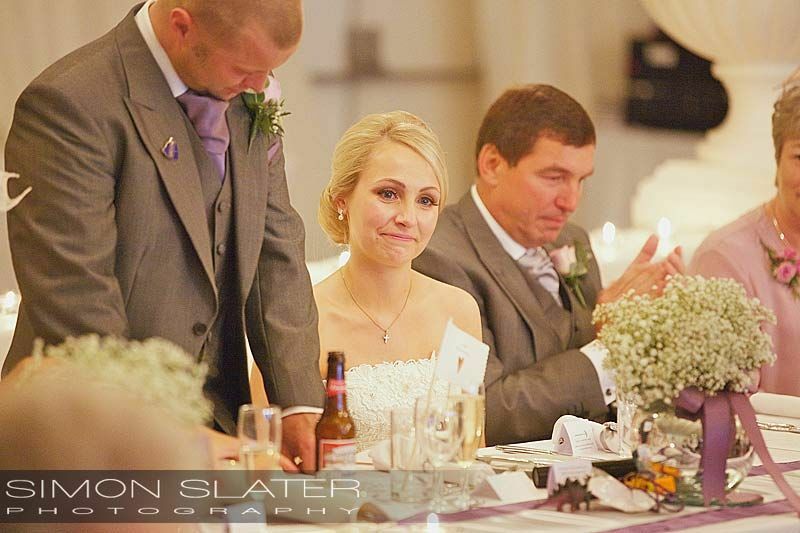 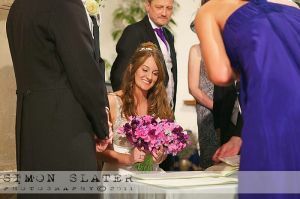 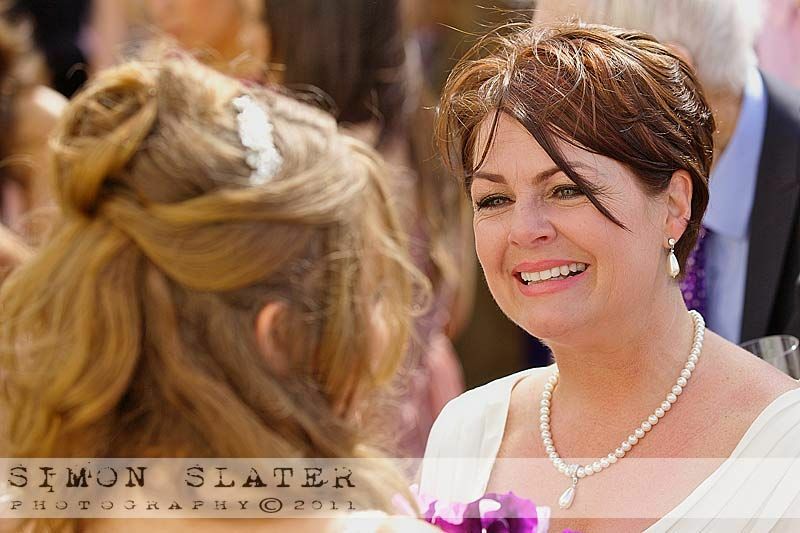 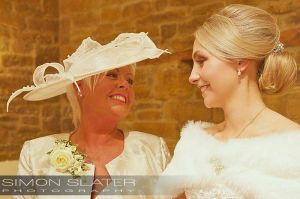 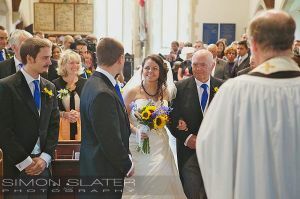 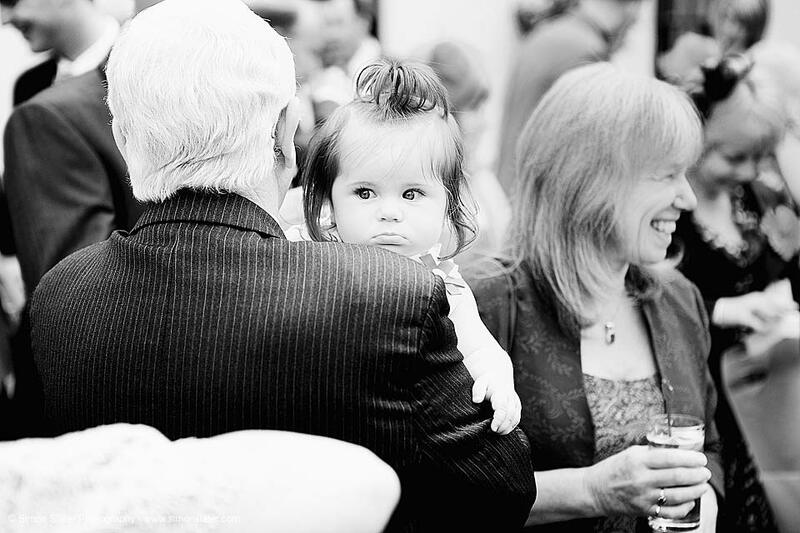 Tori looked truly stunning before being walked up the aisle by her father to a very nervous looking groom. 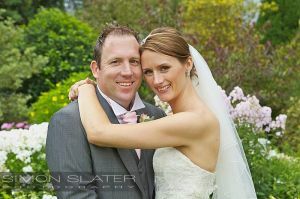 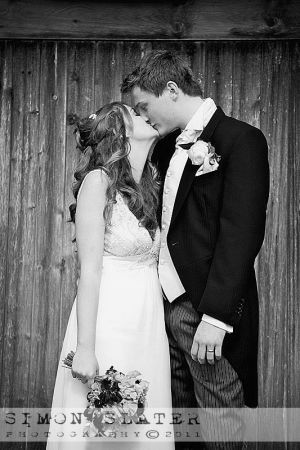 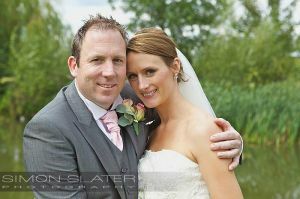 Tori and Andy were then married by 14:30 hrs, Congratulations again to Mr & Mrs Lewis. After the ceremony Tori and Andy, wedding party, family and friends all made their way through to a marquee covered bar and reception area for a champagne reception and canapes. 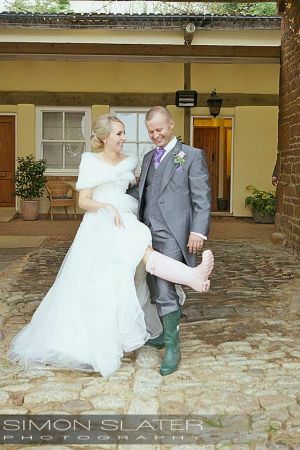 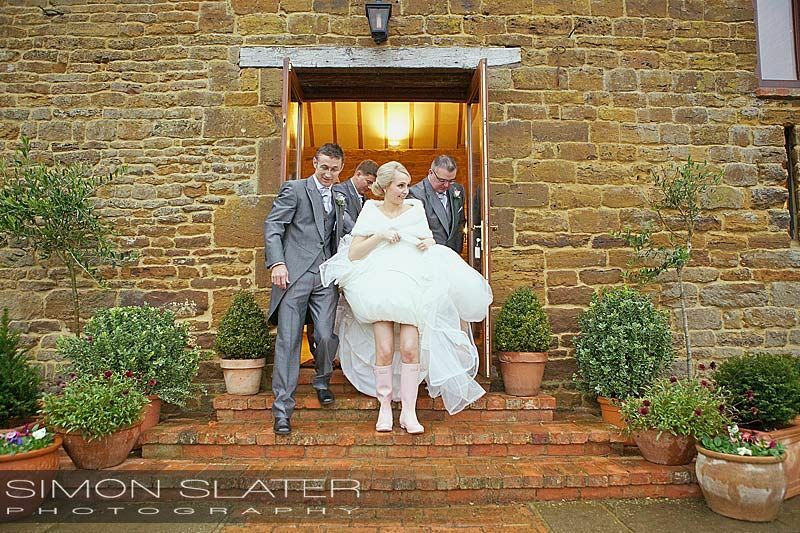 Unfortunately the weather was against us but Tori and Andy were determined to get outside for a few minutes as they both got in to their ‘wedding wellies’ green for Andy and Pink for Tori, very apt considering we were on a farm. 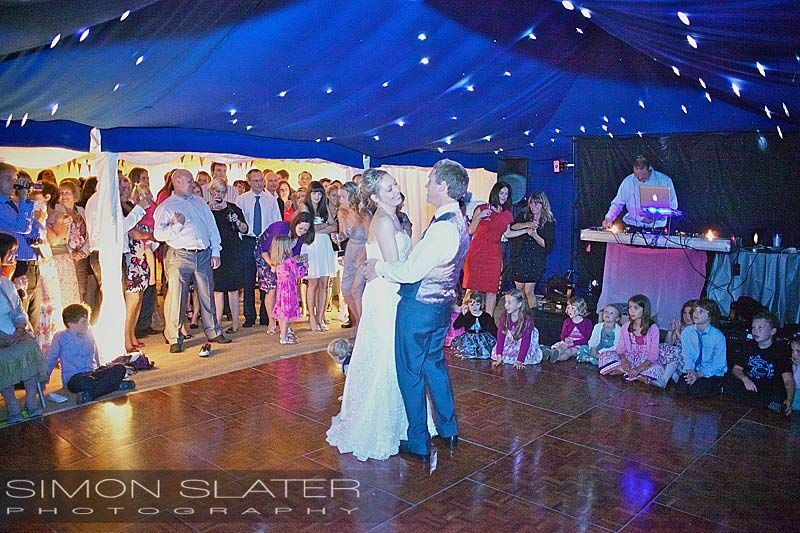 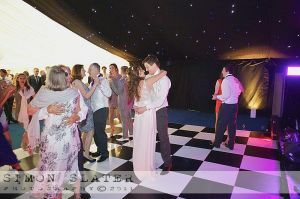 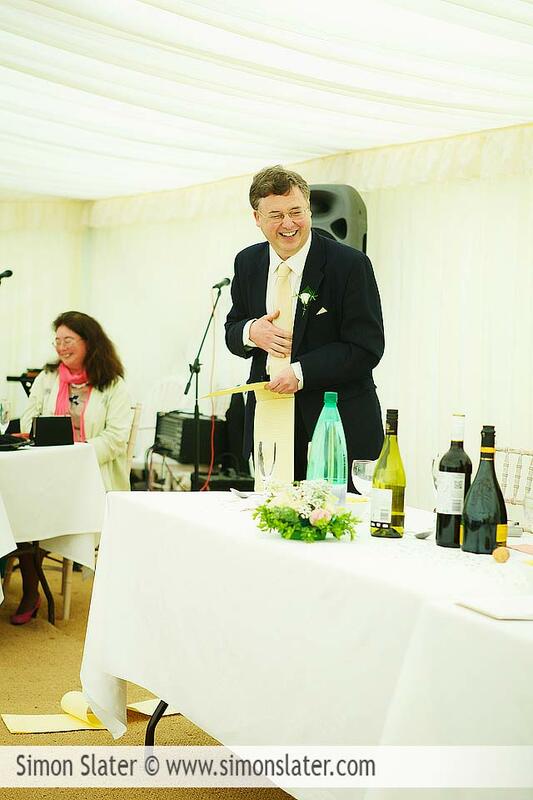 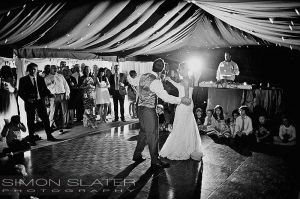 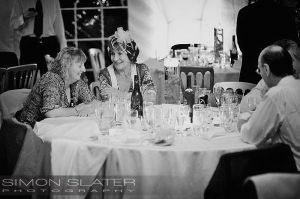 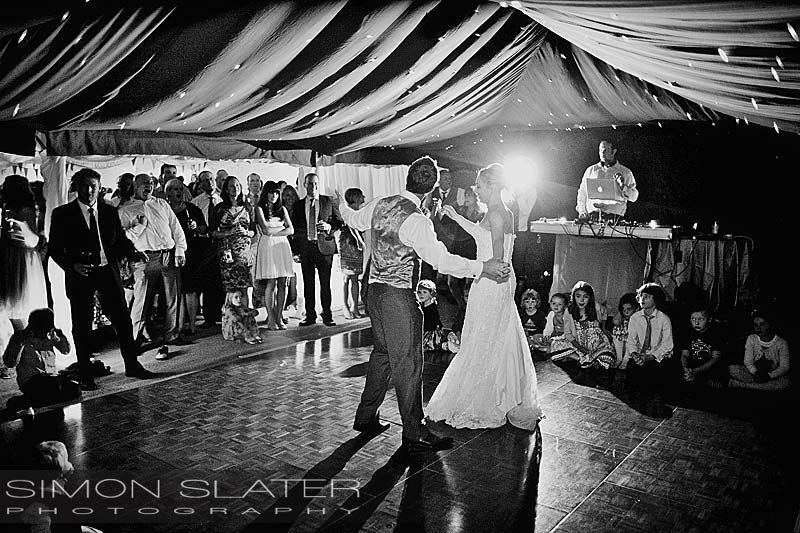 The wedding reception, speeches, cutting of the cake, first dance and evening celebrations were all held in the main marquee and no doubt in to the early hours of Friday morning. 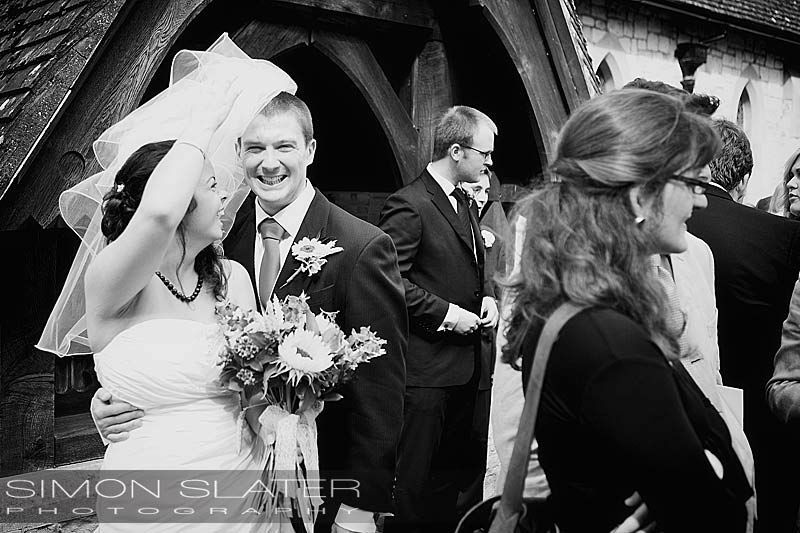 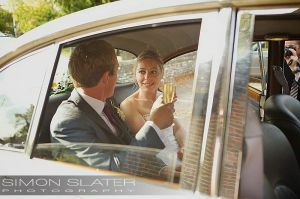 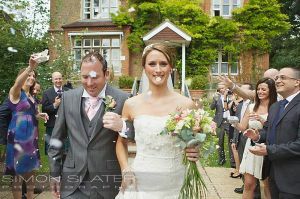 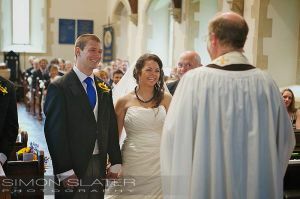 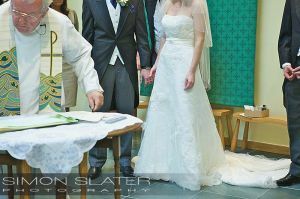 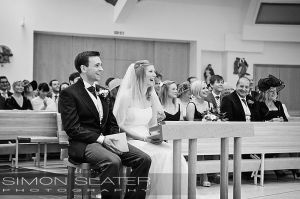 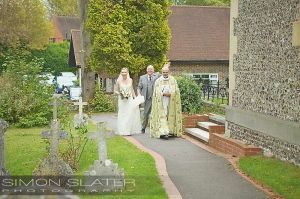 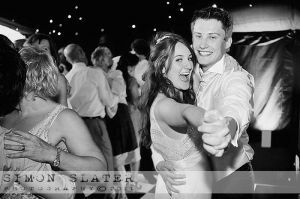 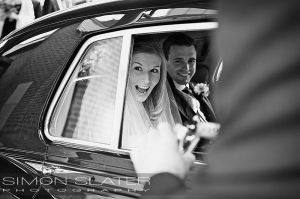 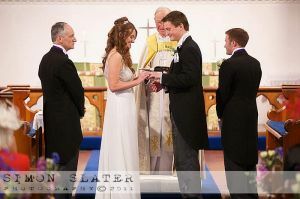 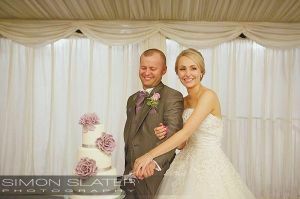 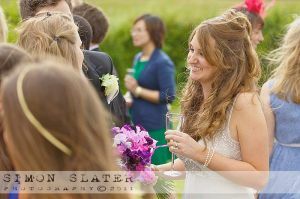 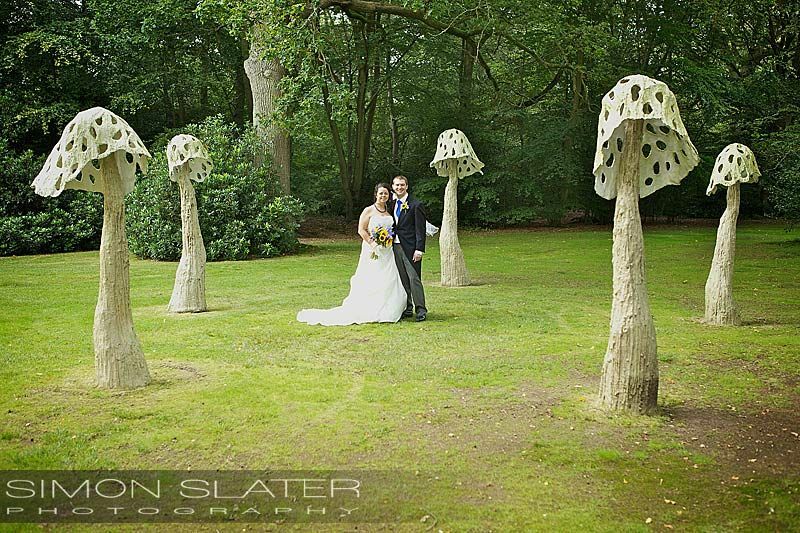 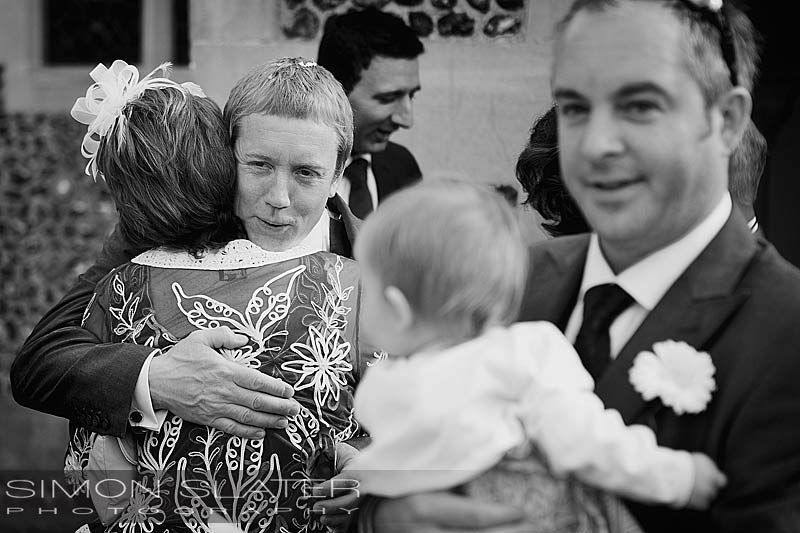 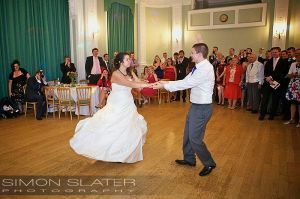 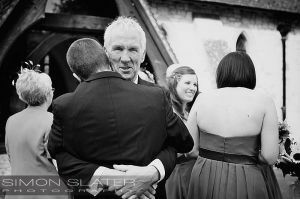 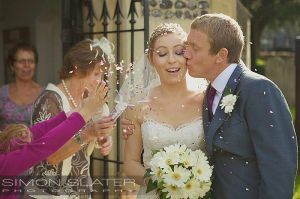 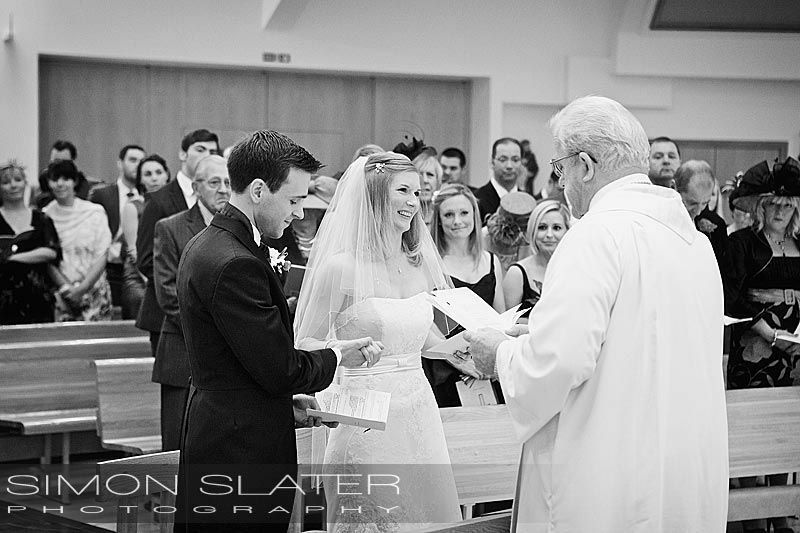 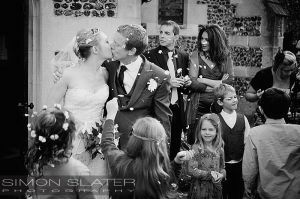 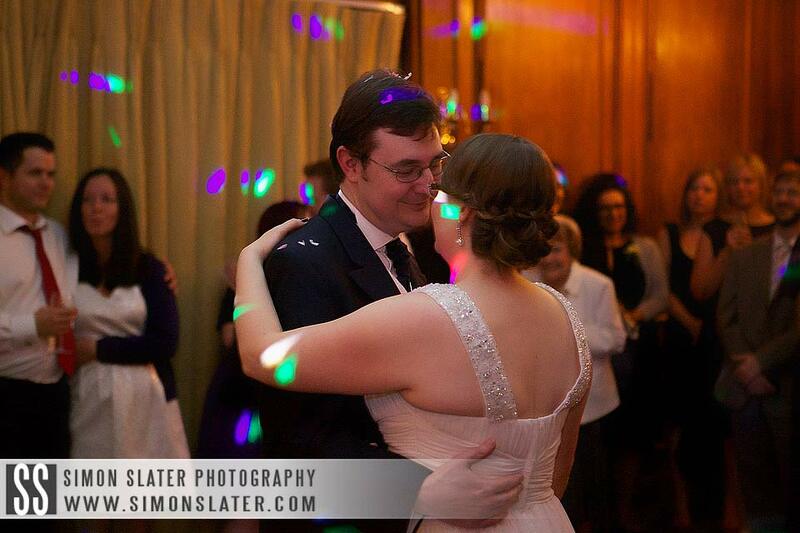 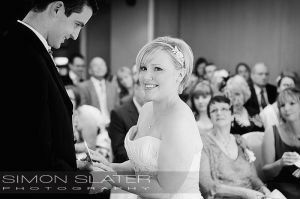 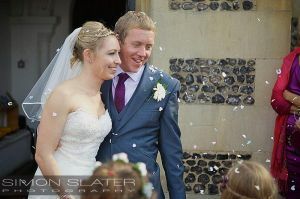 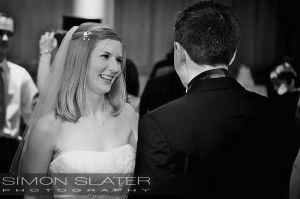 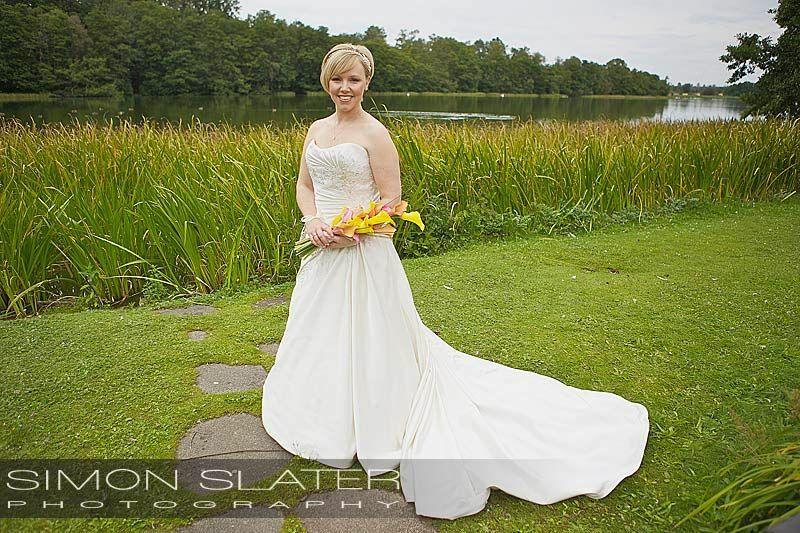 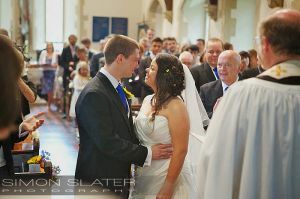 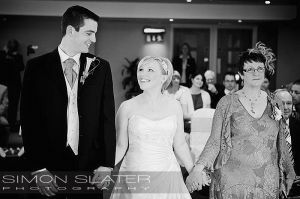 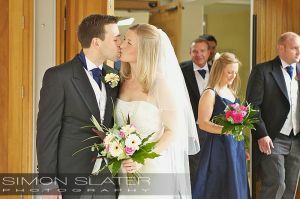 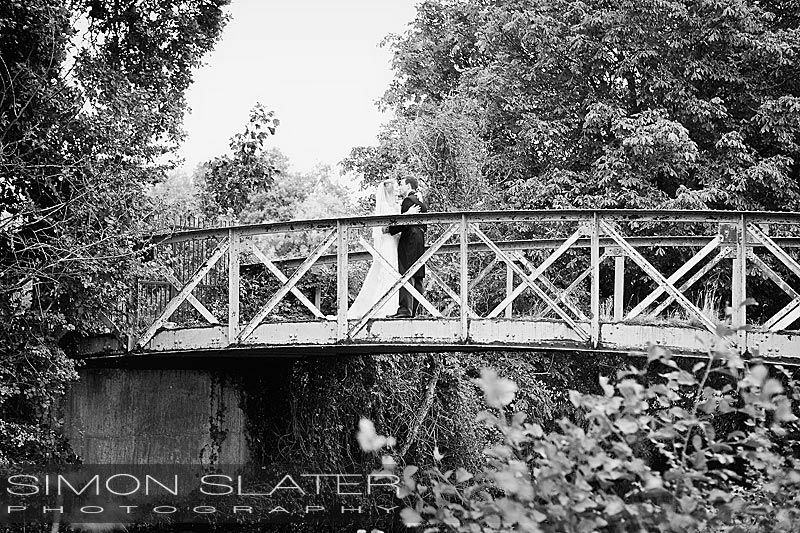 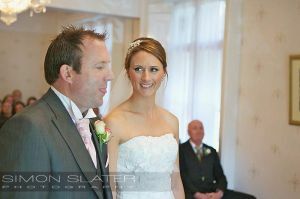 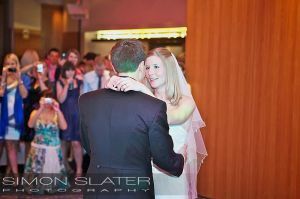 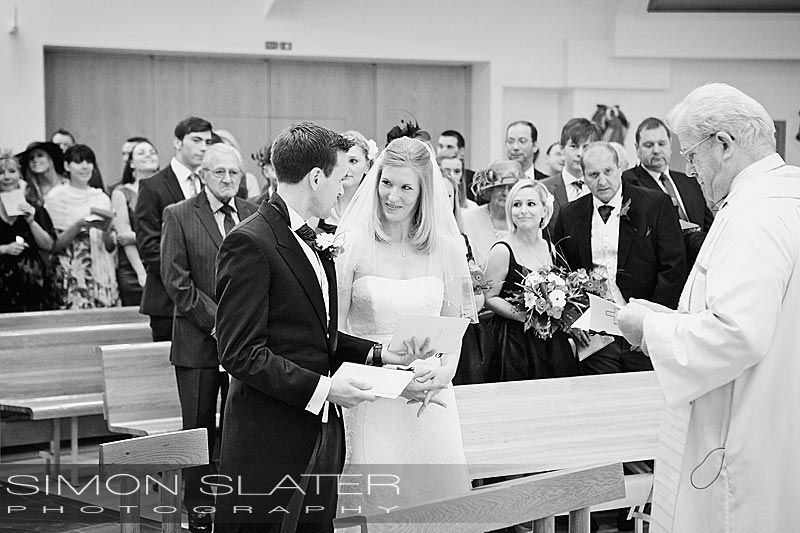 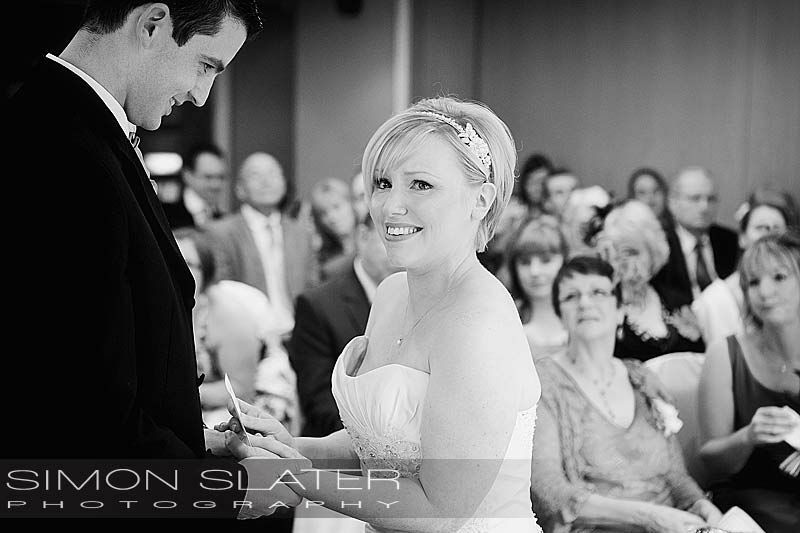 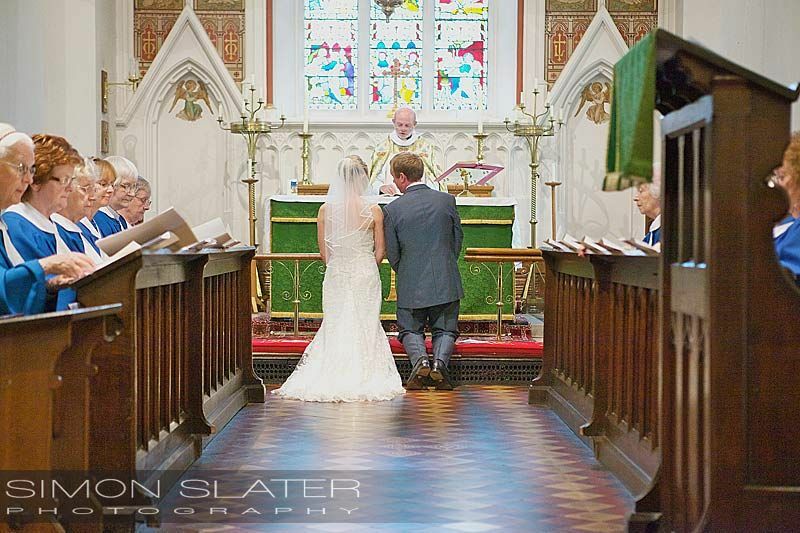 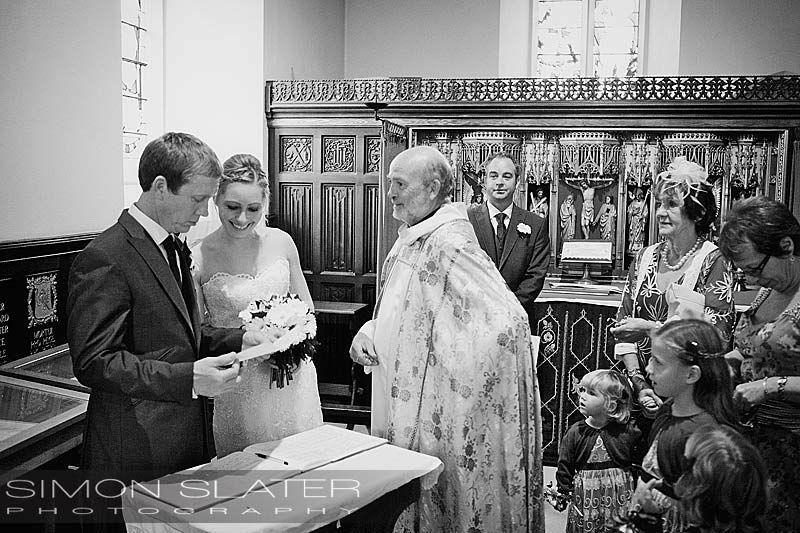 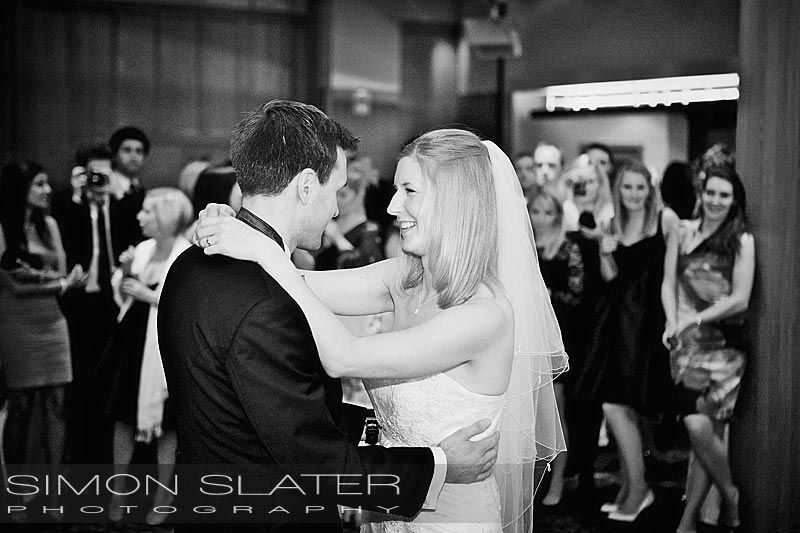 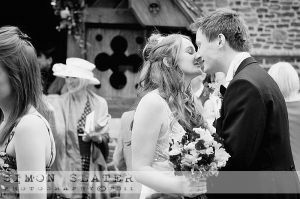 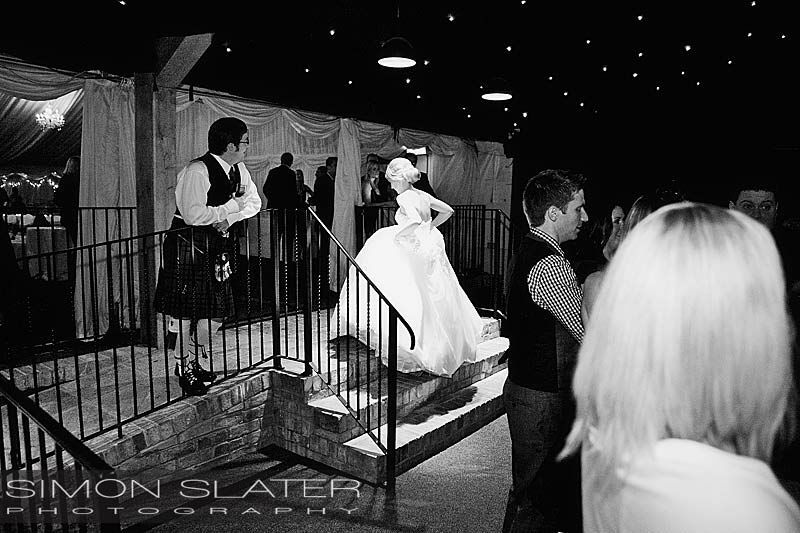 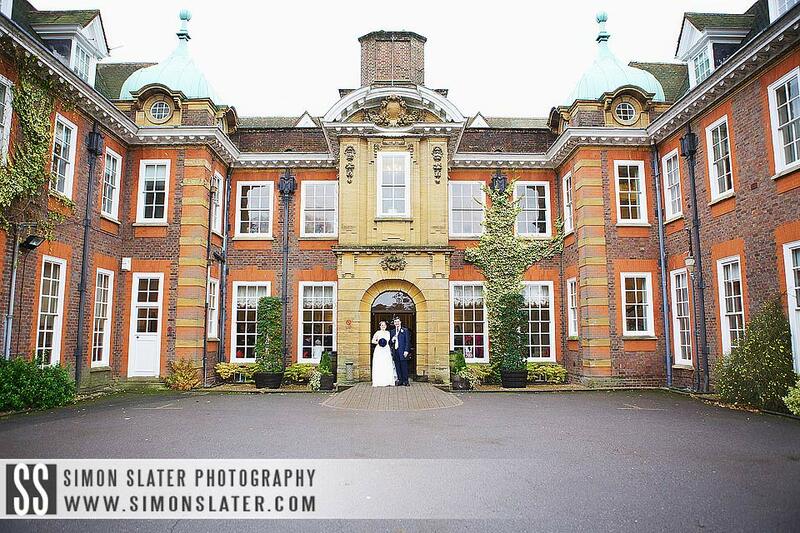 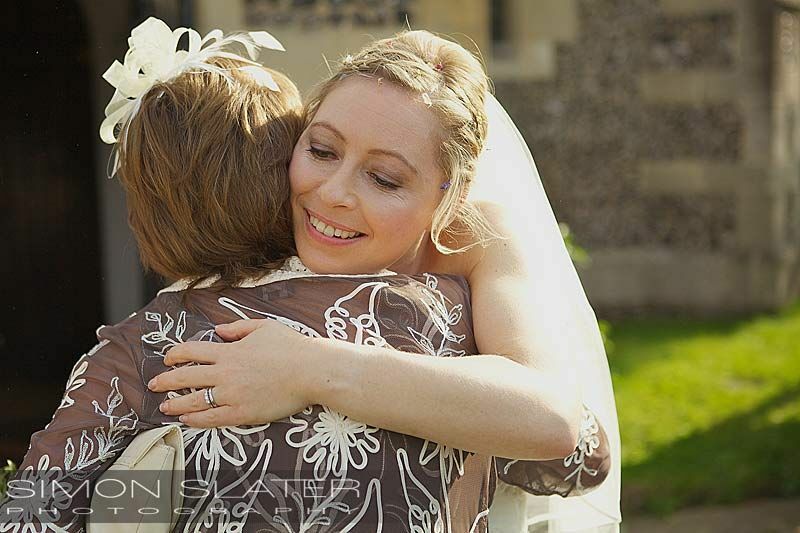 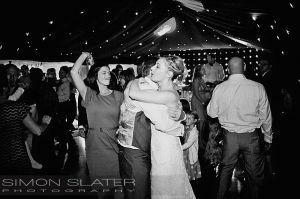 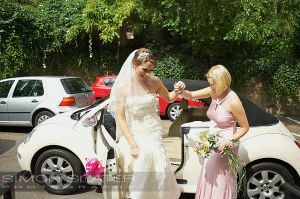 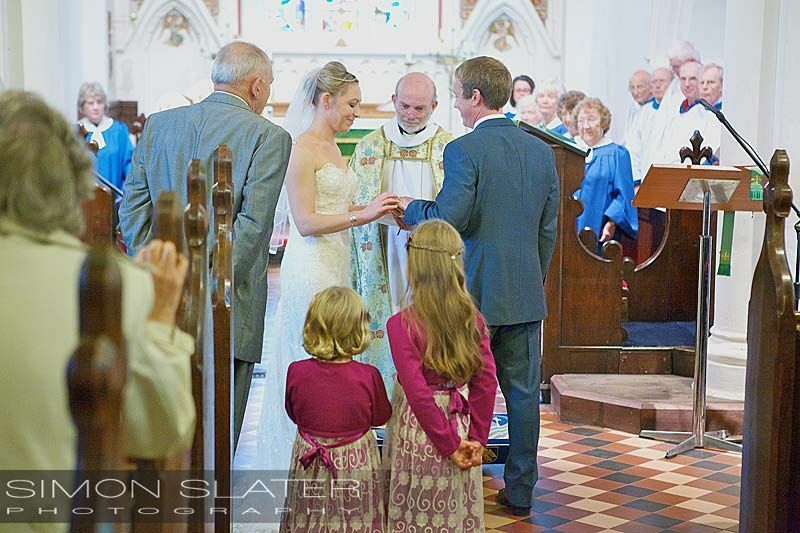 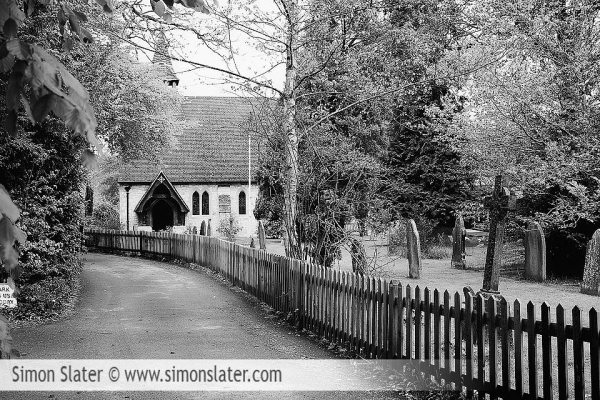 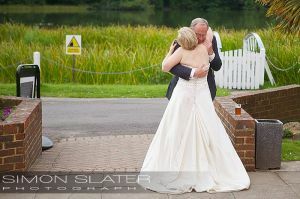 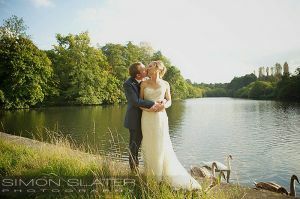 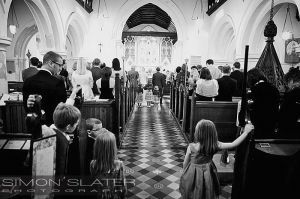 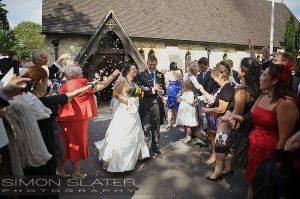 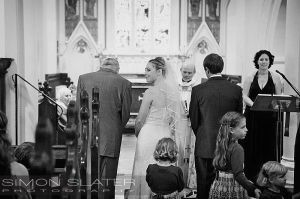 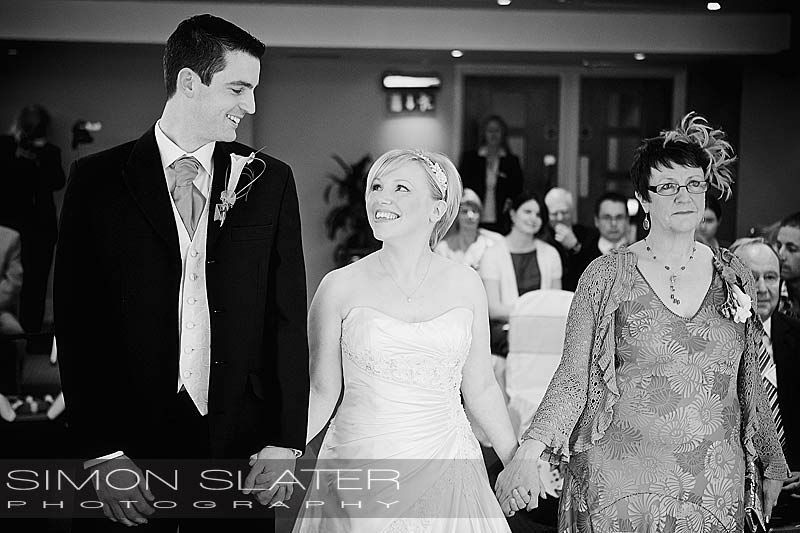 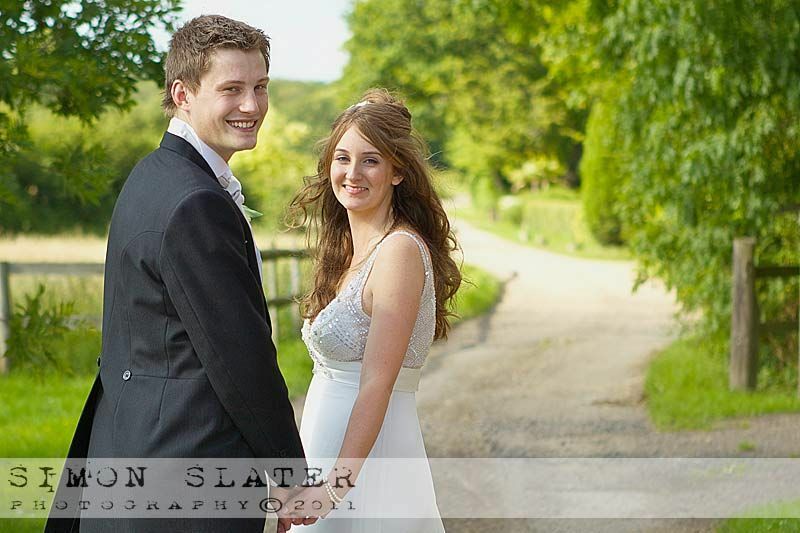 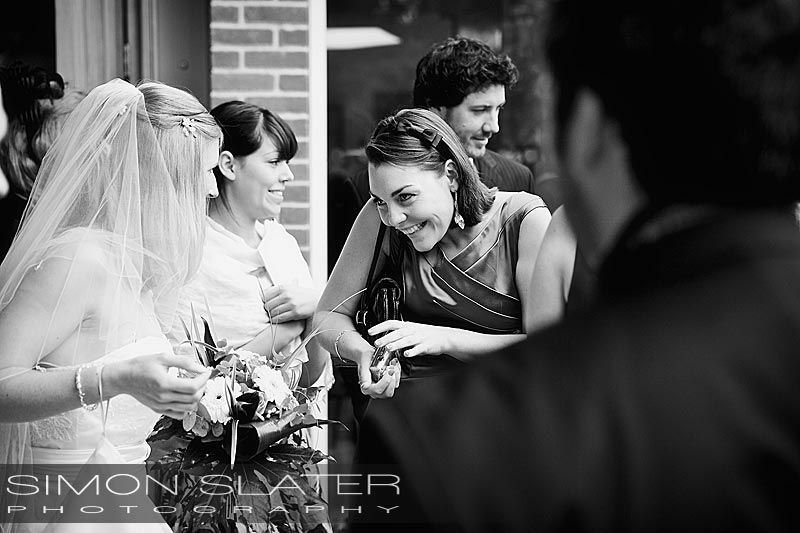 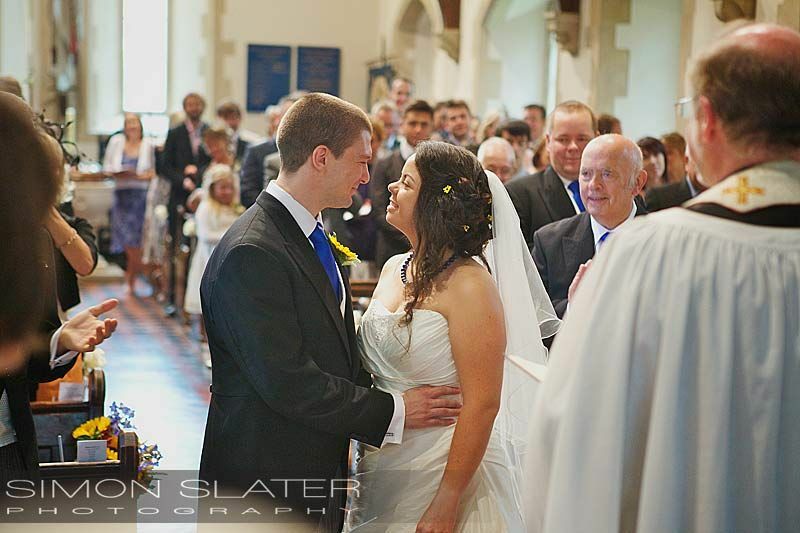 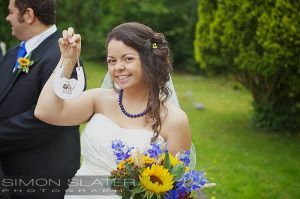 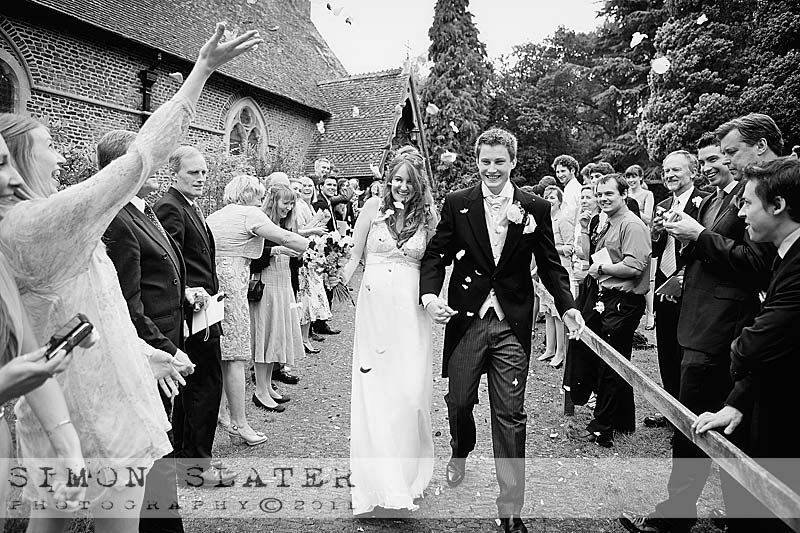 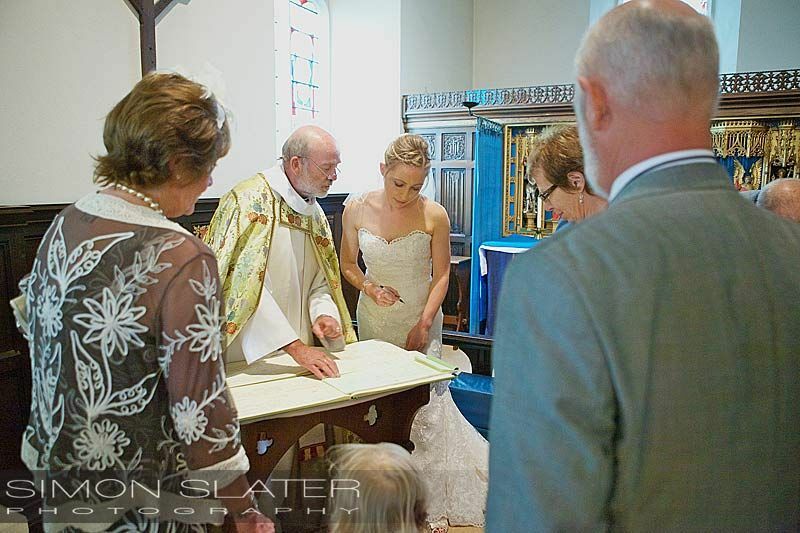 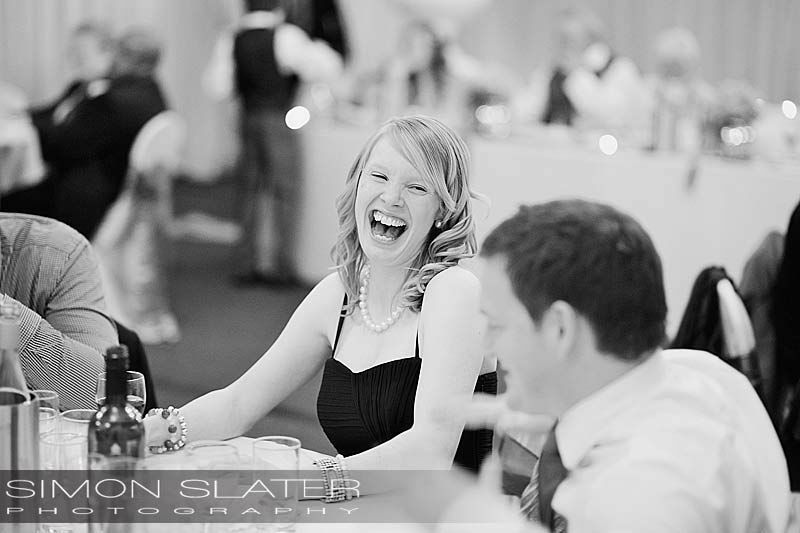 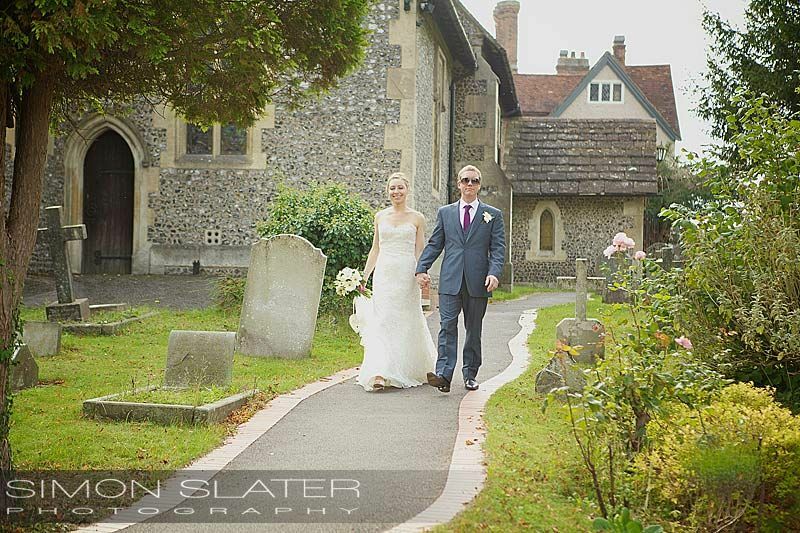 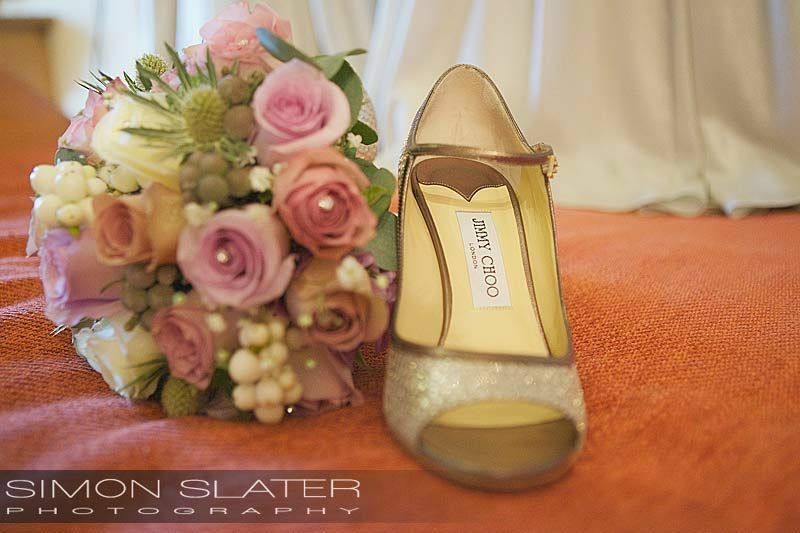 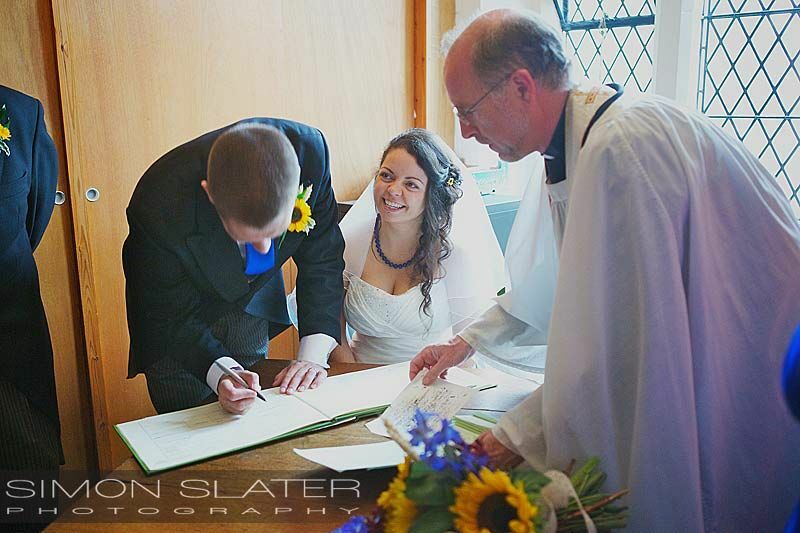 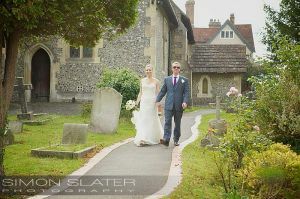 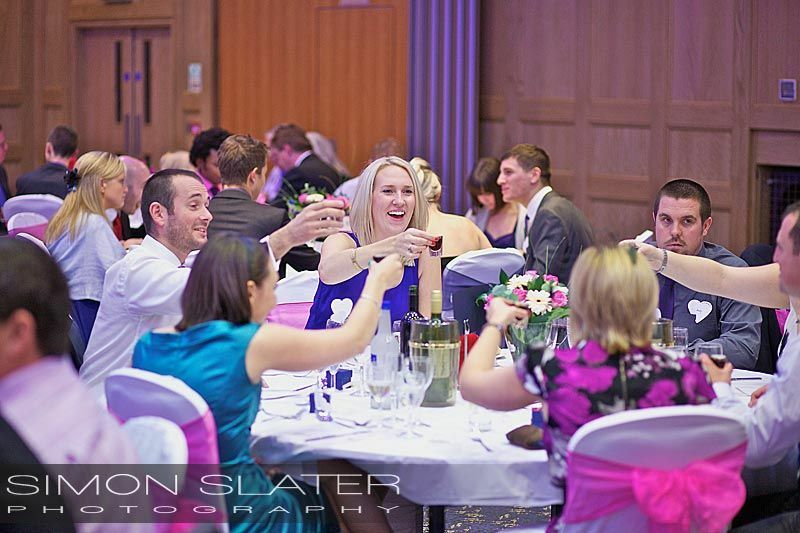 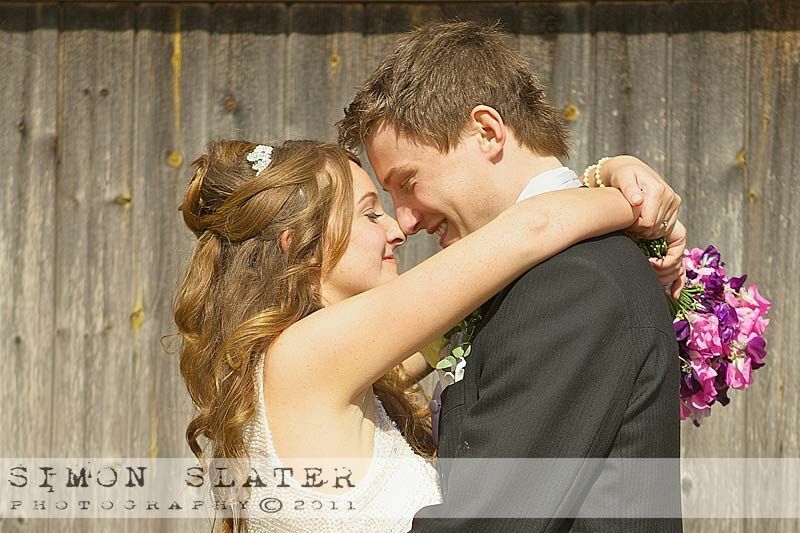 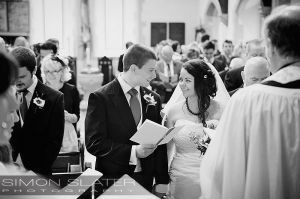 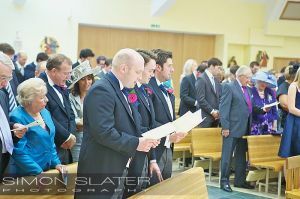 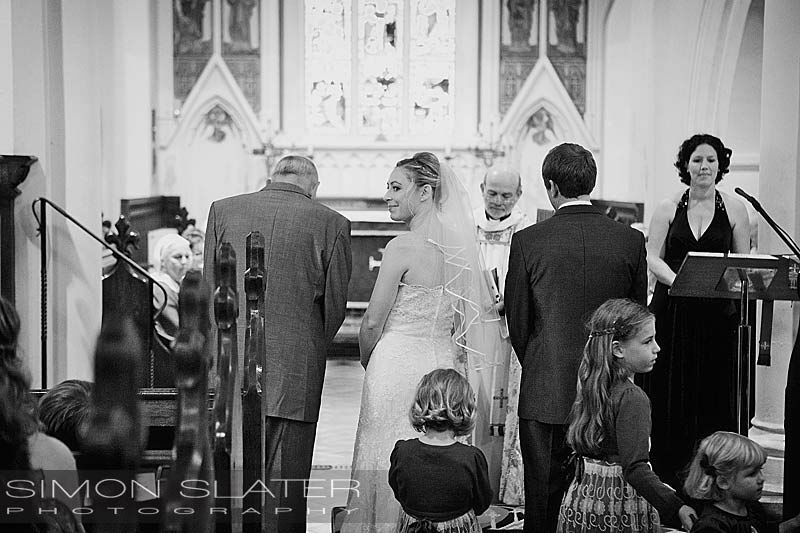 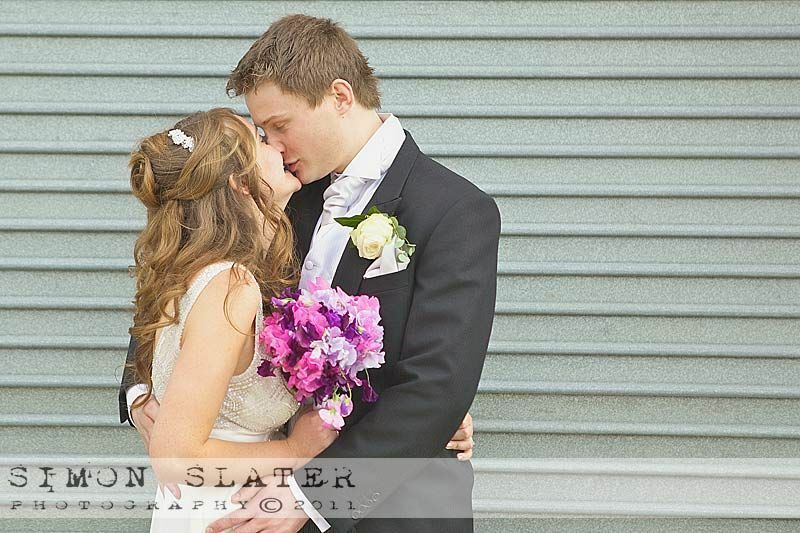 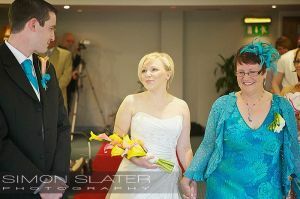 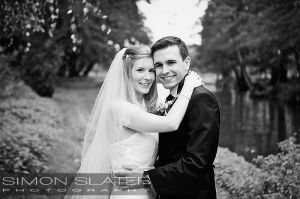 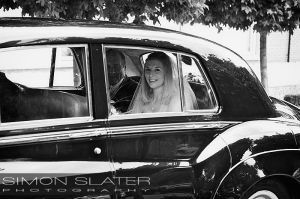 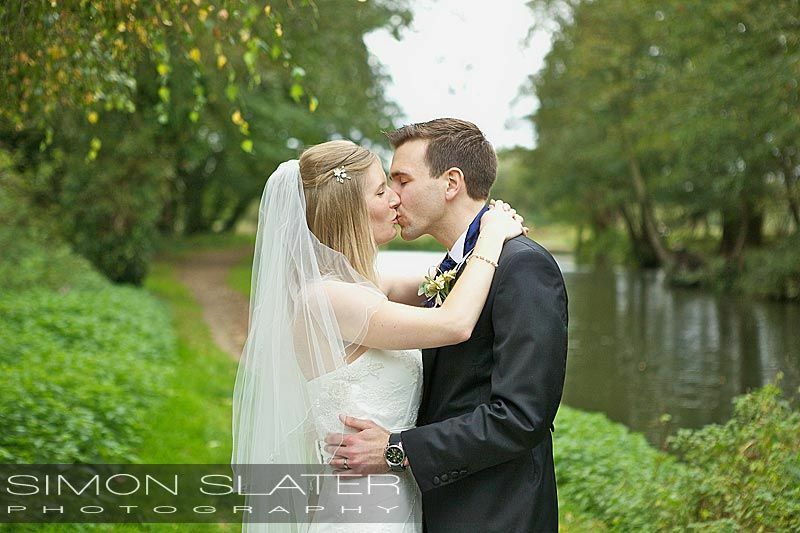 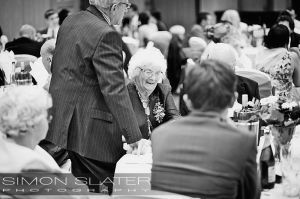 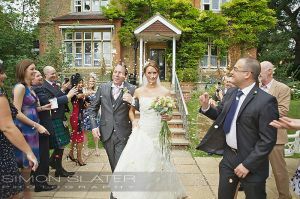 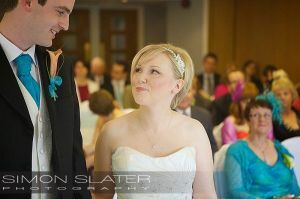 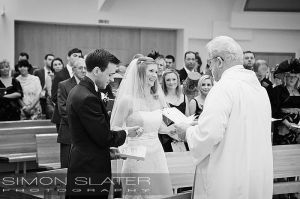 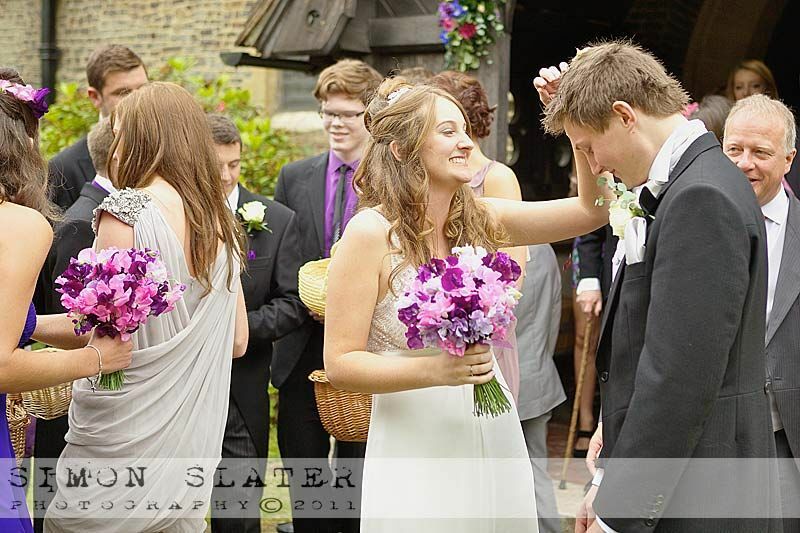 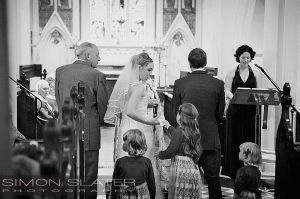 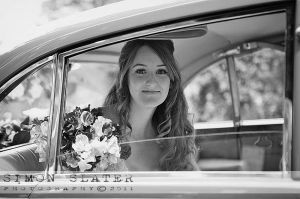 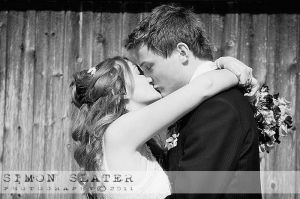 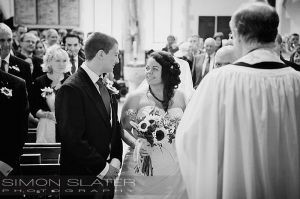 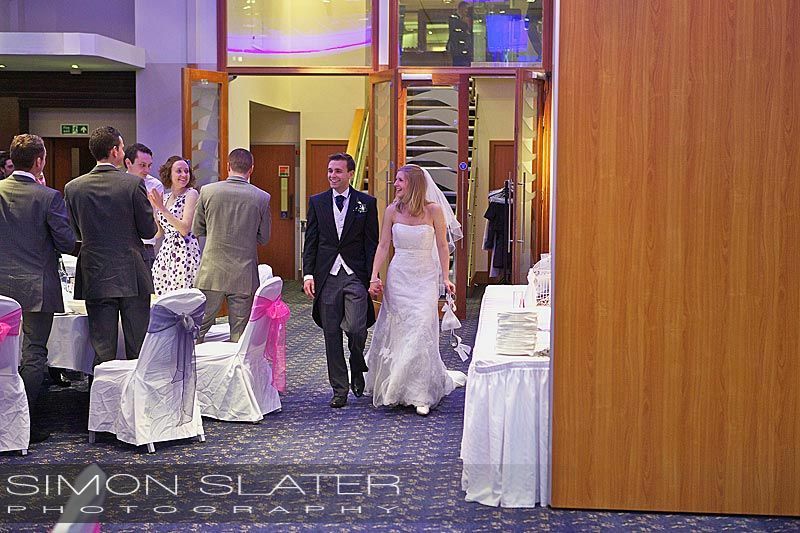 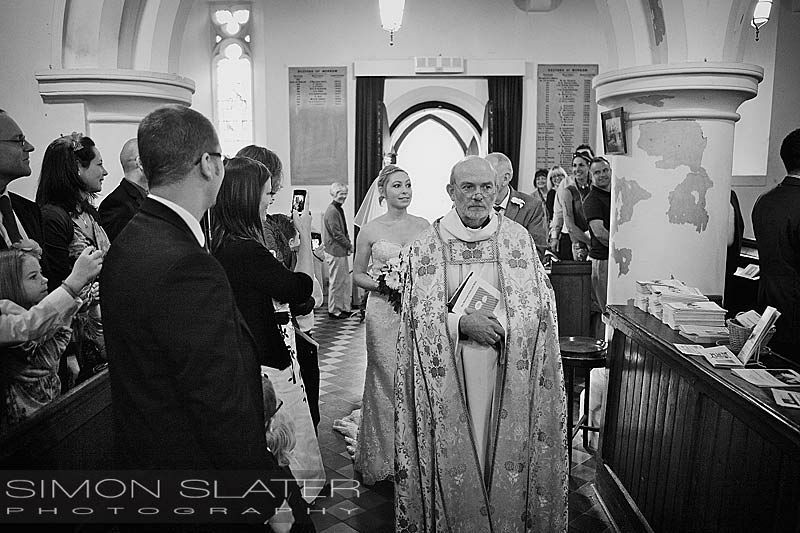 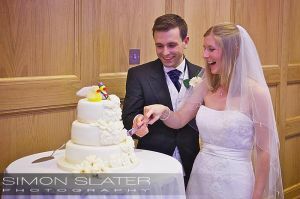 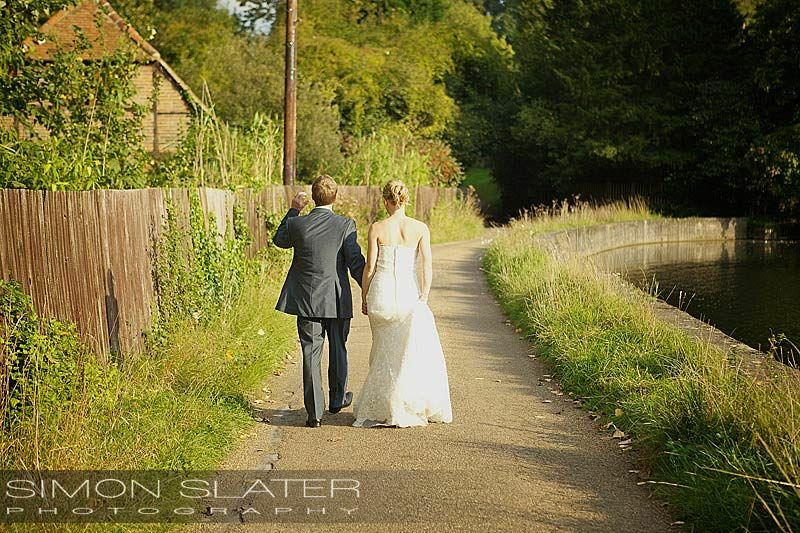 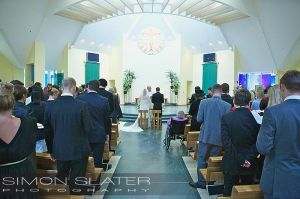 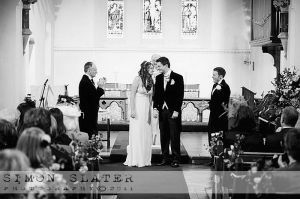 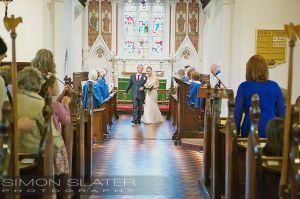 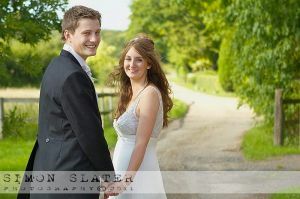 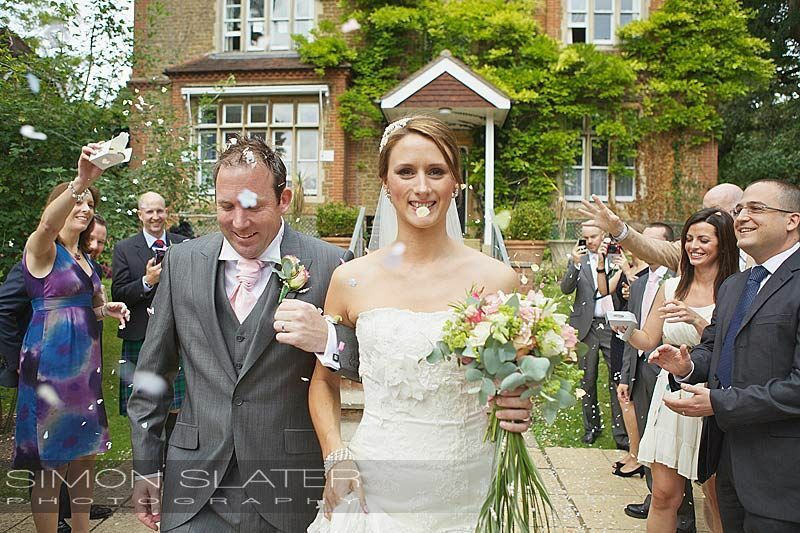 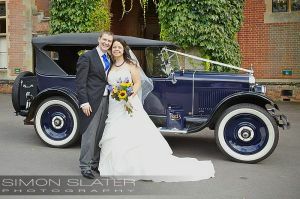 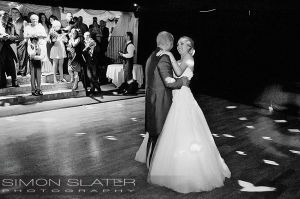 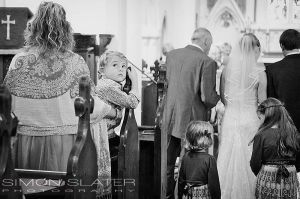 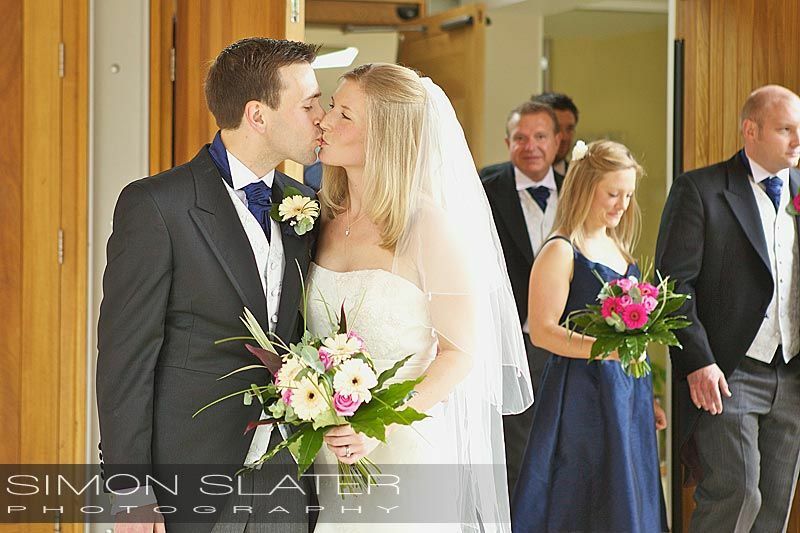 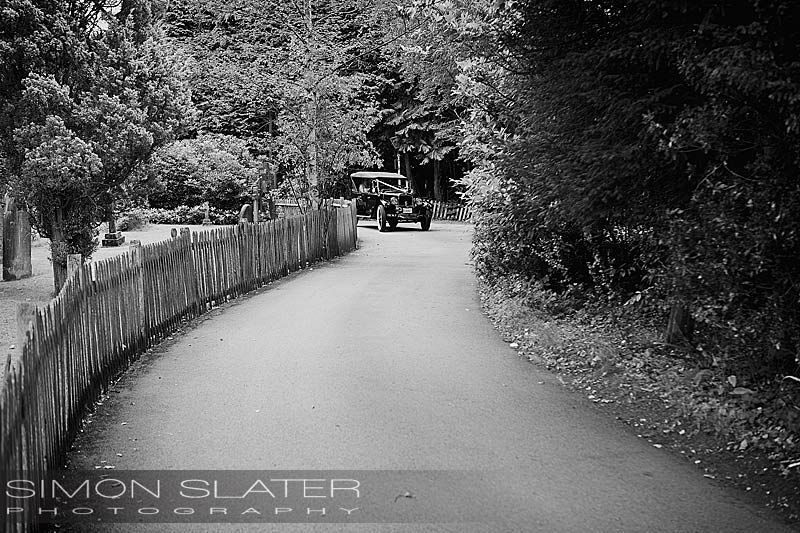 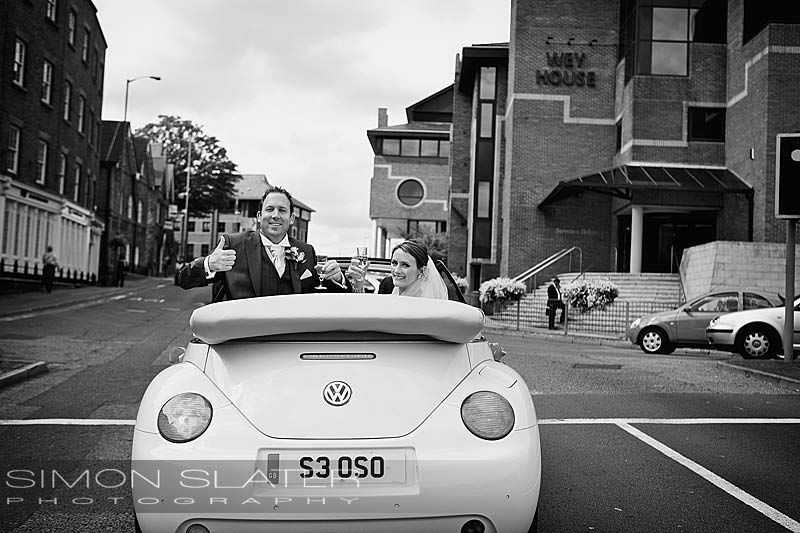 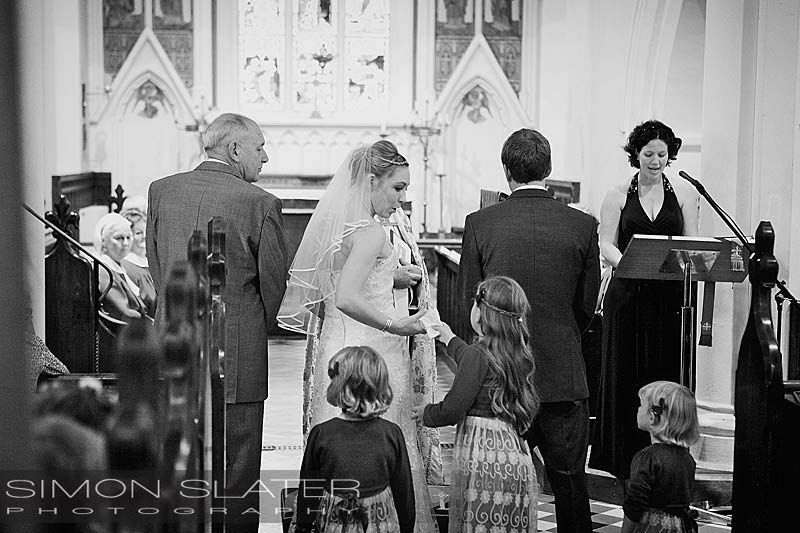 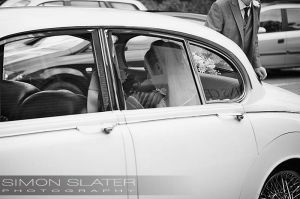 In the first week of October I had he pleasure of photographing Claire and Ben’s wedding in Woking and Guildford. 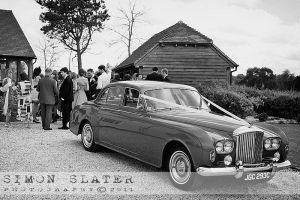 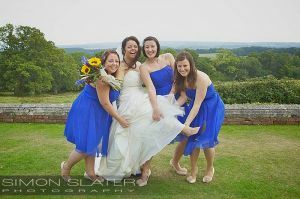 Claire got ready at the reception venue with the help of her bridesmaids before being driven to the church with her father in a classic oxford blue 1958 Bentley S1. 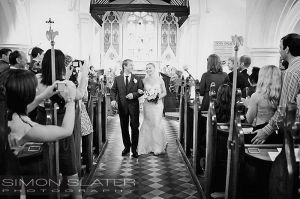 Claire and Ben were married in St. Dunstan’s Catholic Church in Woking, Surrey by 14:30hrs, Congratulations again to Mr & Mrs Goddard. 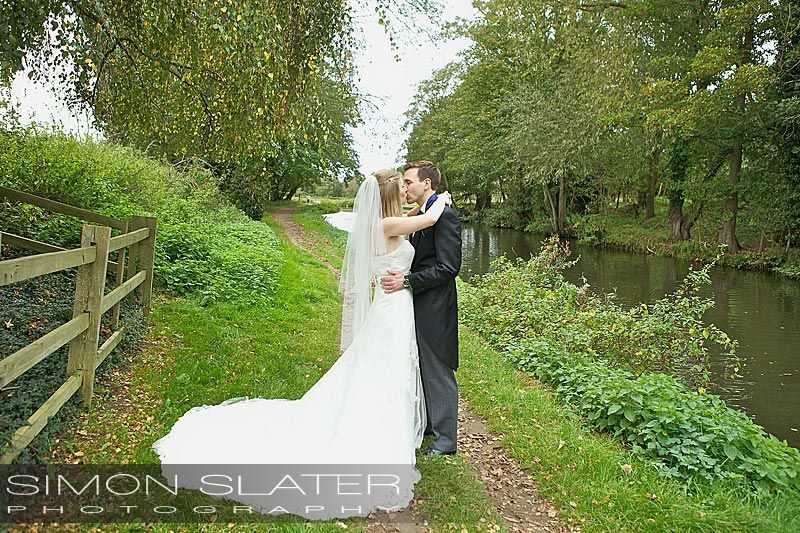 On route back to the Mandolay Hotel in Guildford, Surrey we had the chance to stop off near Bower’s Mill for a few photos by the River Wey. 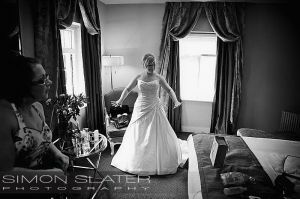 It was also a chance for the newlyweds to have some time together before heading to the reception venue where all the guests were waiting. 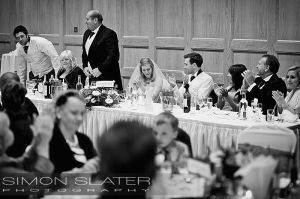 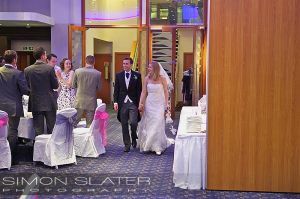 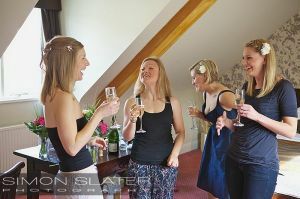 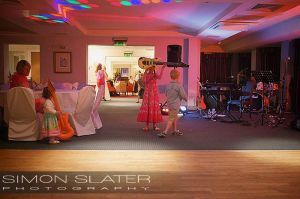 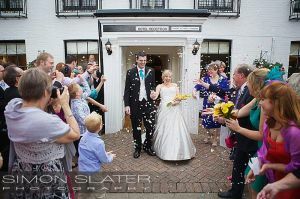 Claire and Ben were greeted by the wedding party, family and friends in the Mandolay Hotel for a champagne reception and canapes. 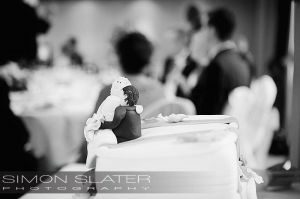 The wedding reception, speeches, cutting of the cake, first dance and evening celebrations were all held in the Mandolay Hotel and probably in to the early hours of Sunday morning. 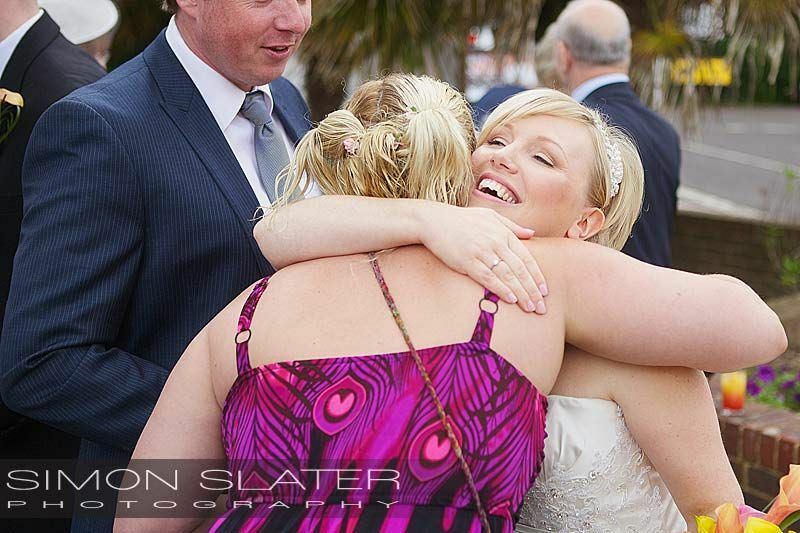 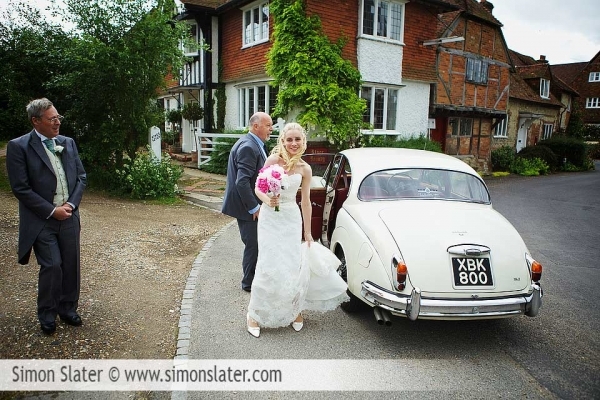 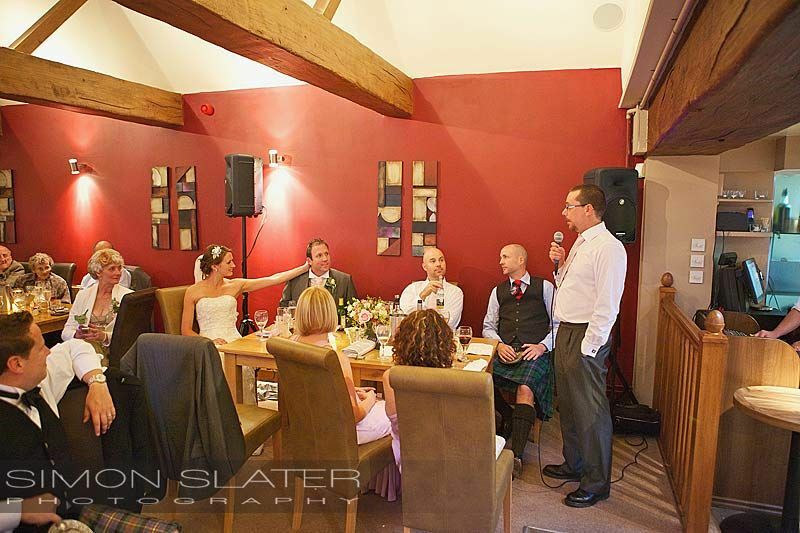 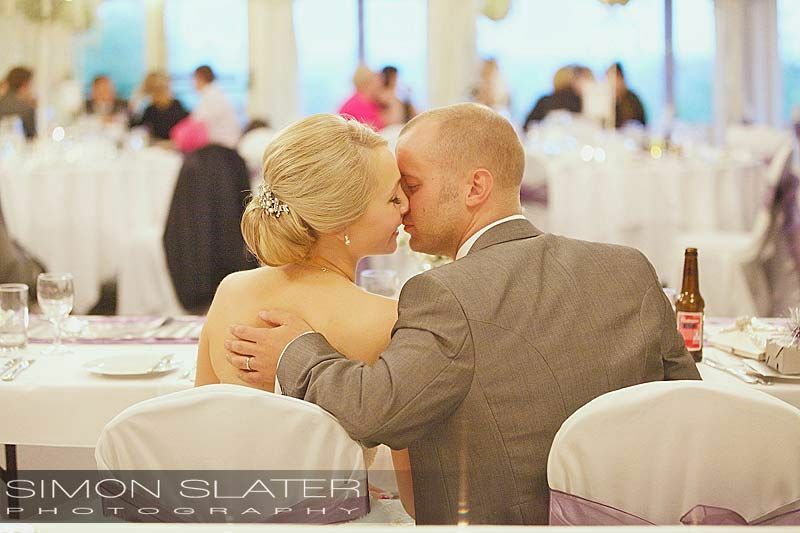 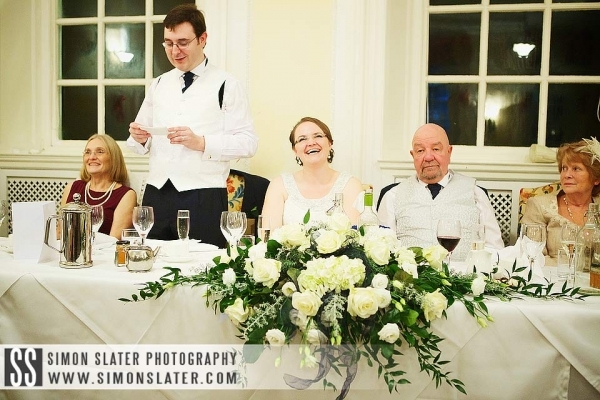 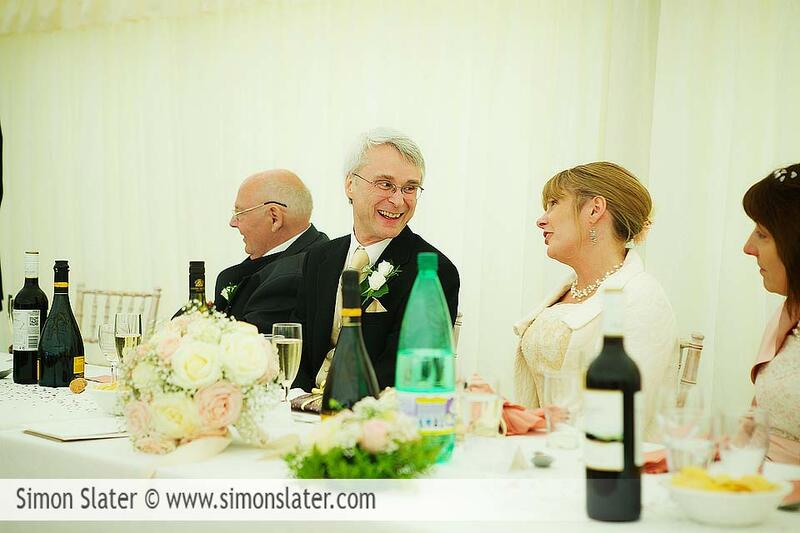 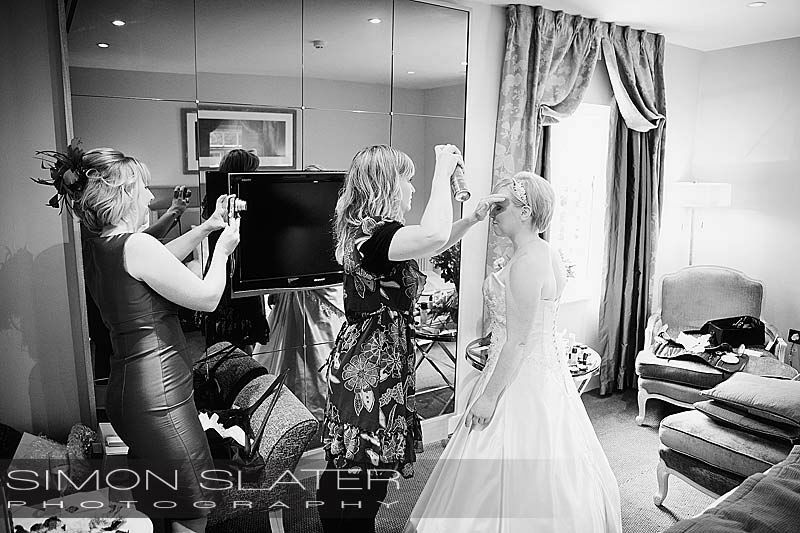 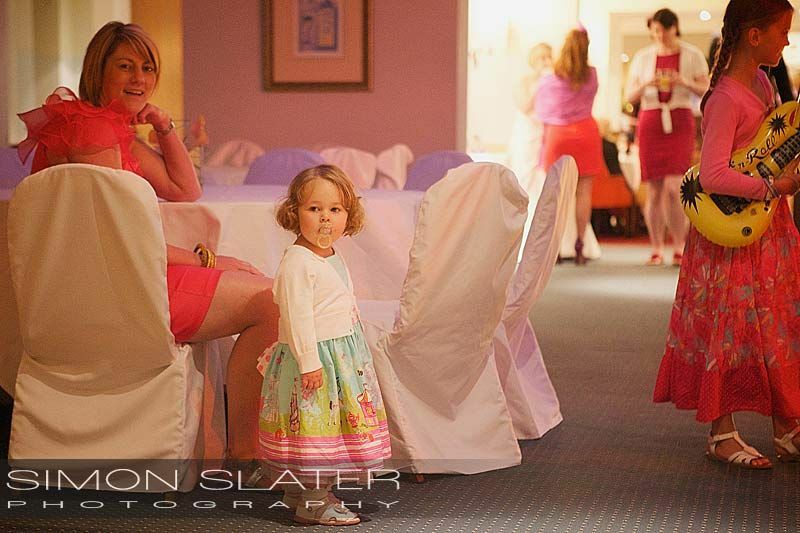 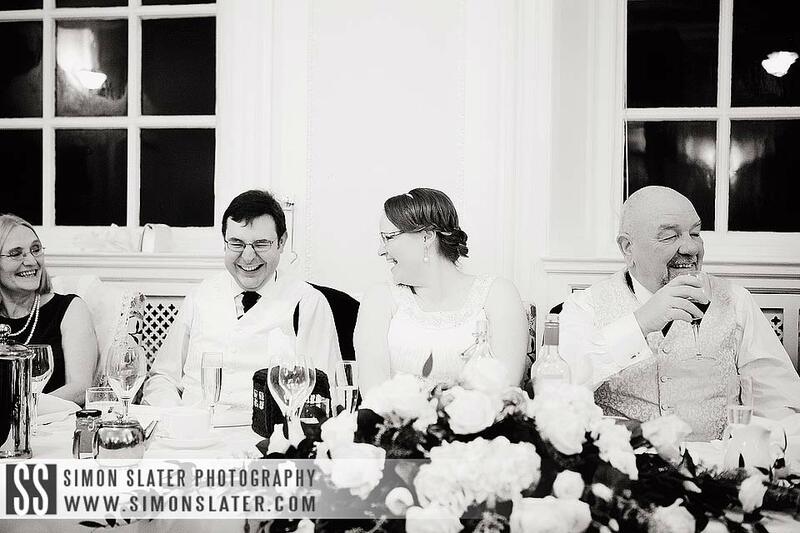 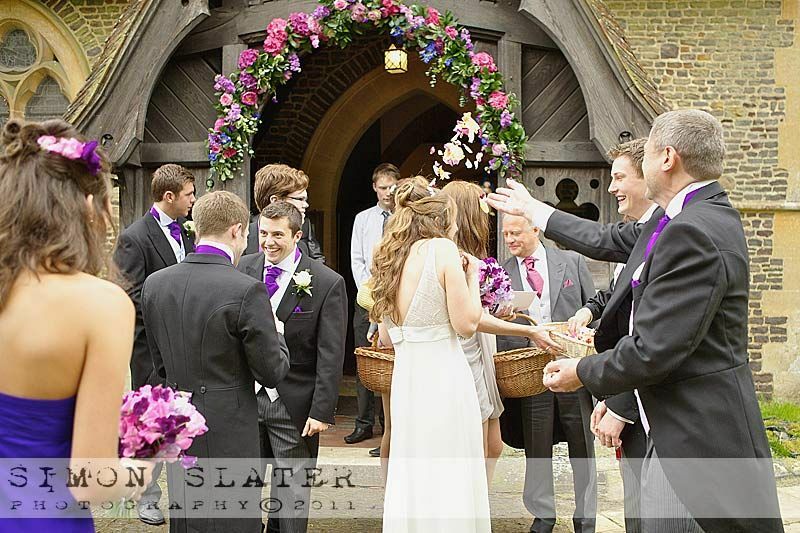 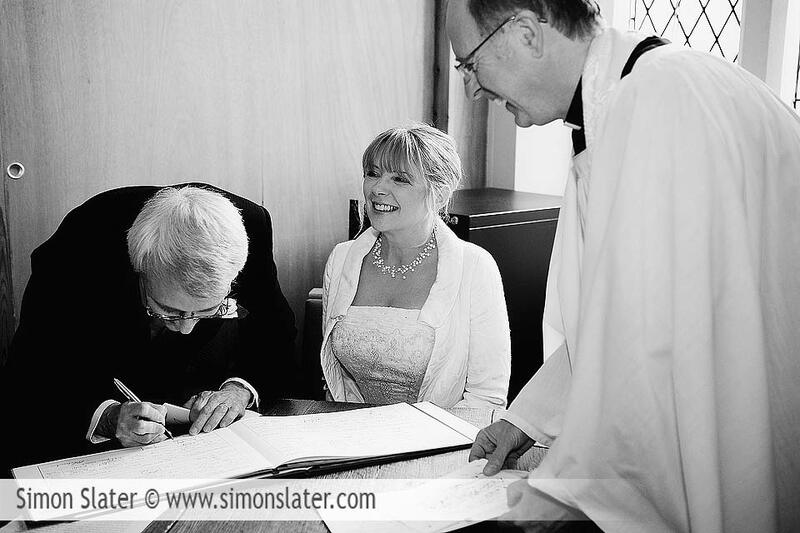 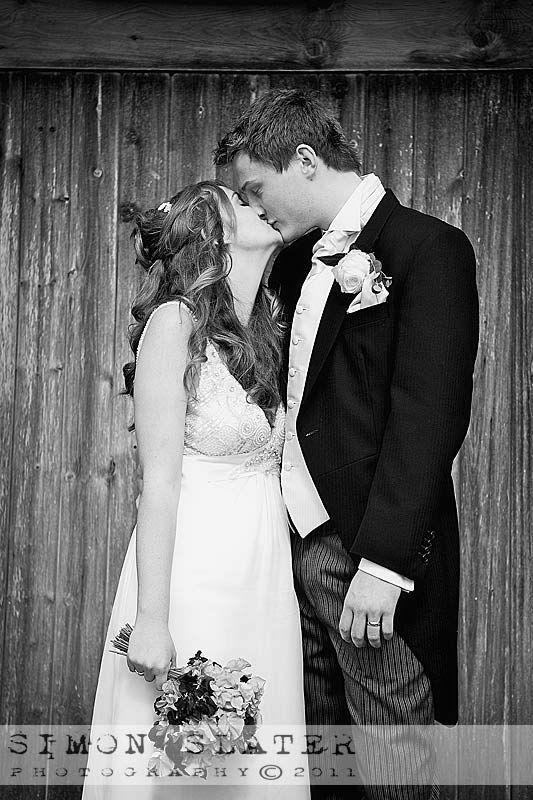 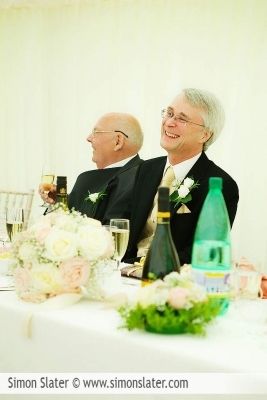 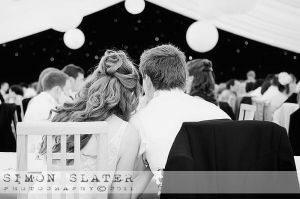 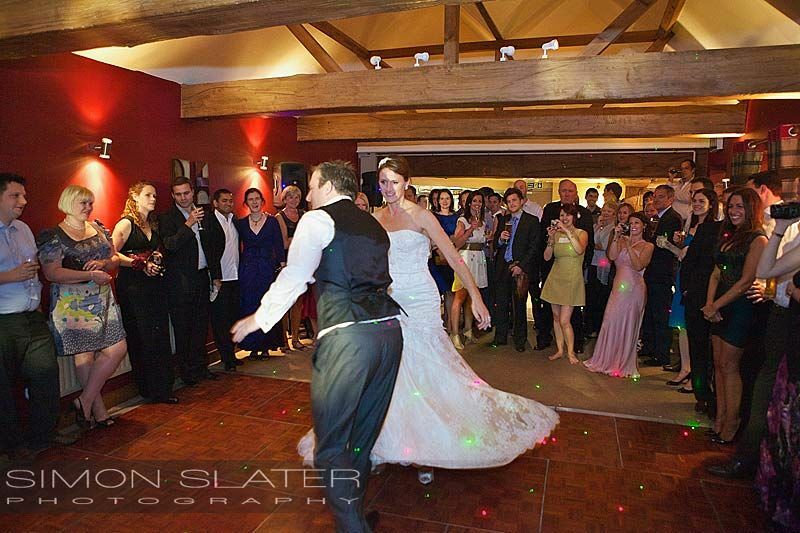 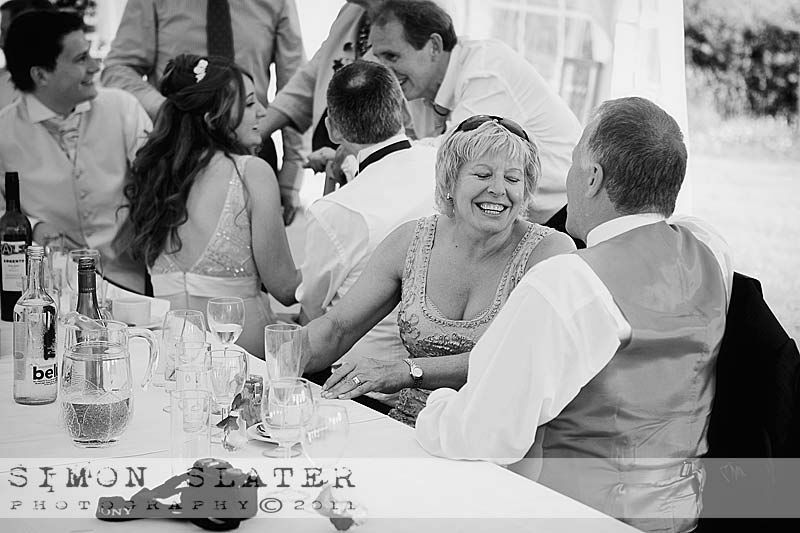 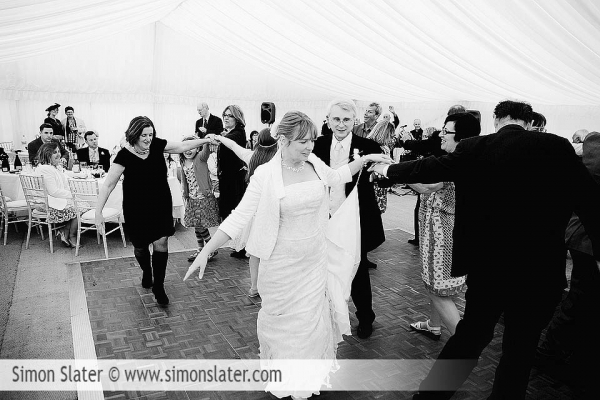 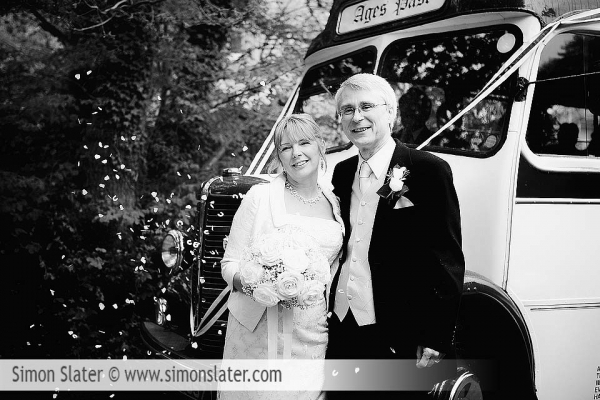 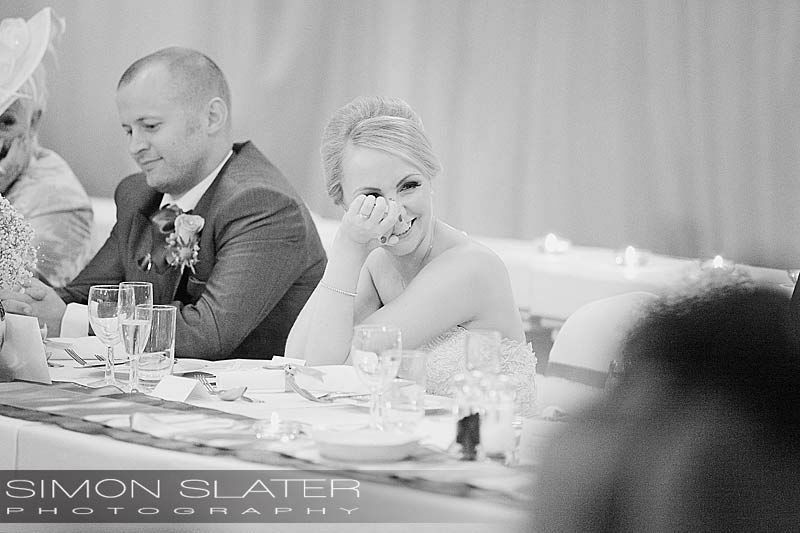 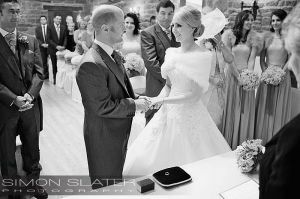 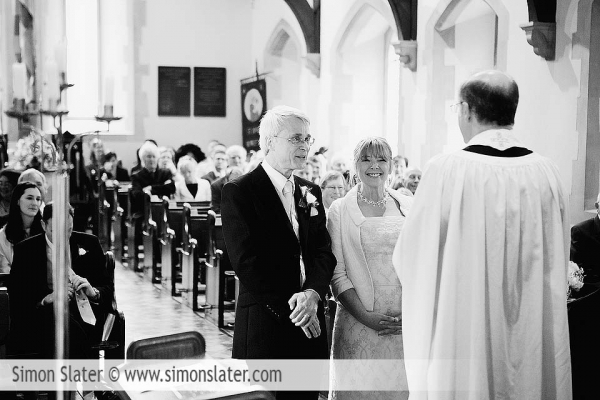 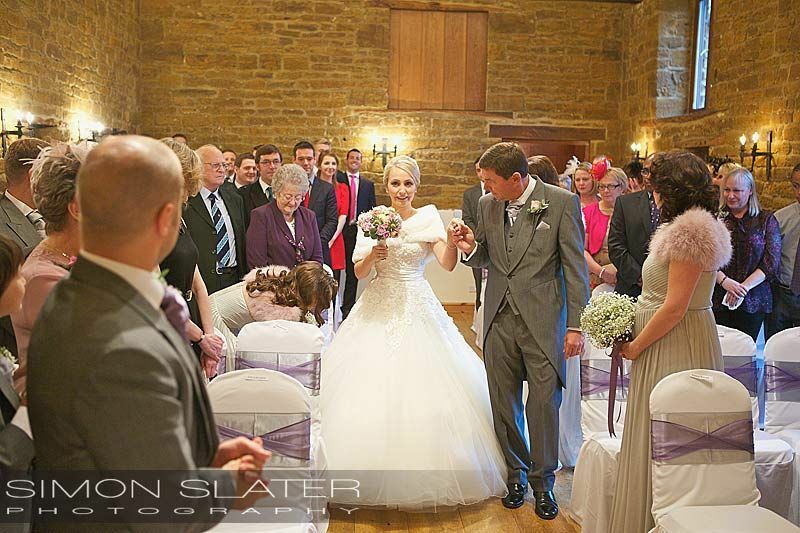 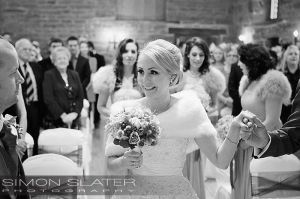 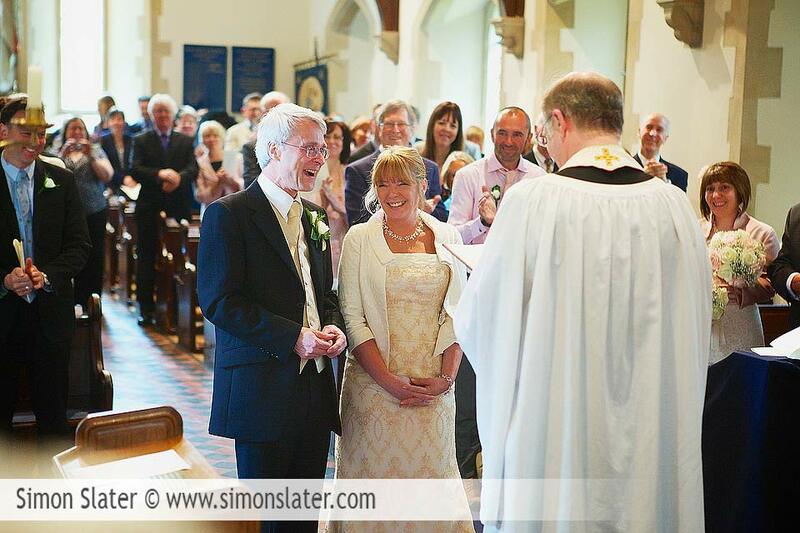 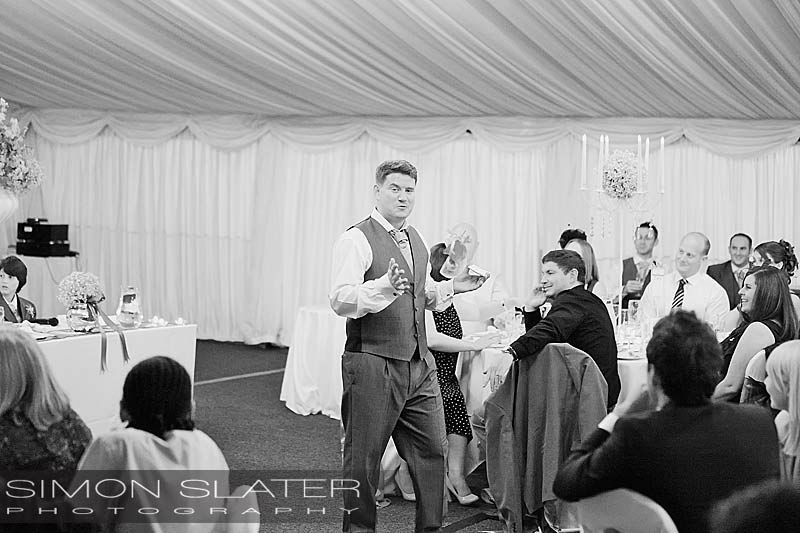 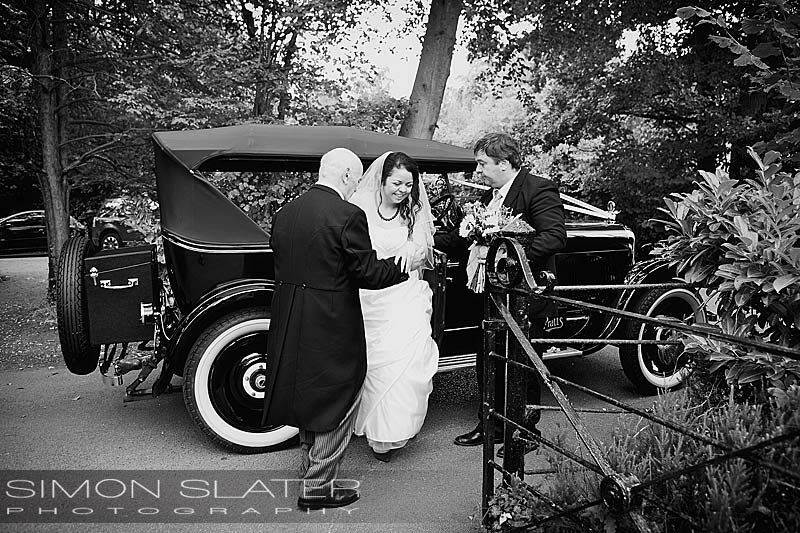 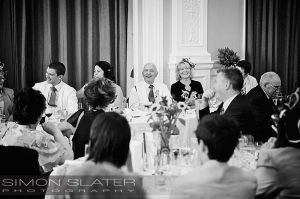 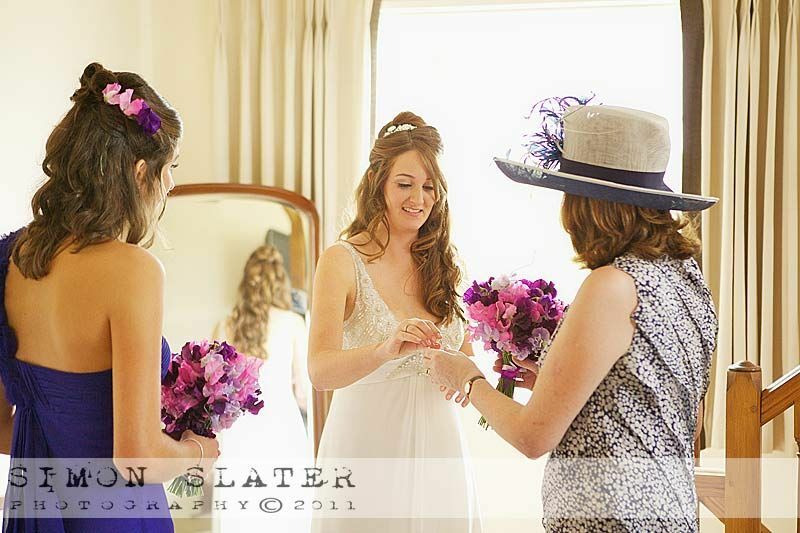 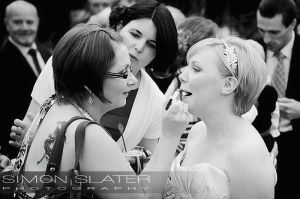 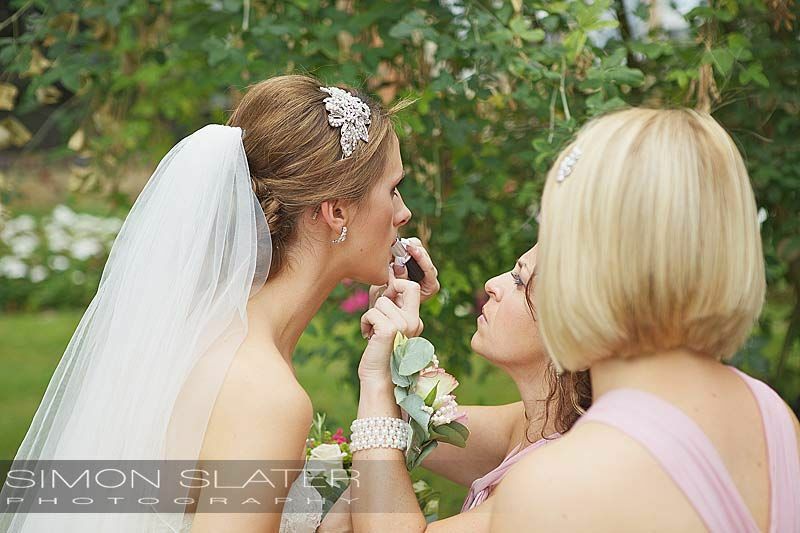 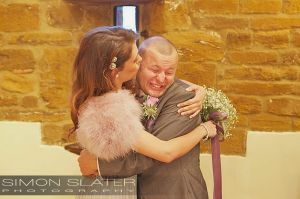 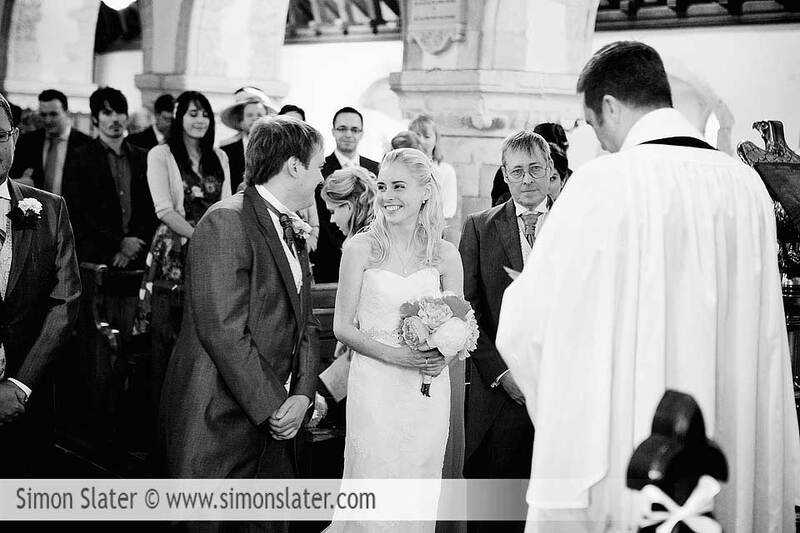 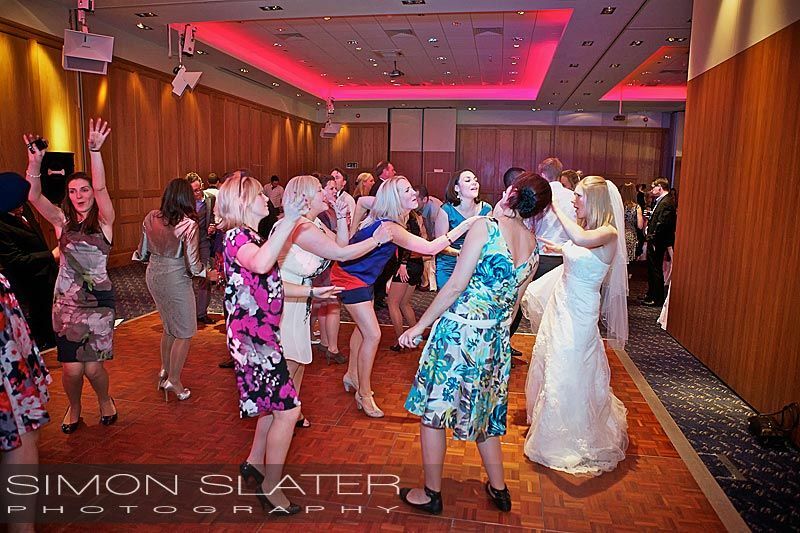 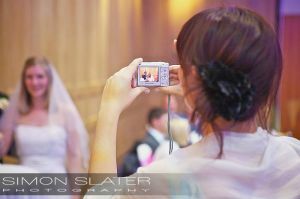 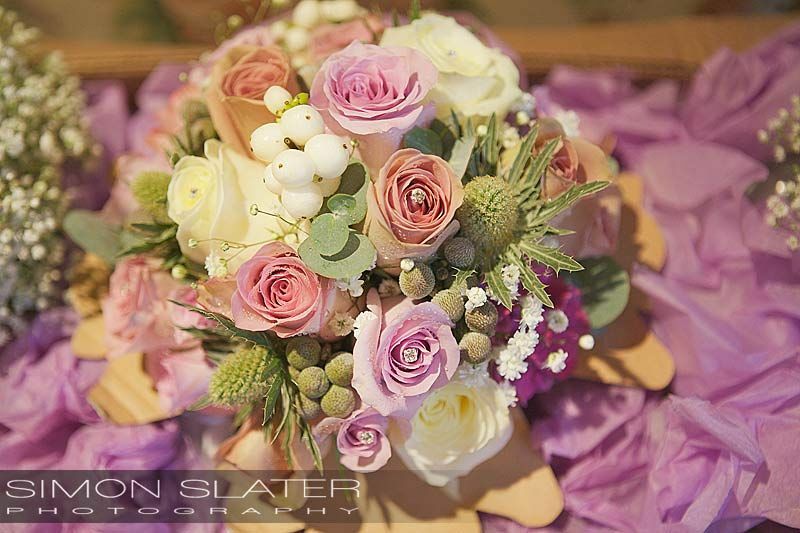 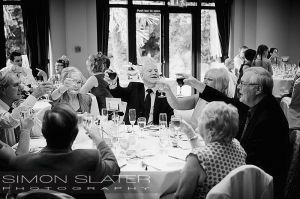 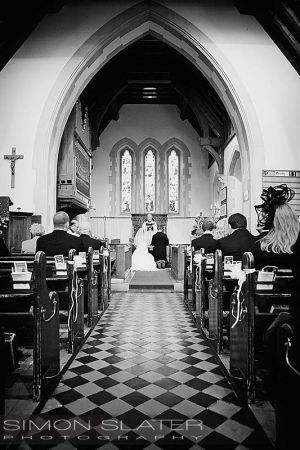 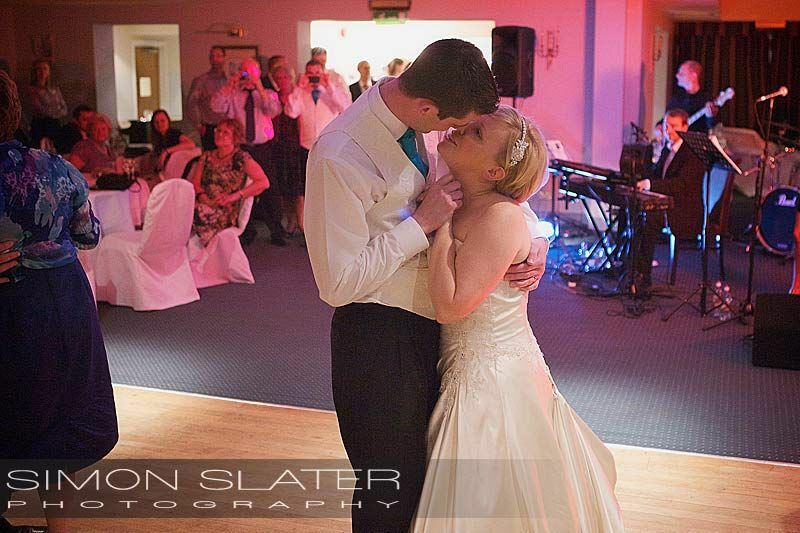 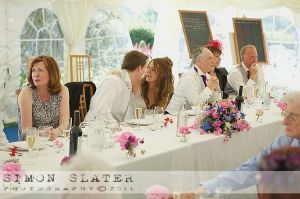 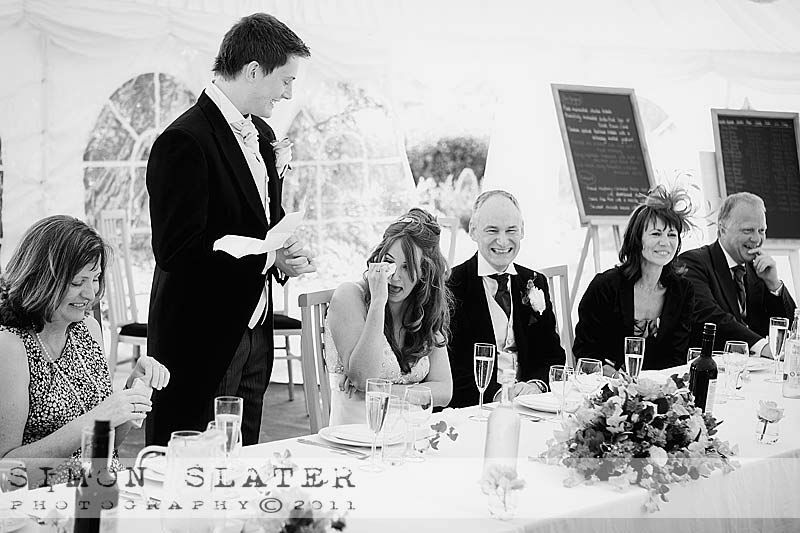 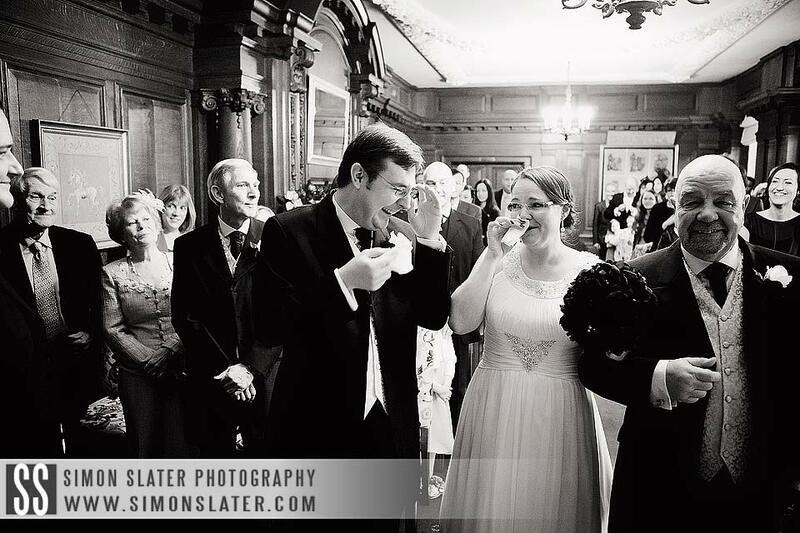 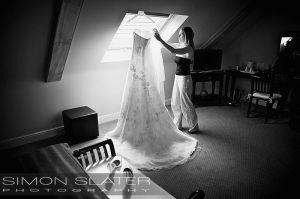 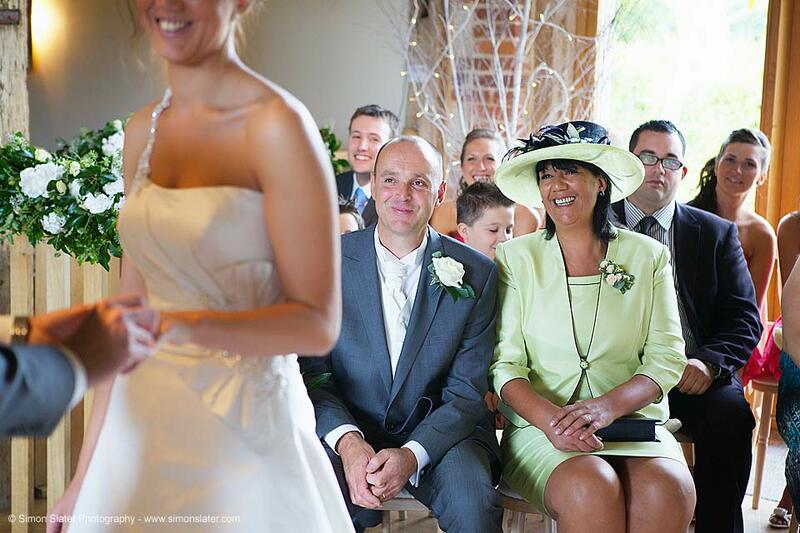 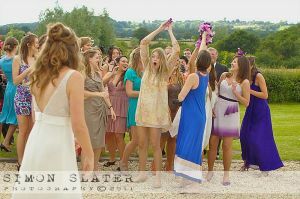 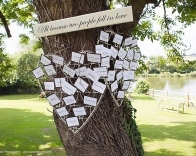 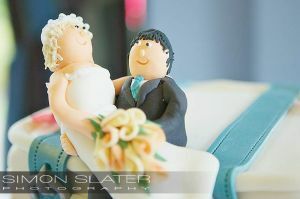 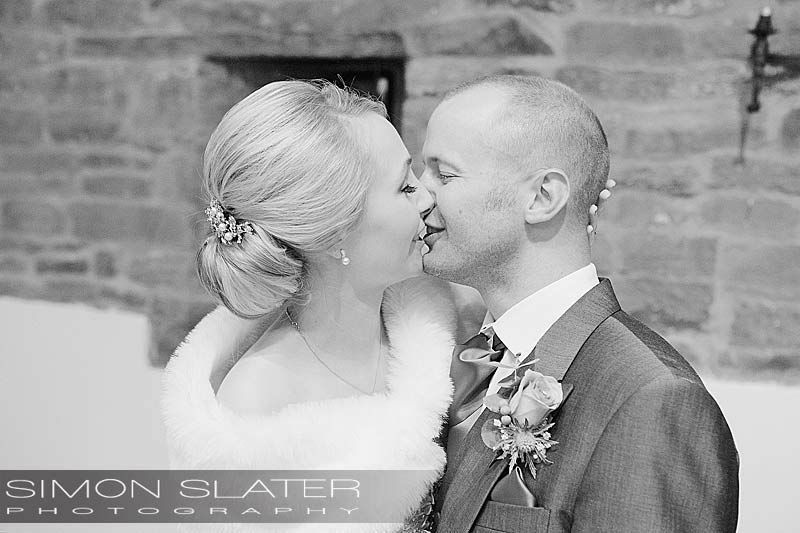 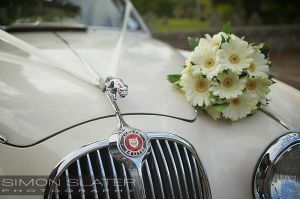 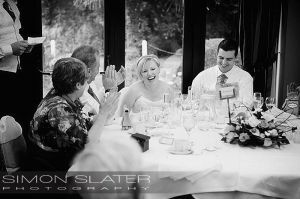 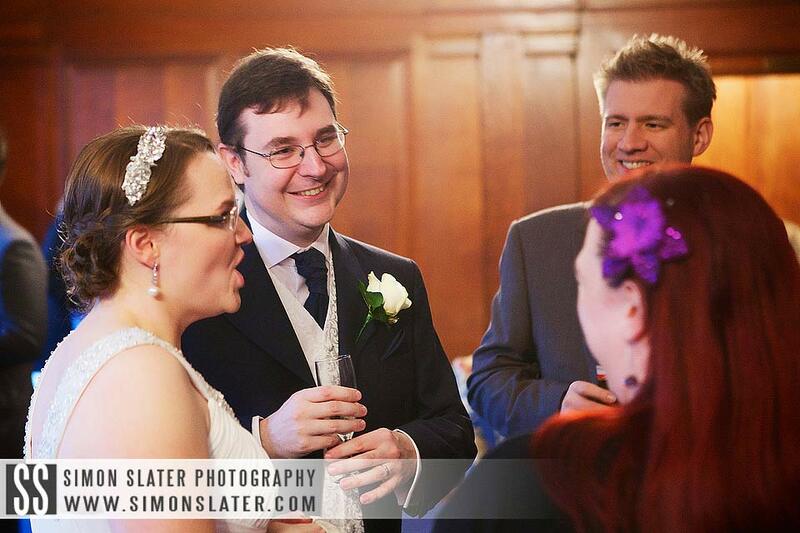 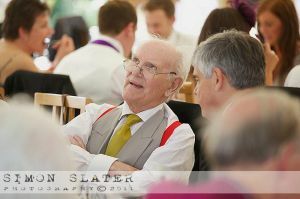 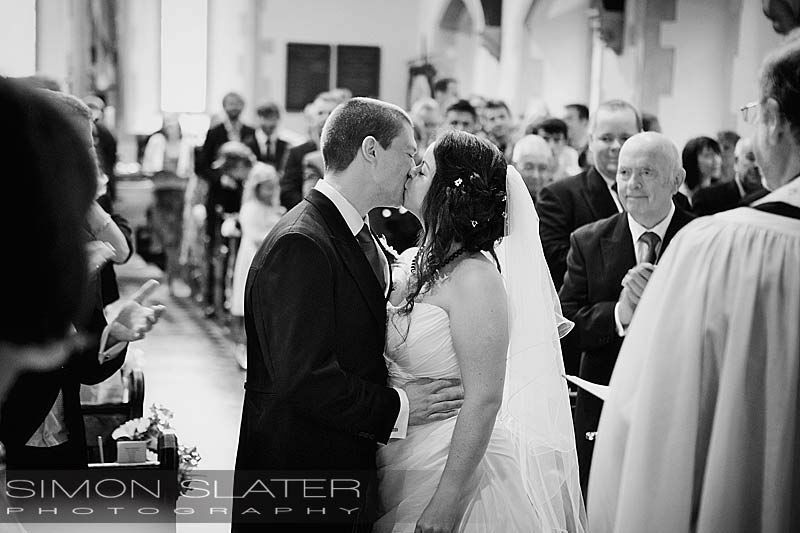 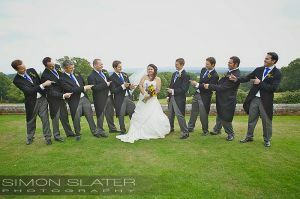 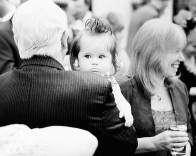 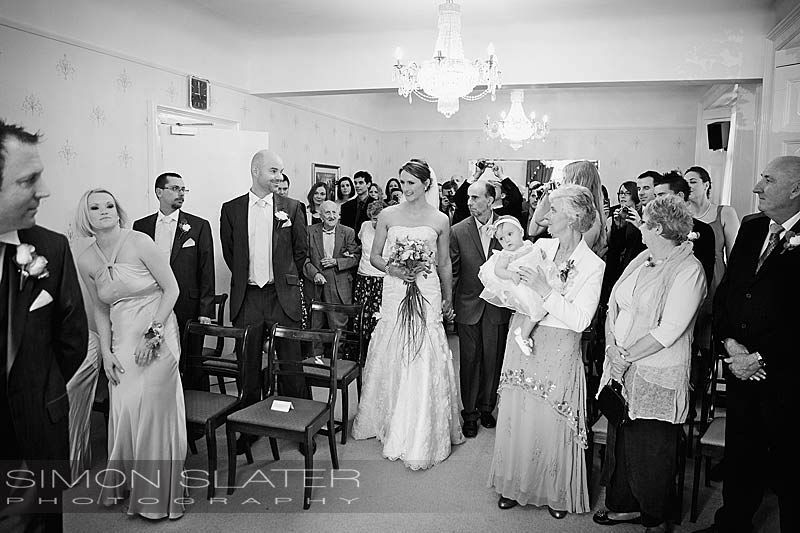 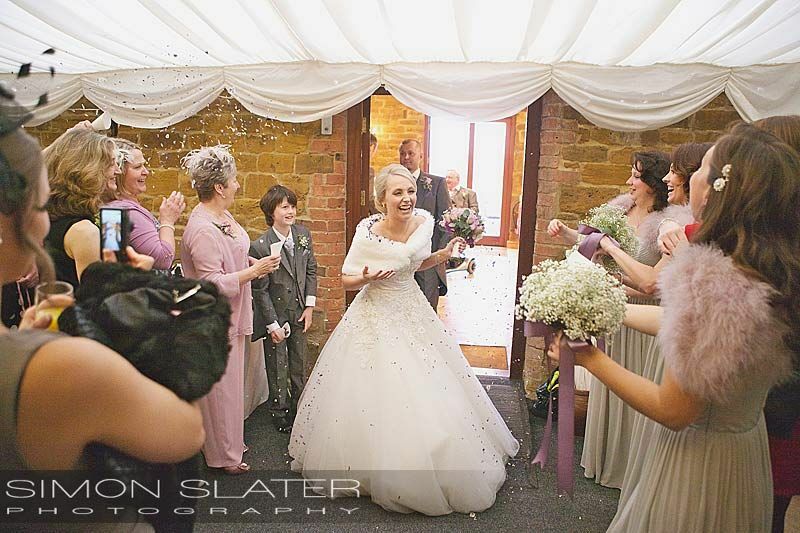 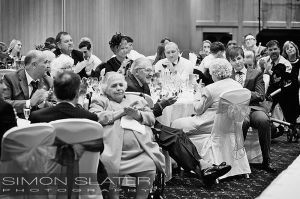 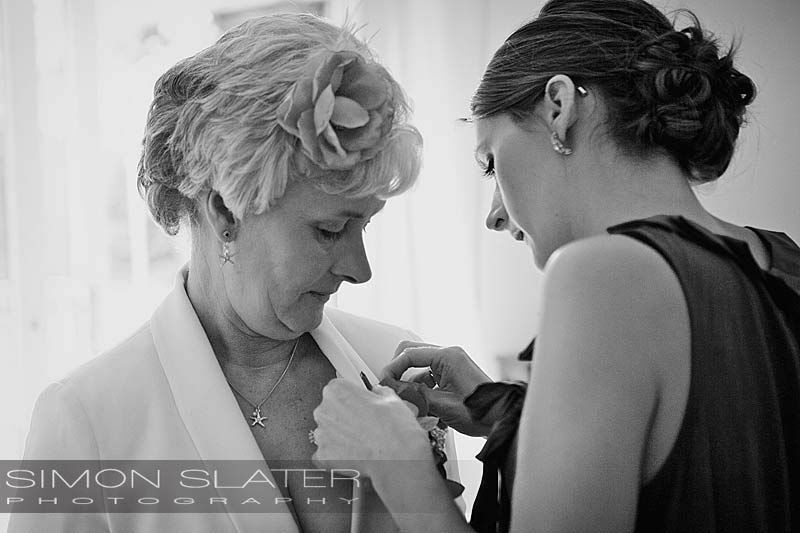 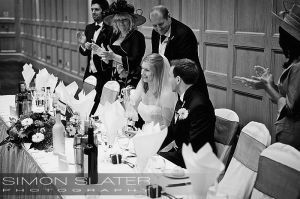 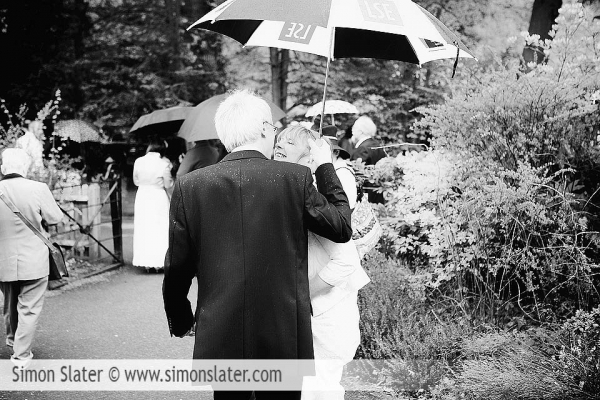 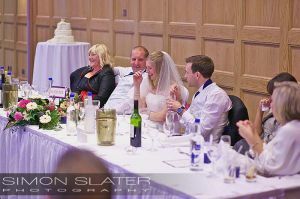 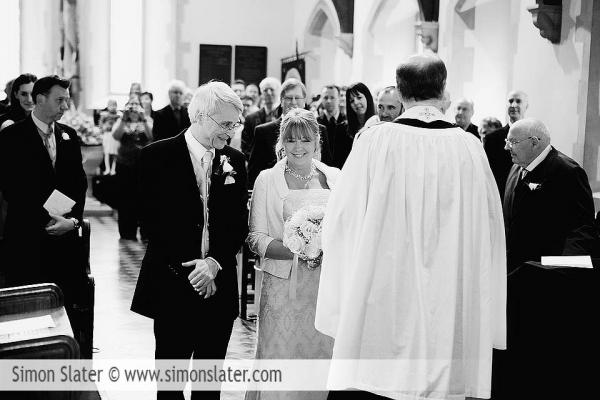 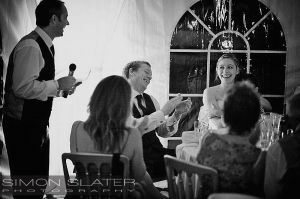 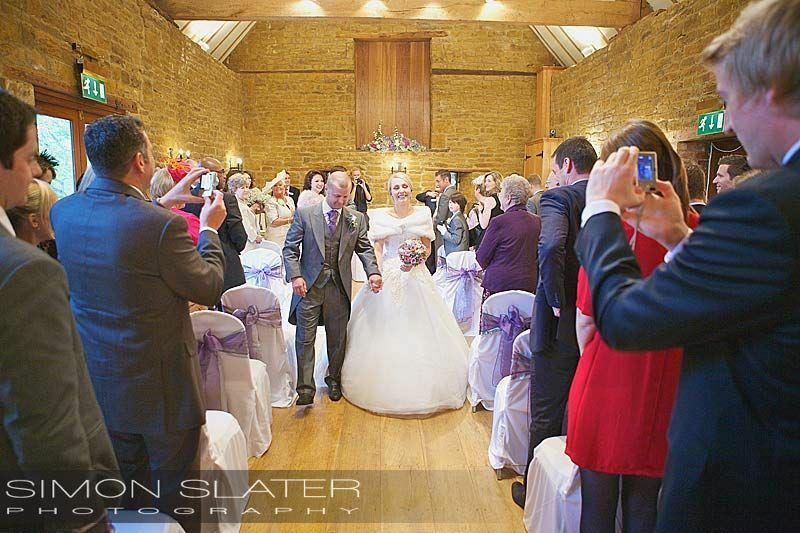 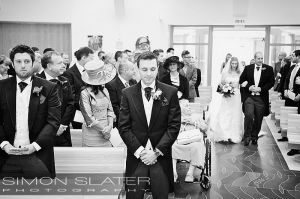 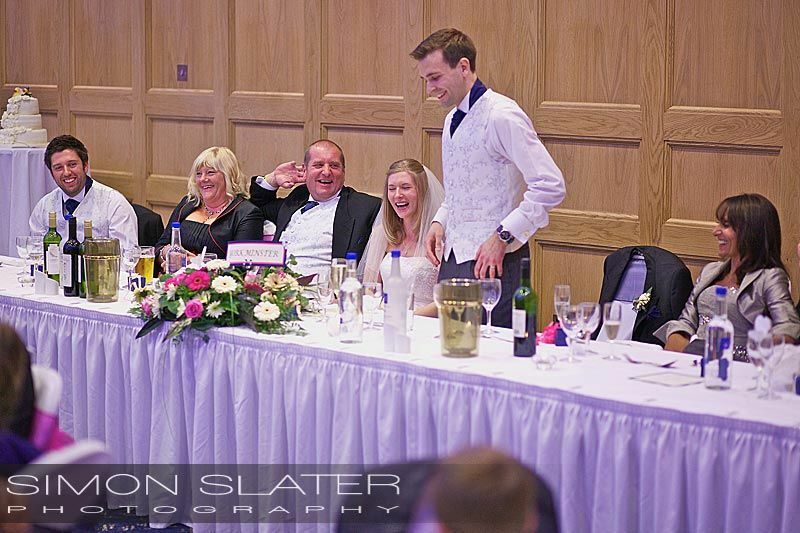 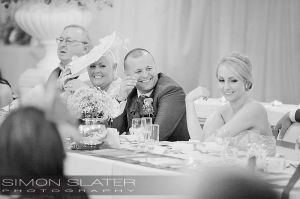 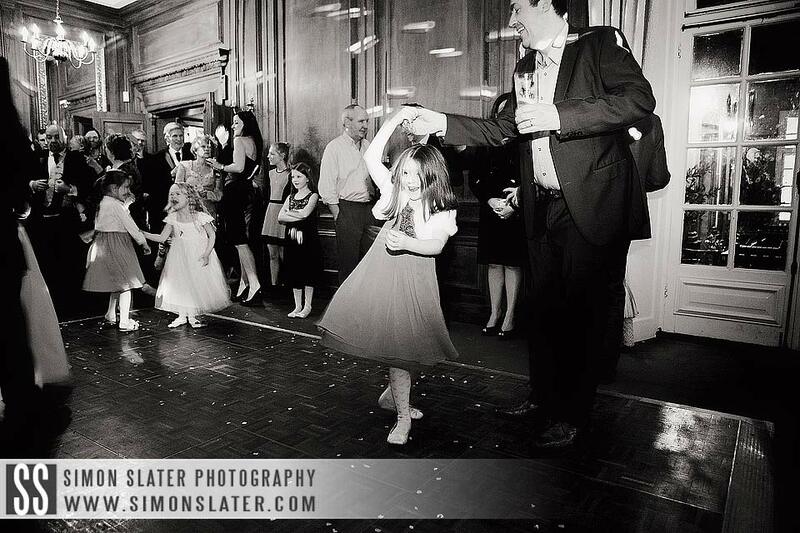 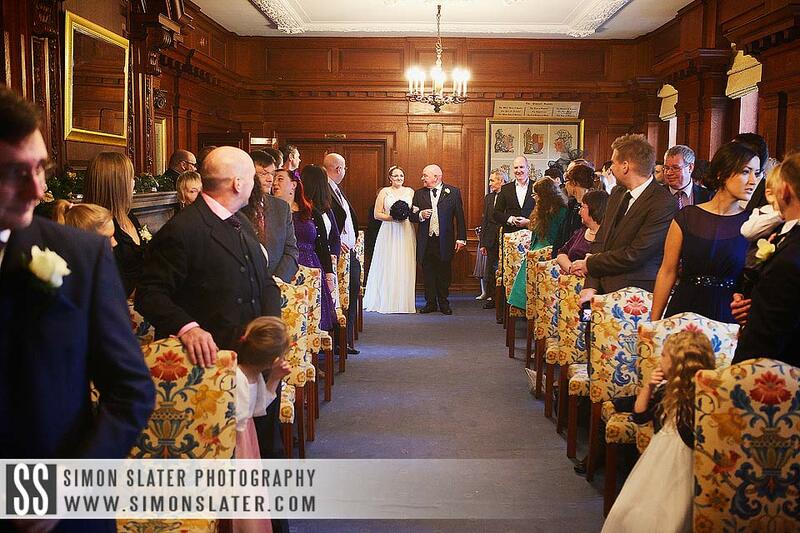 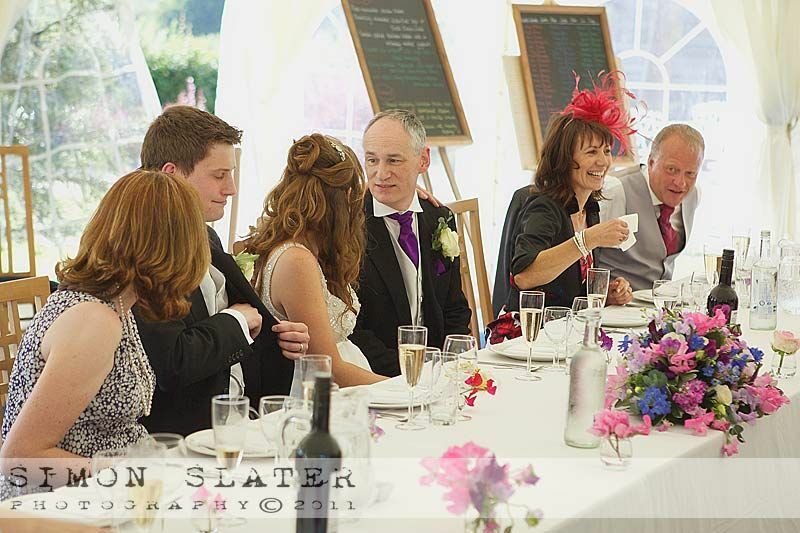 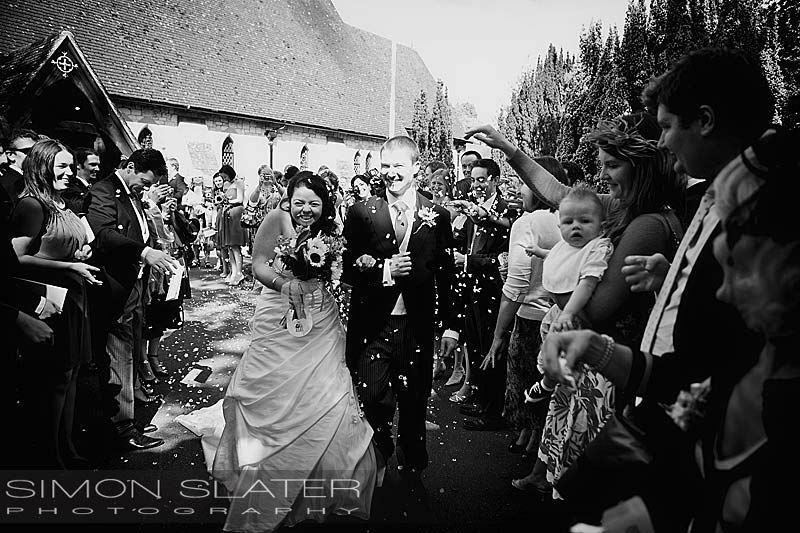 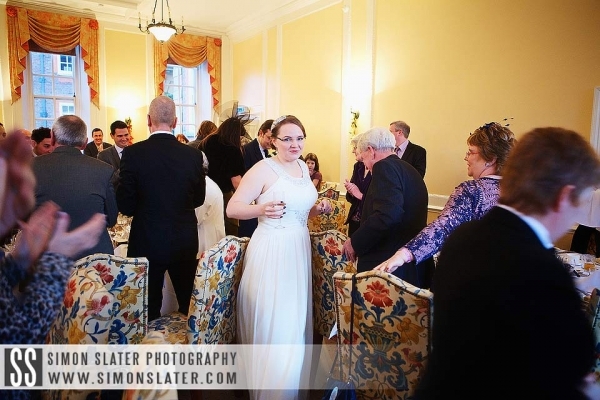 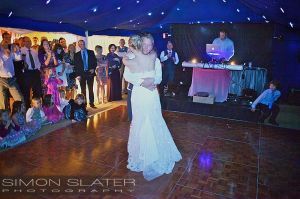 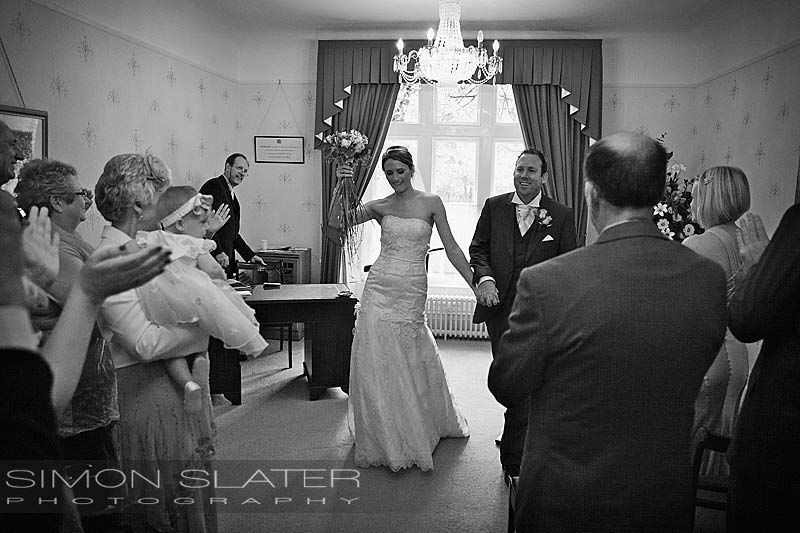 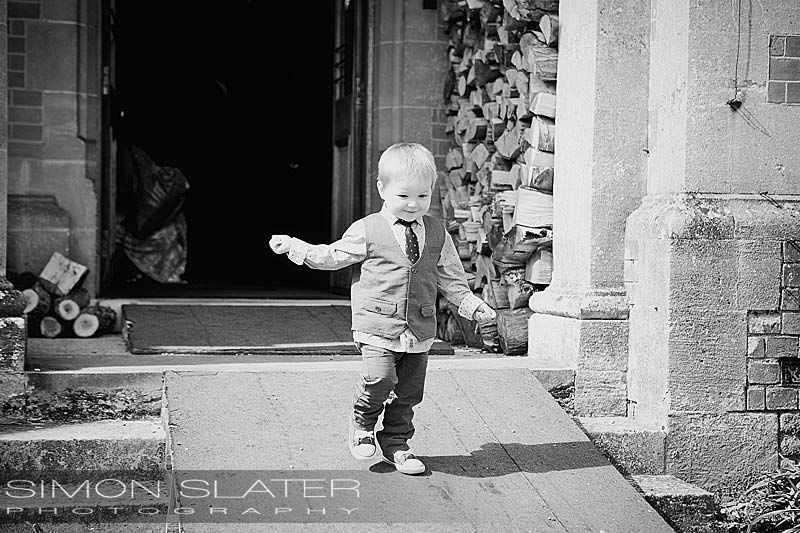 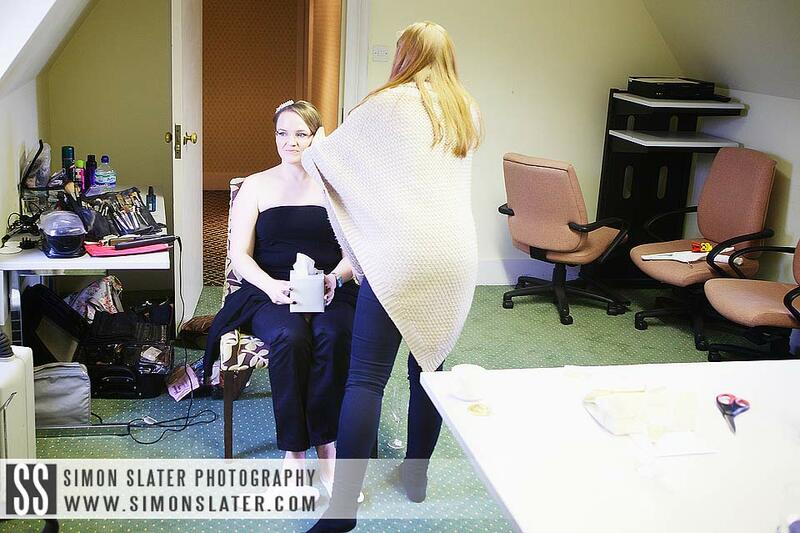 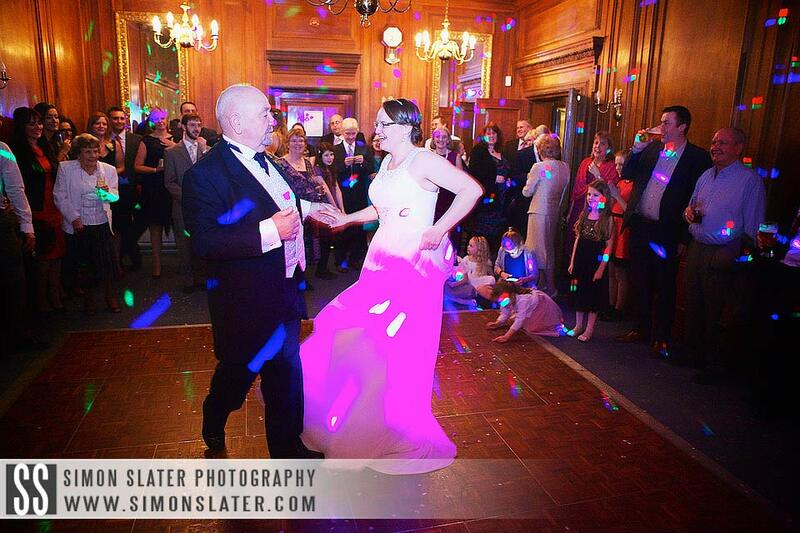 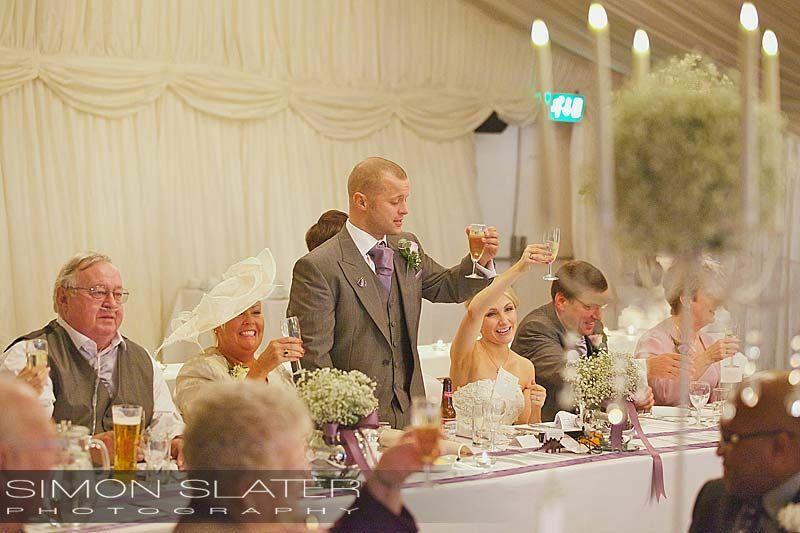 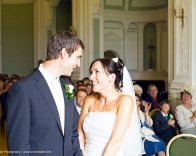 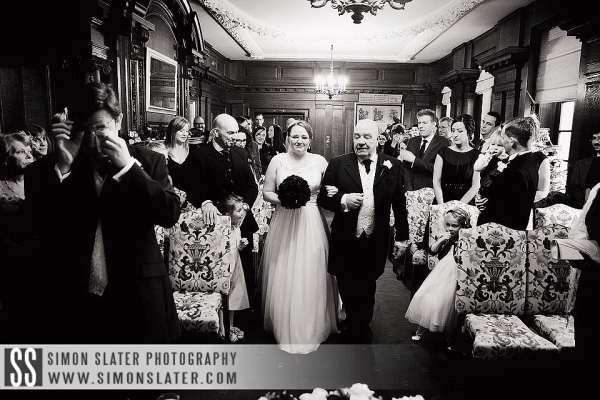 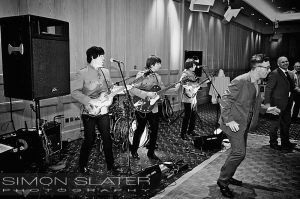 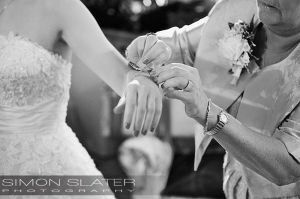 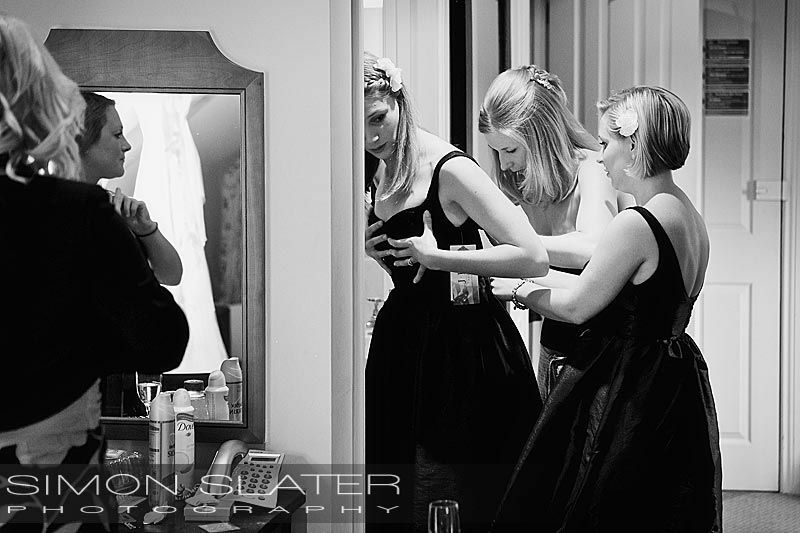 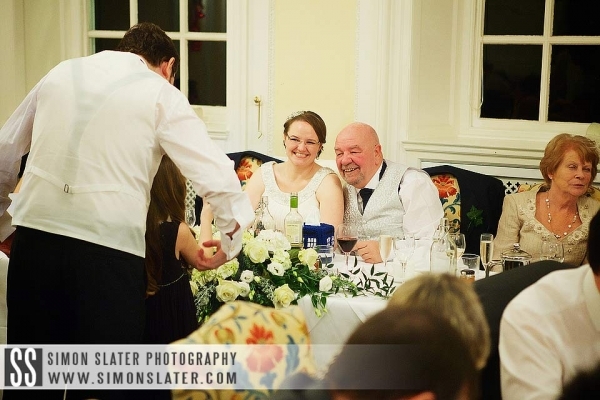 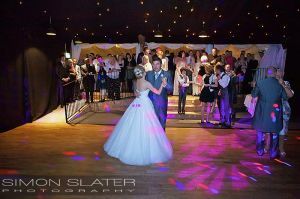 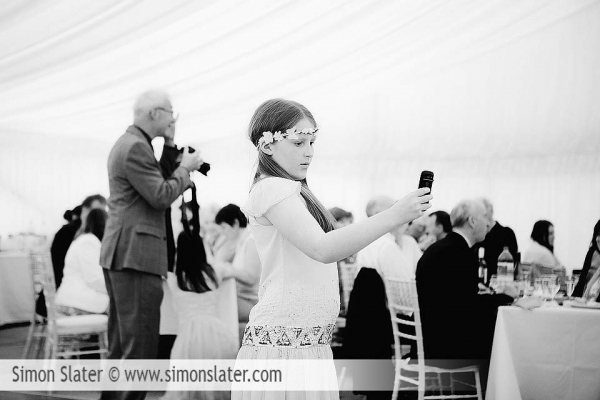 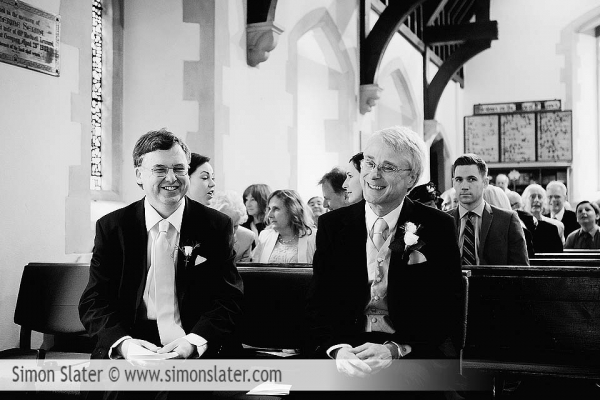 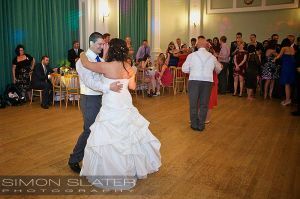 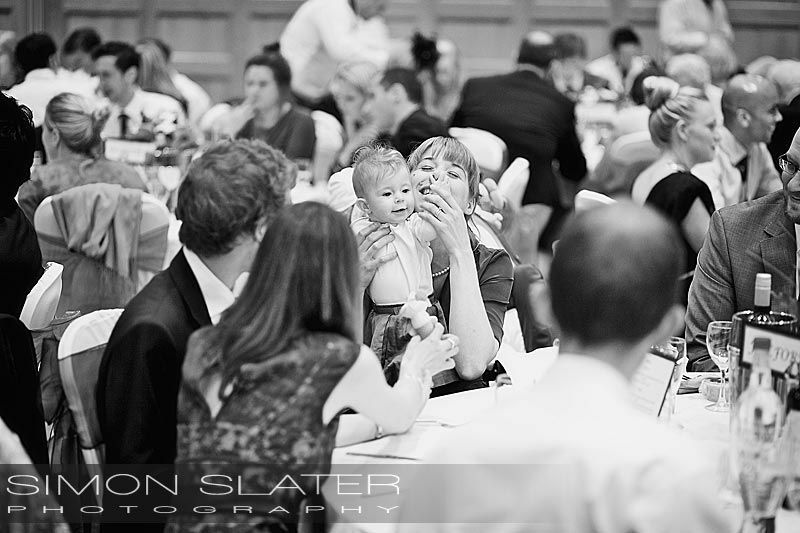 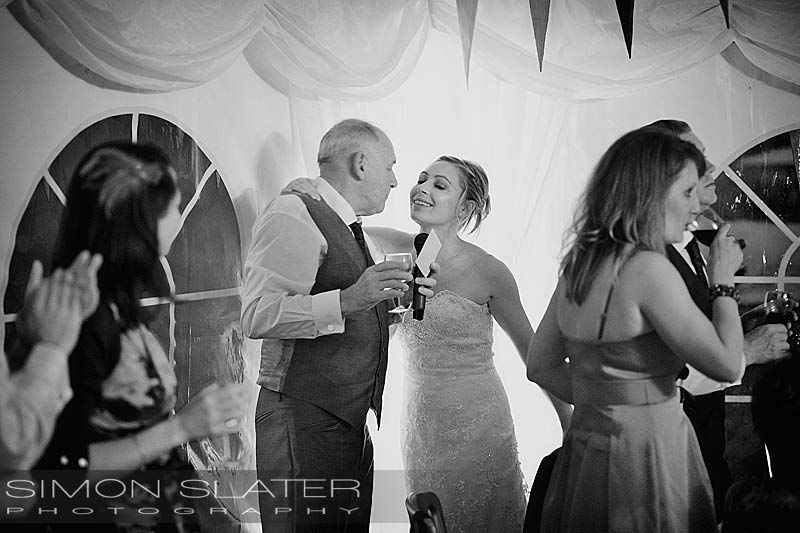 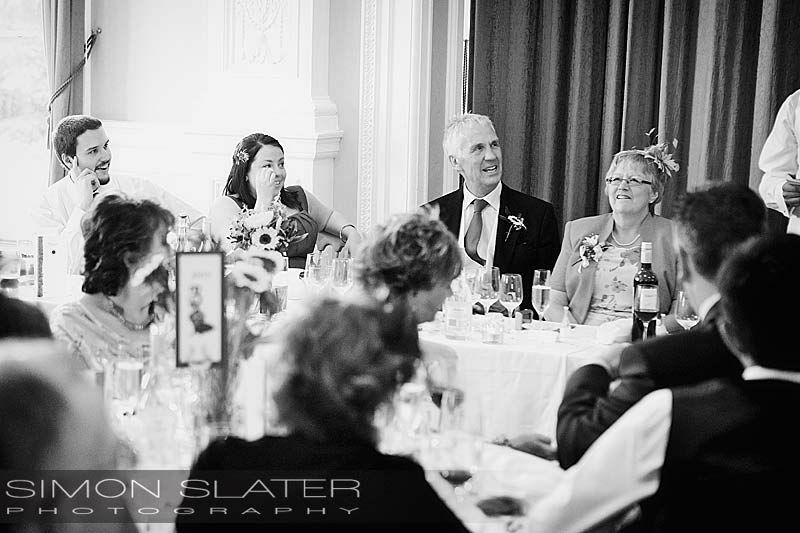 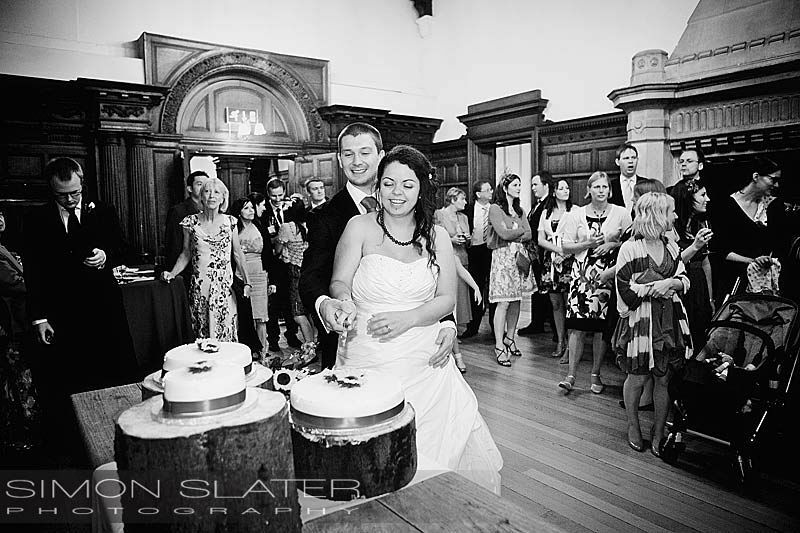 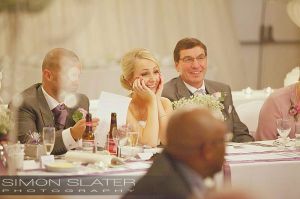 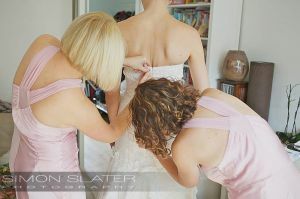 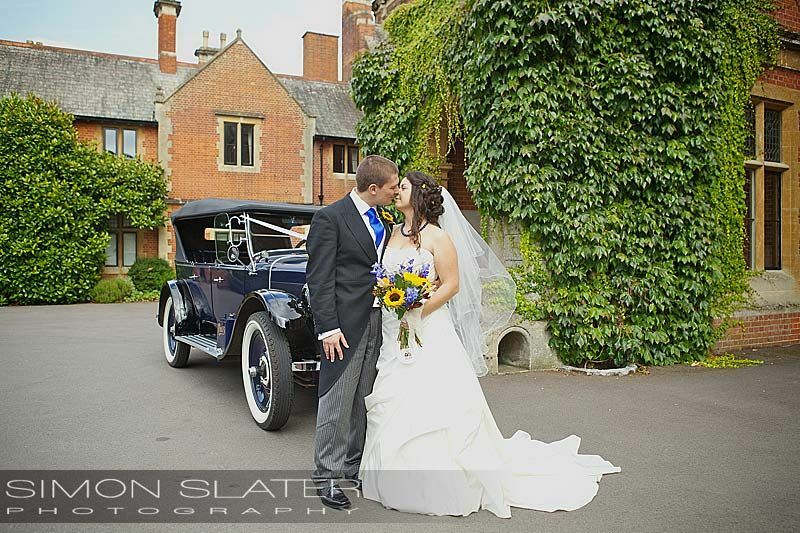 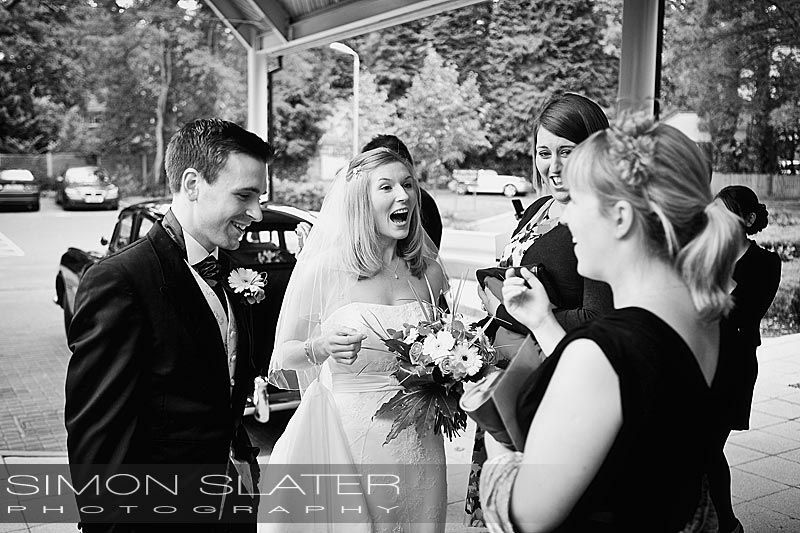 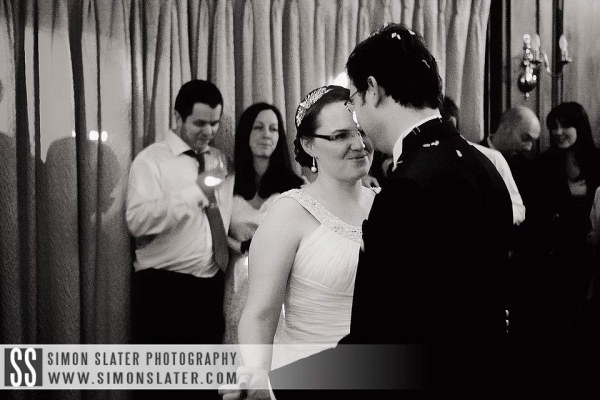 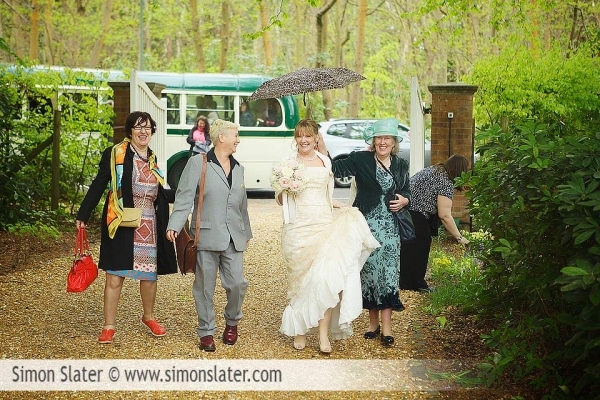 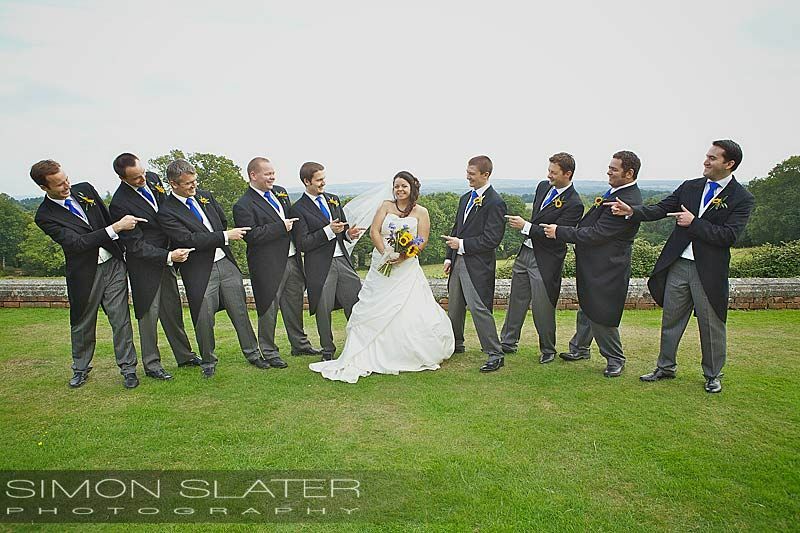 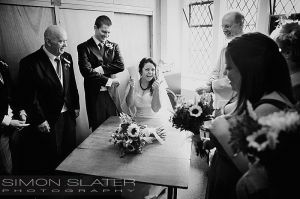 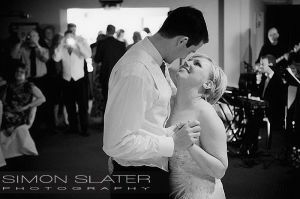 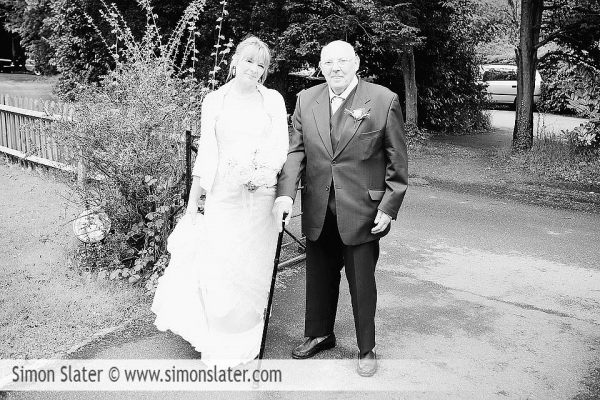 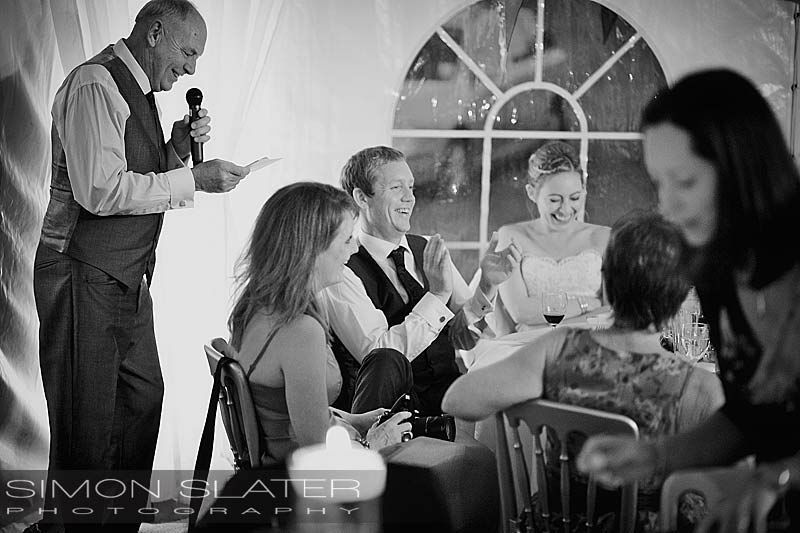 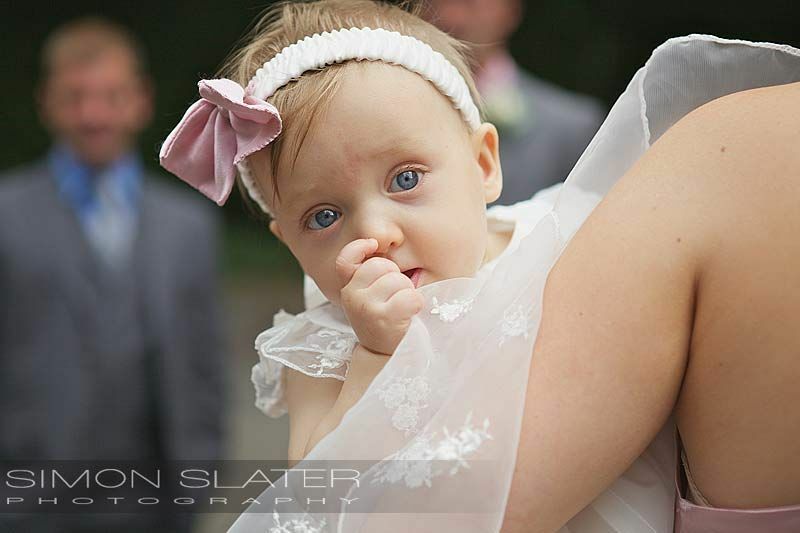 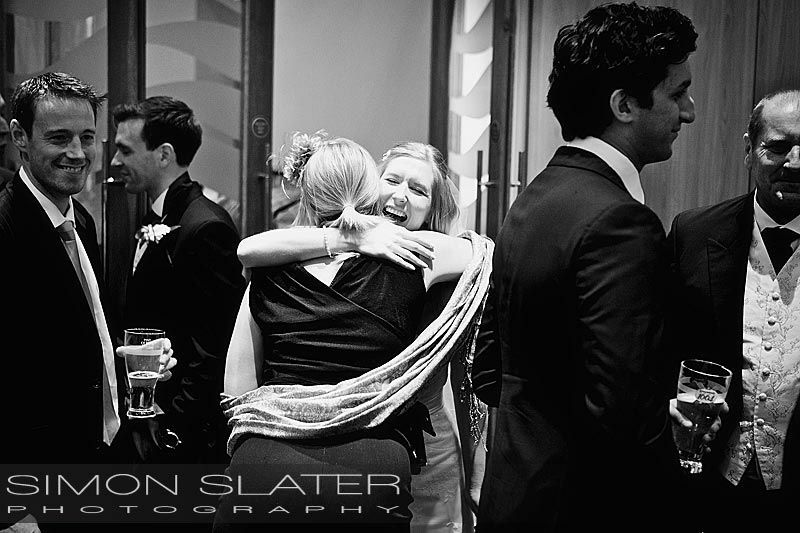 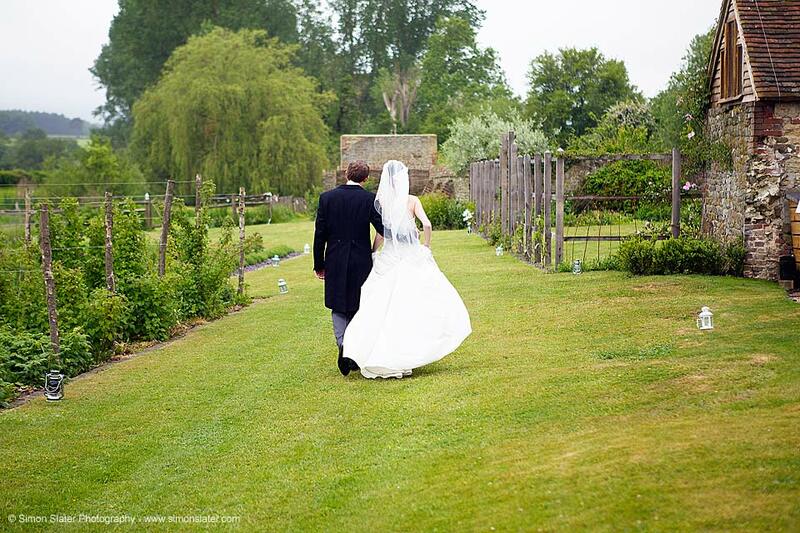 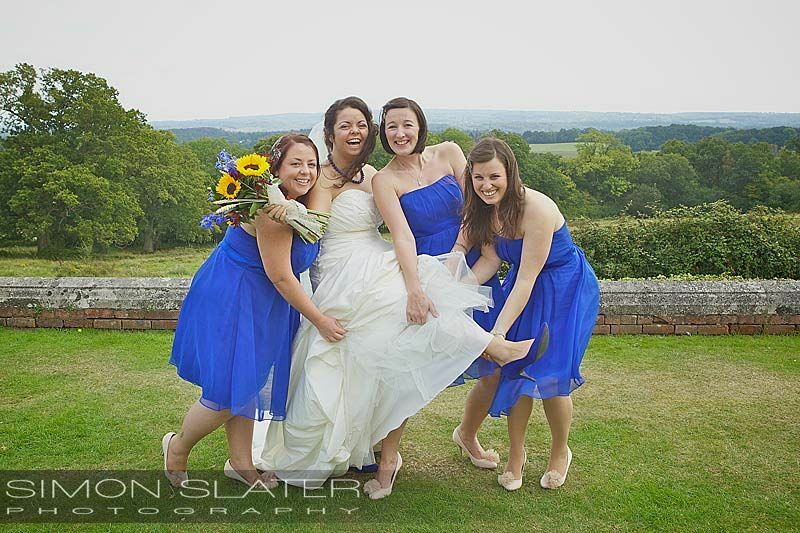 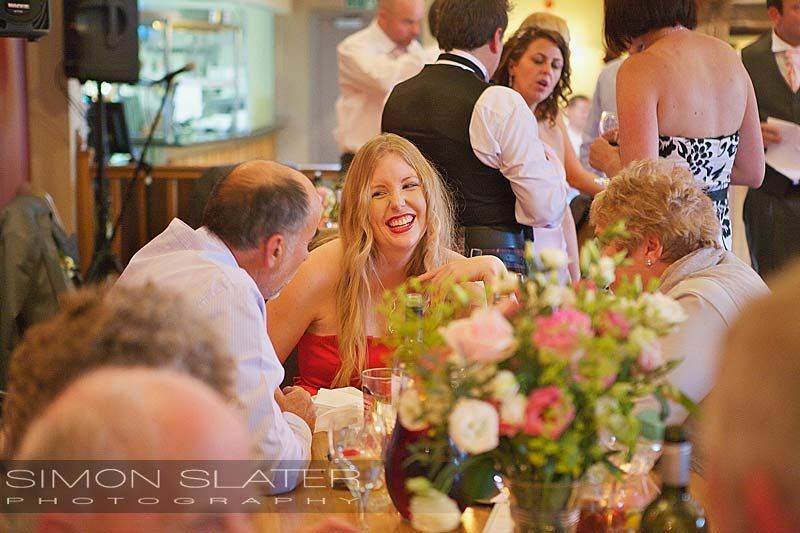 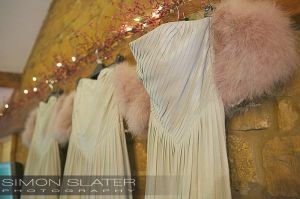 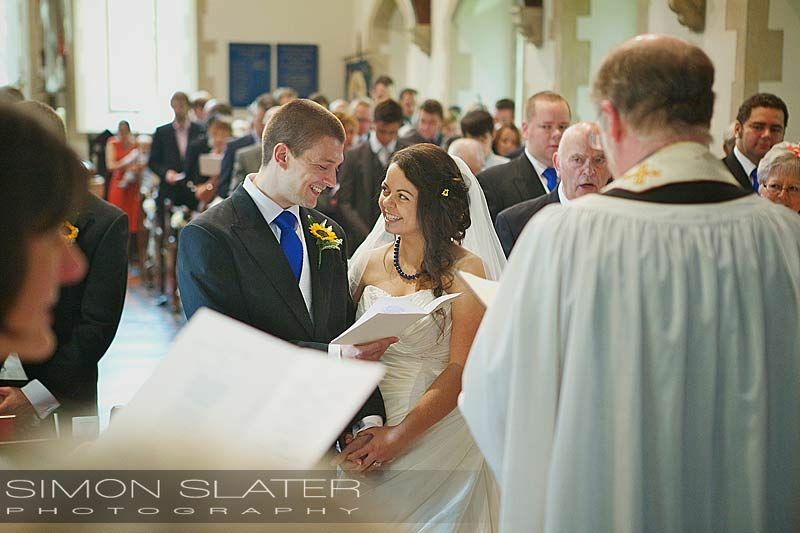 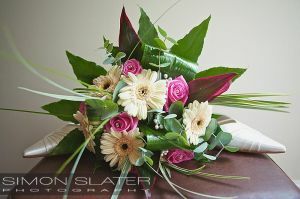 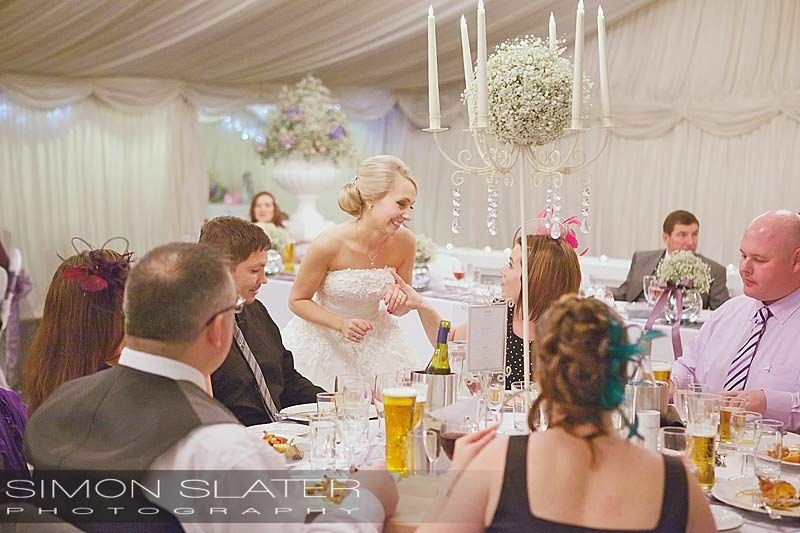 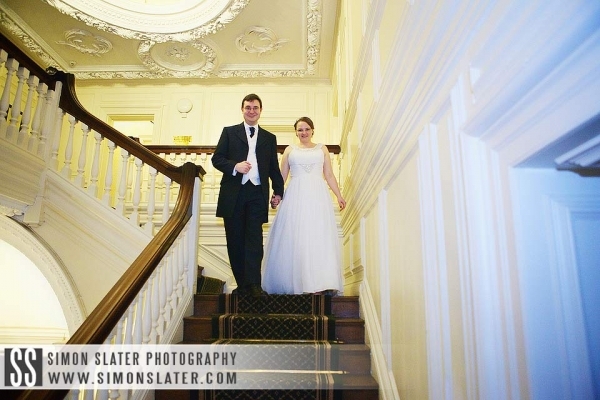 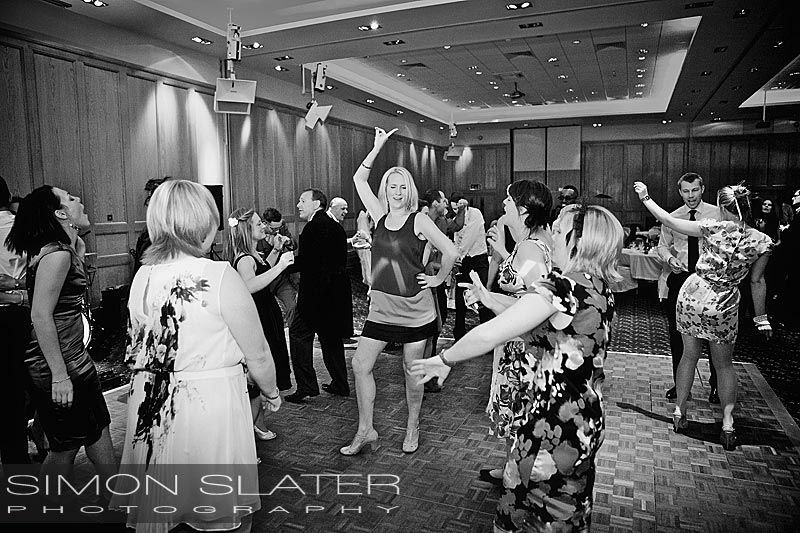 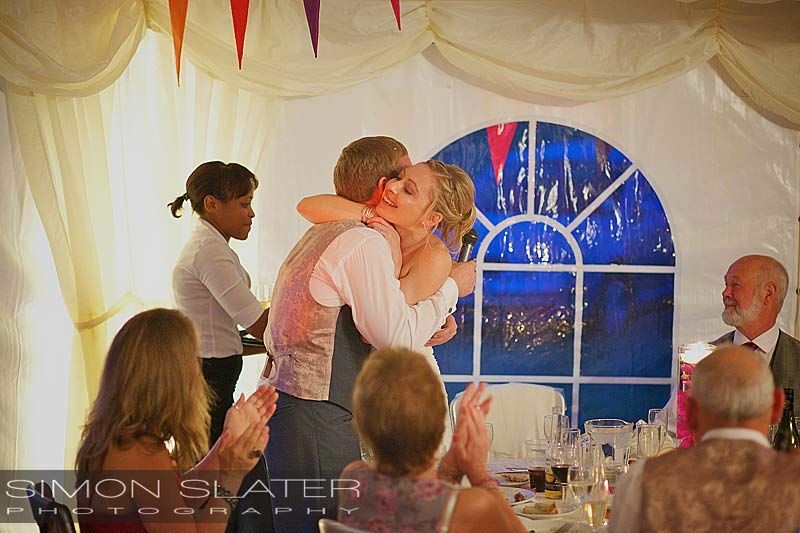 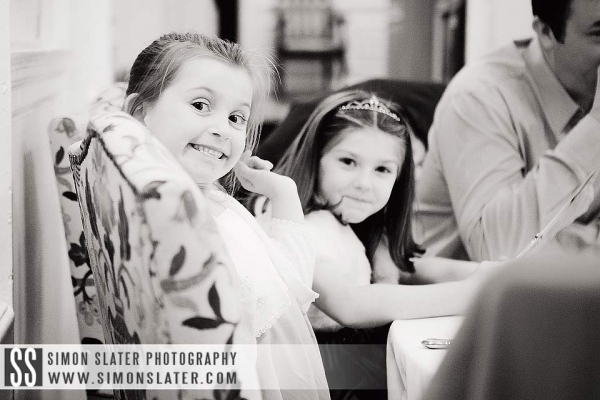 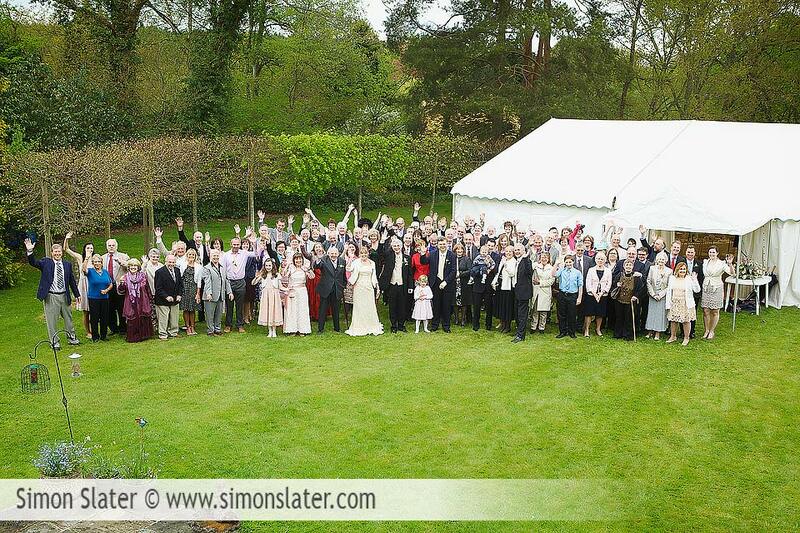 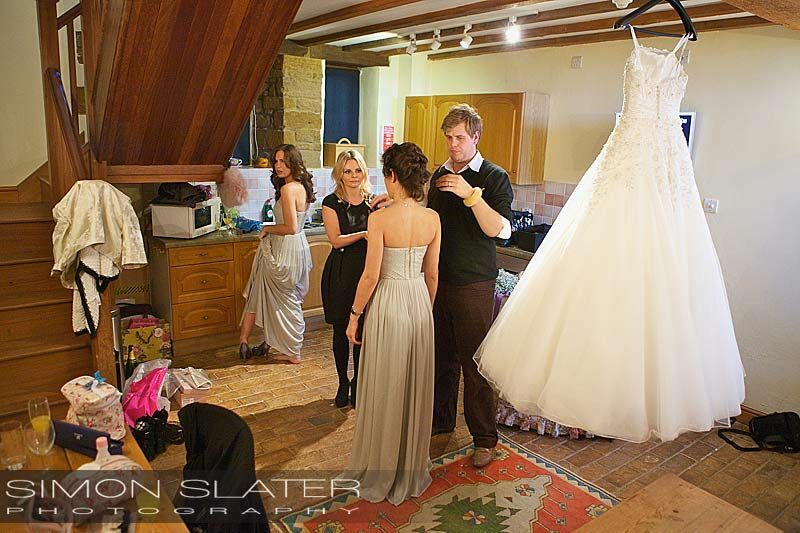 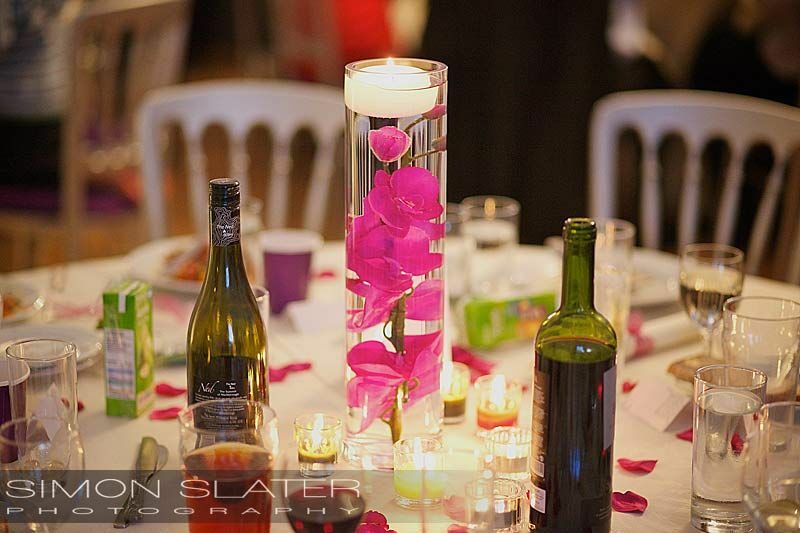 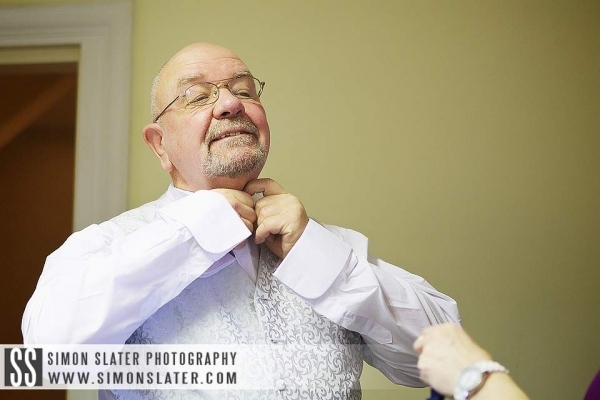 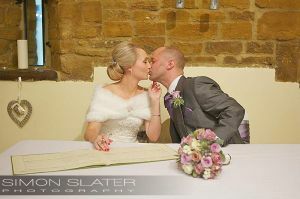 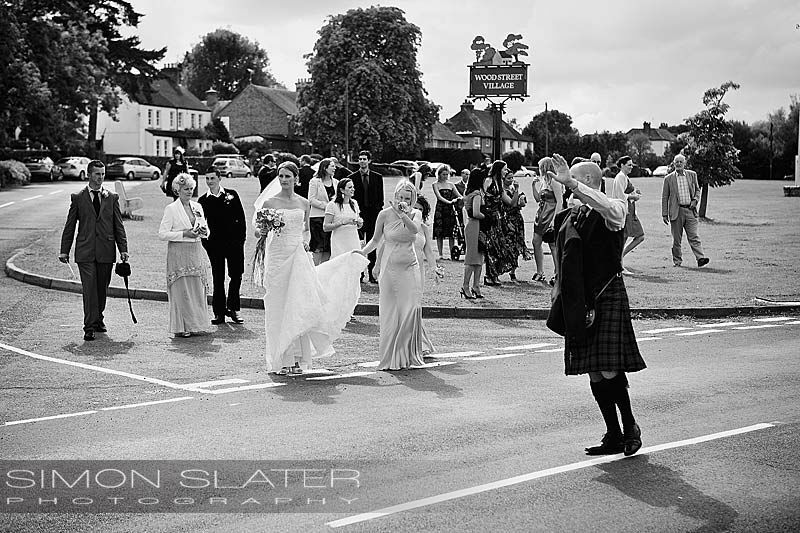 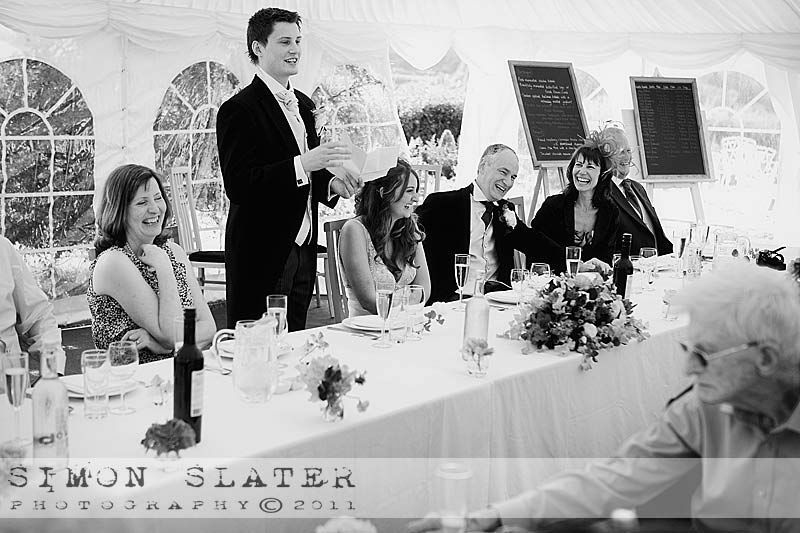 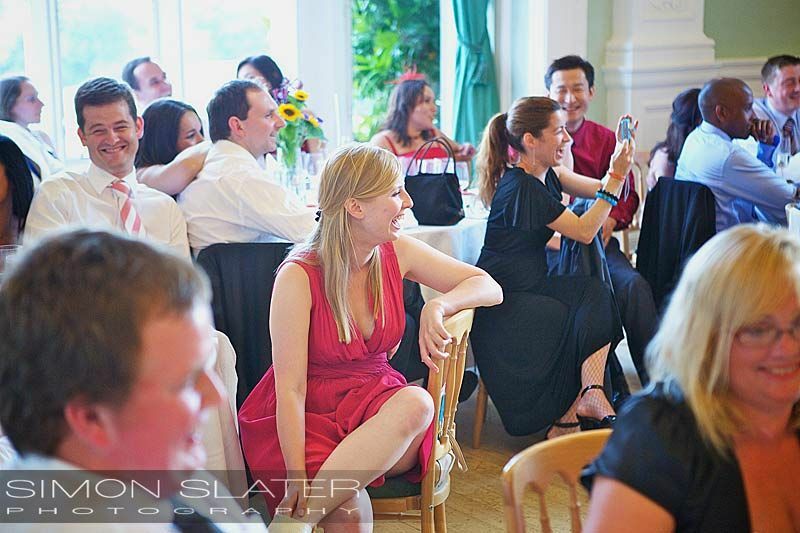 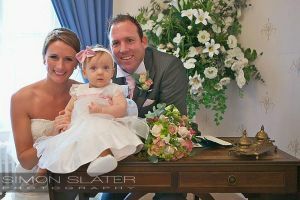 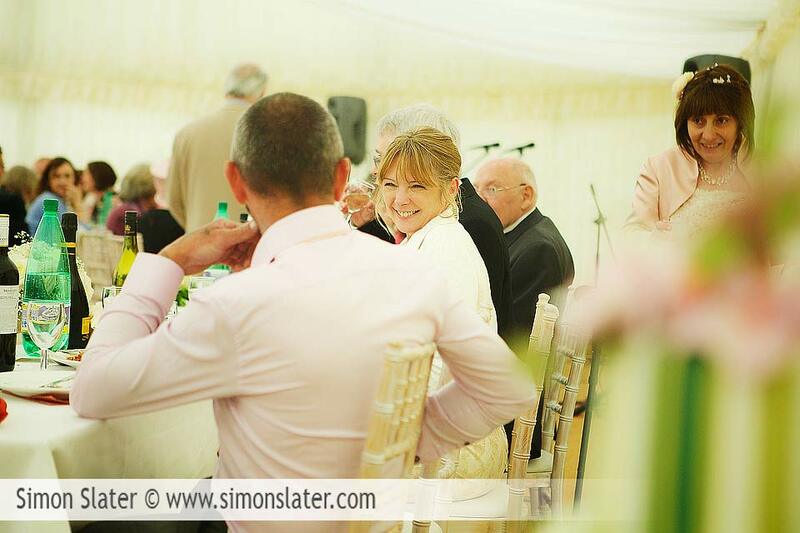 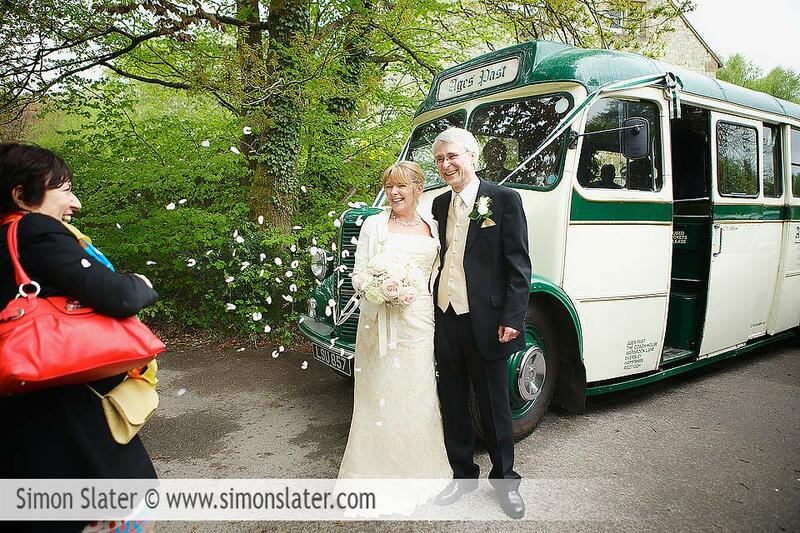 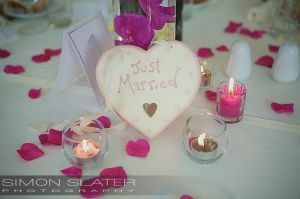 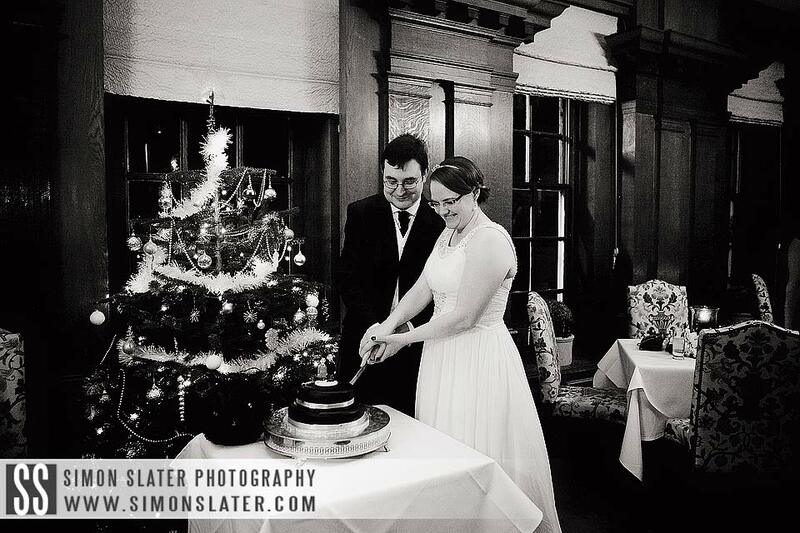 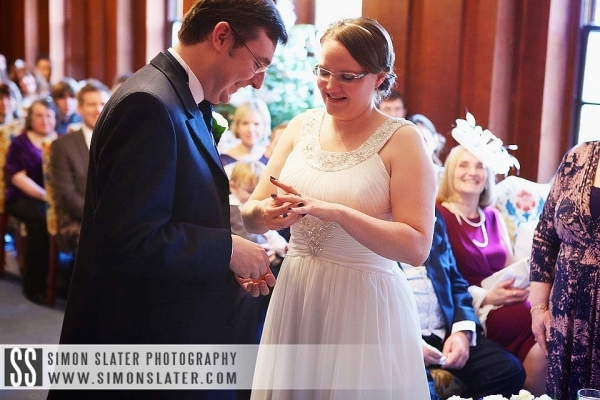 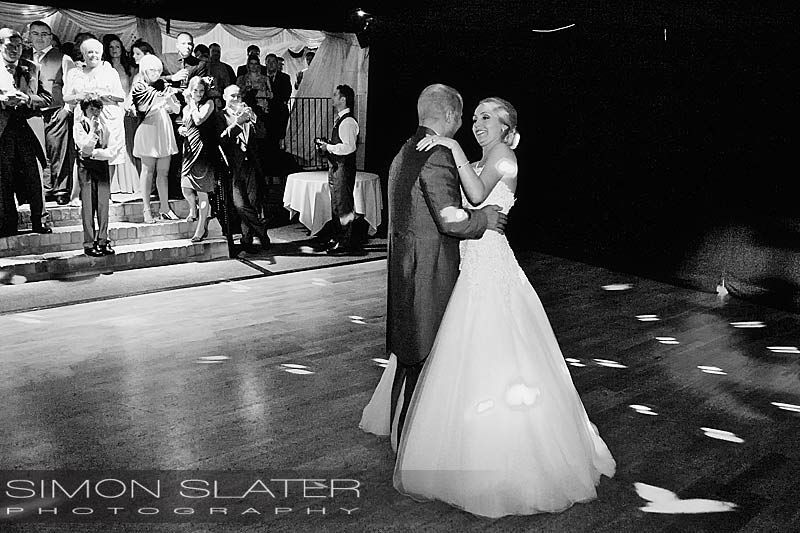 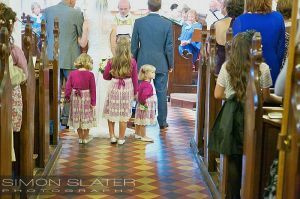 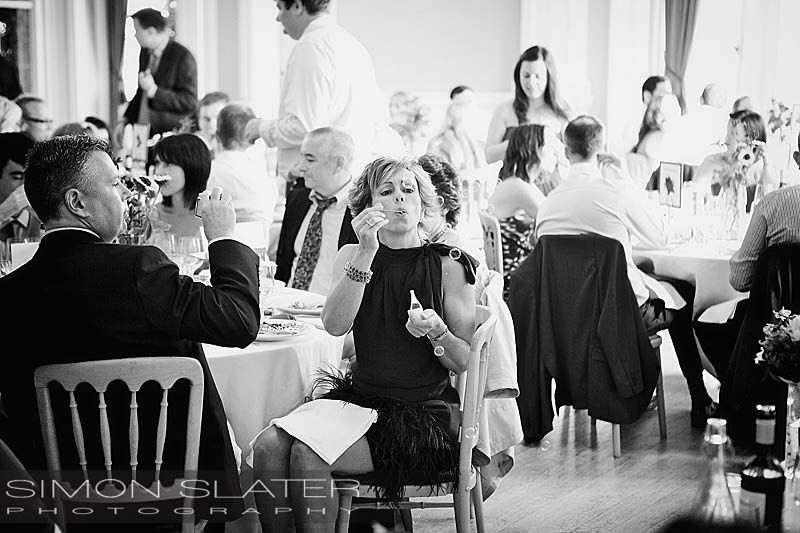 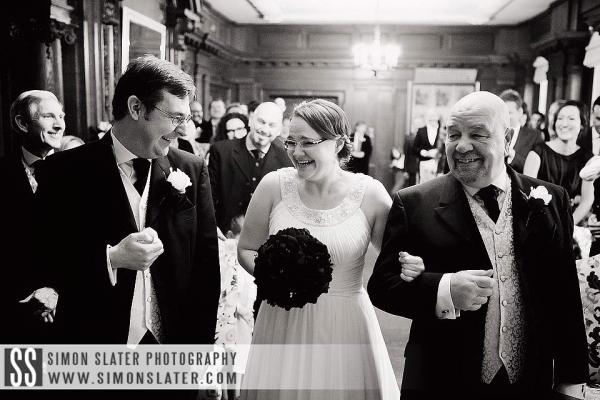 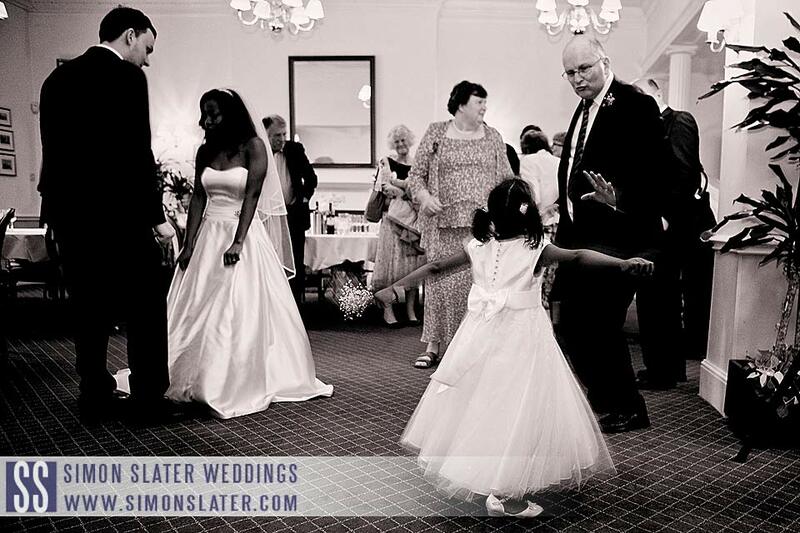 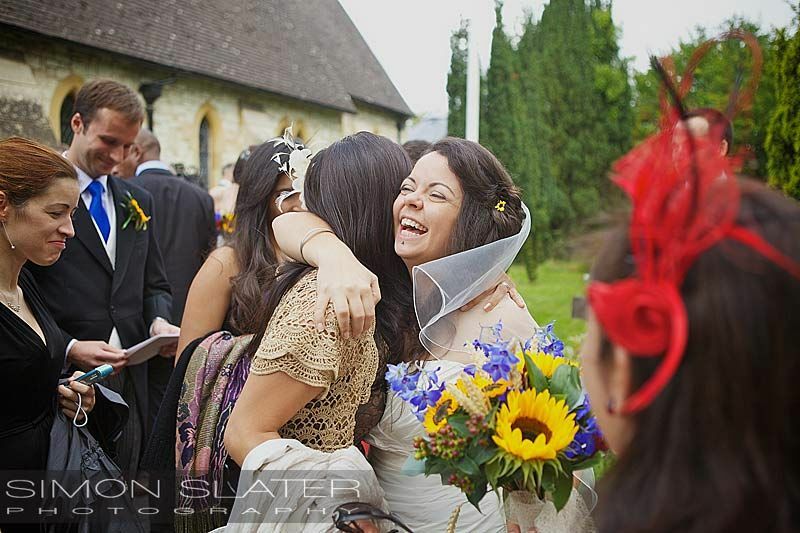 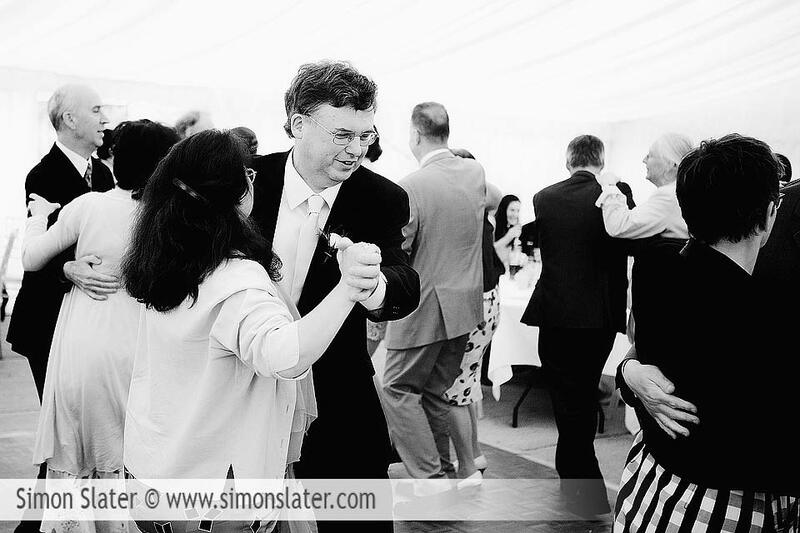 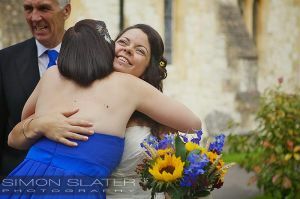 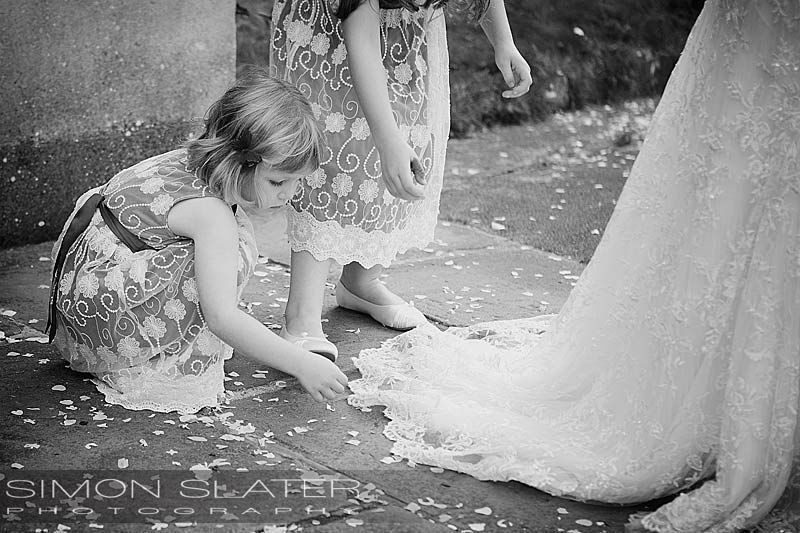 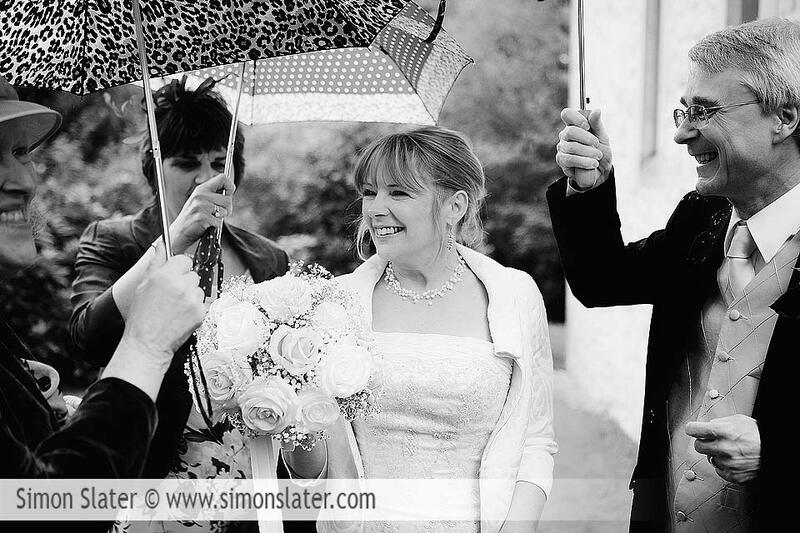 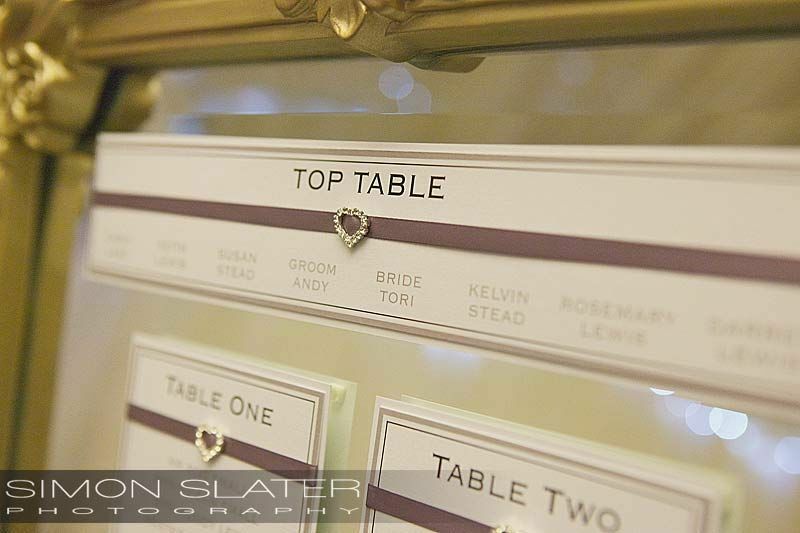 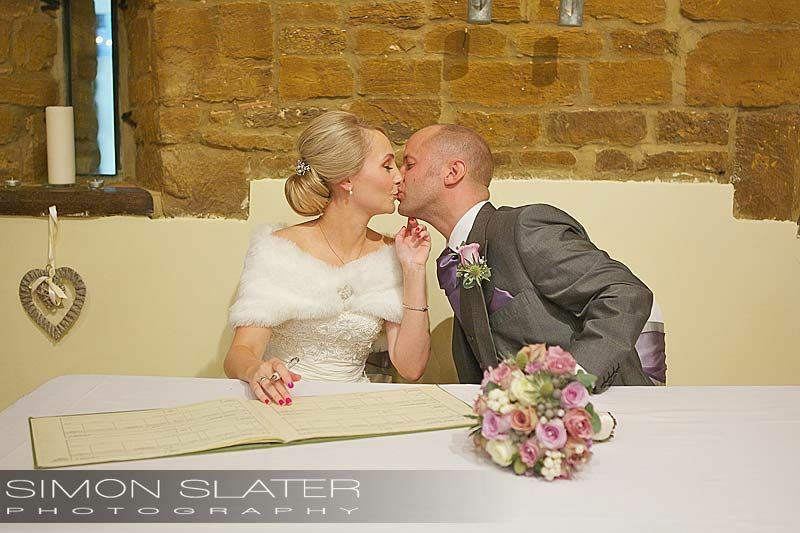 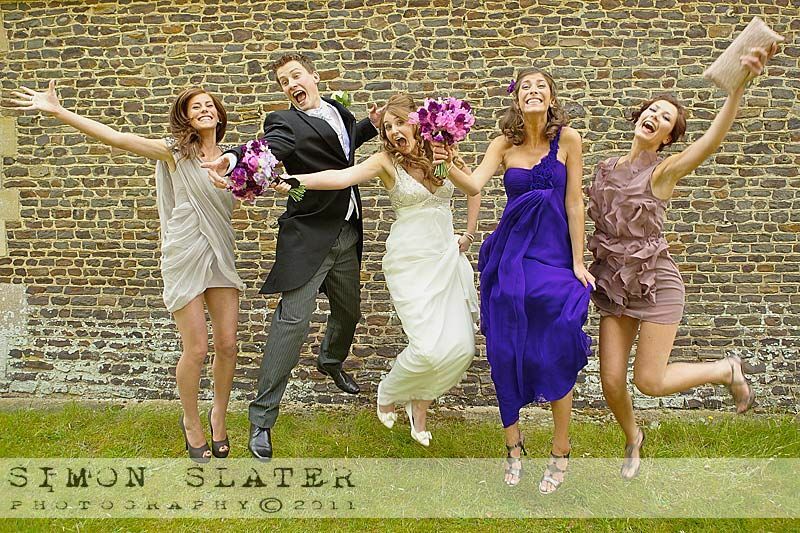 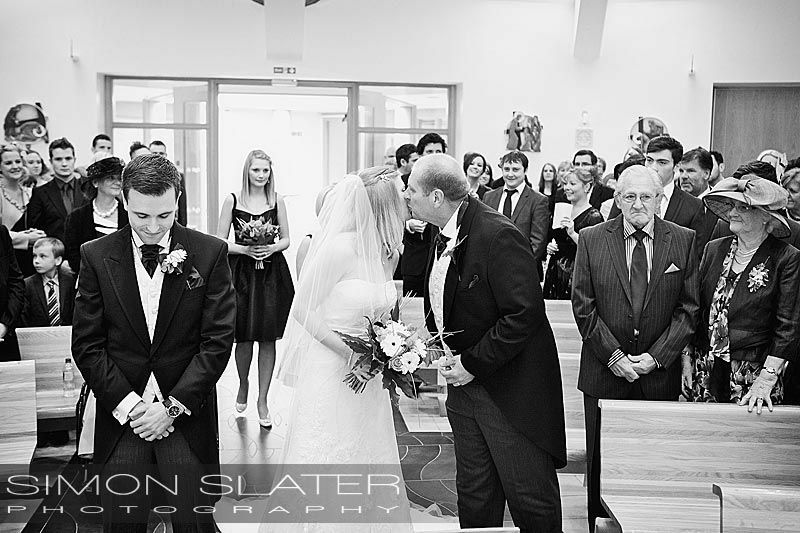 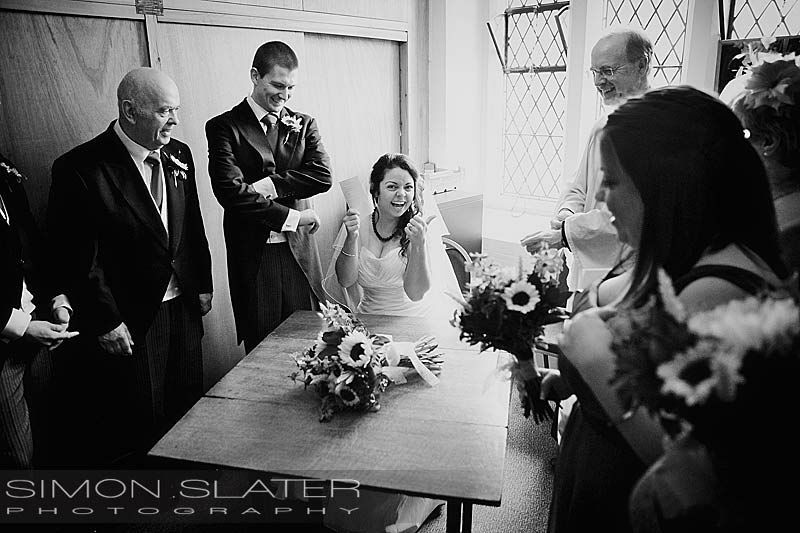 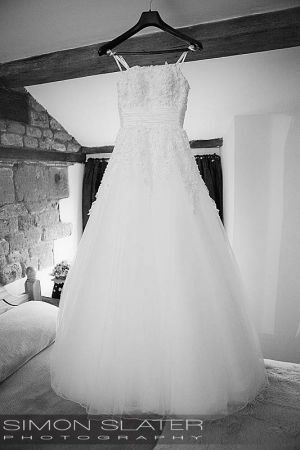 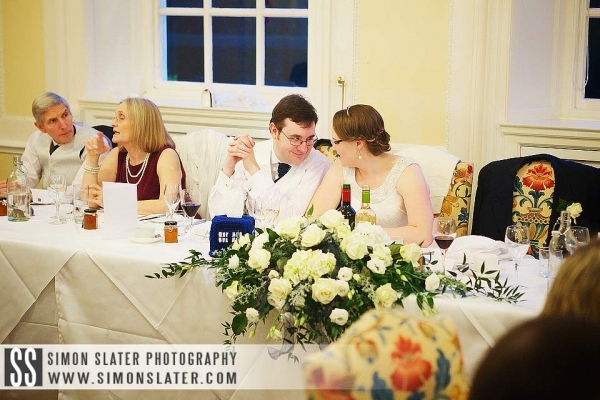 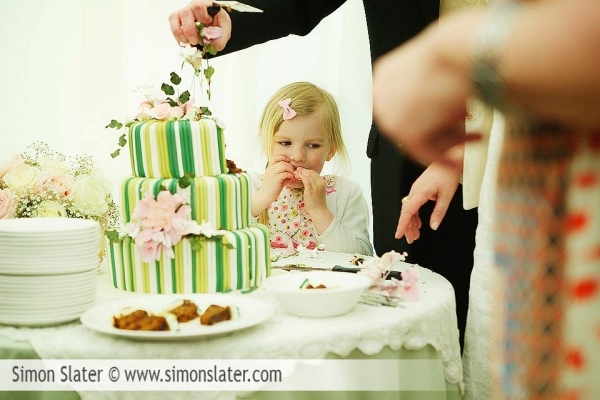 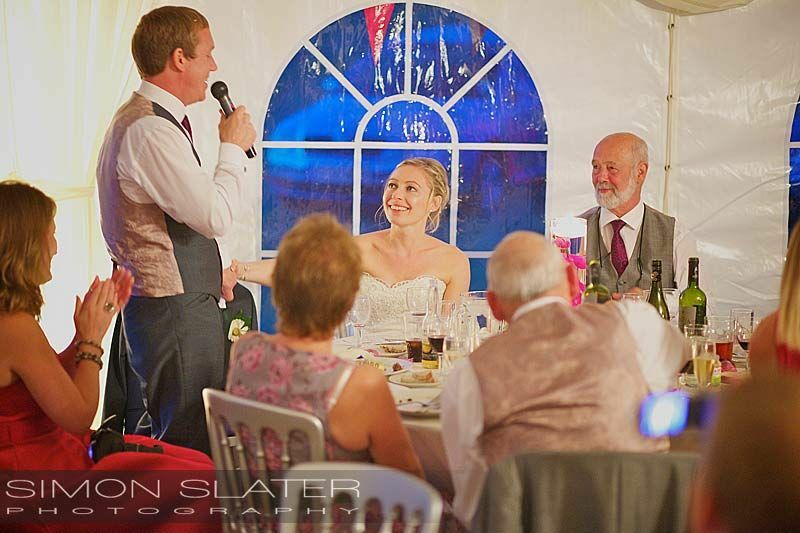 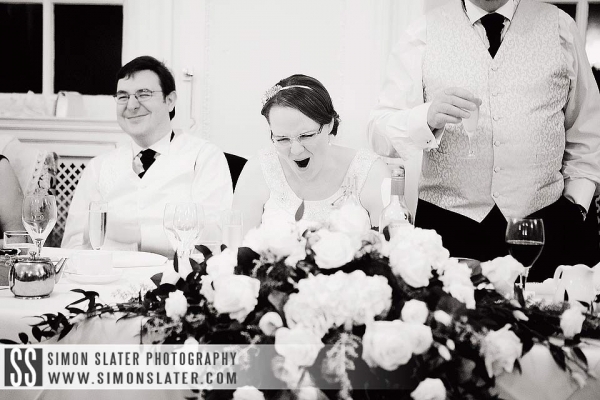 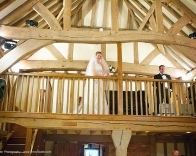 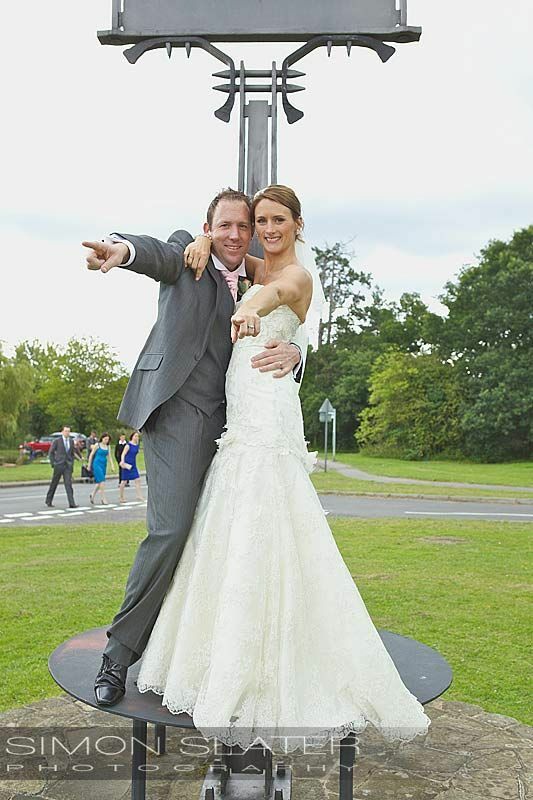 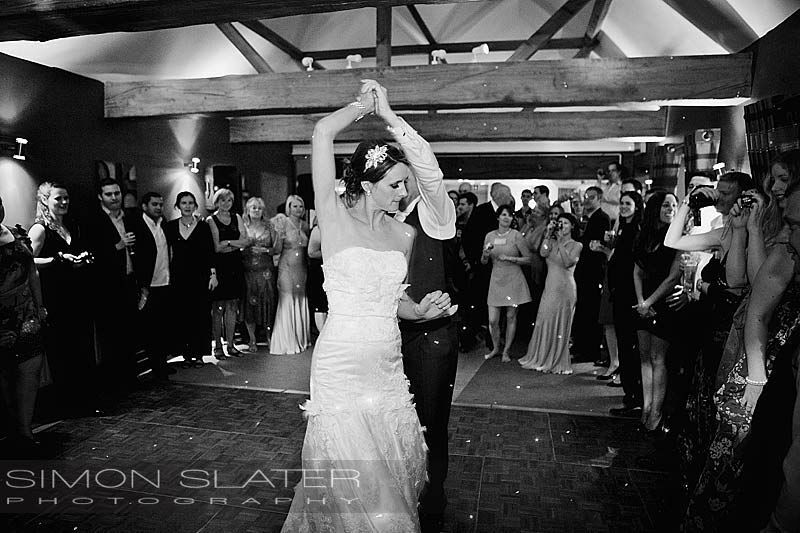 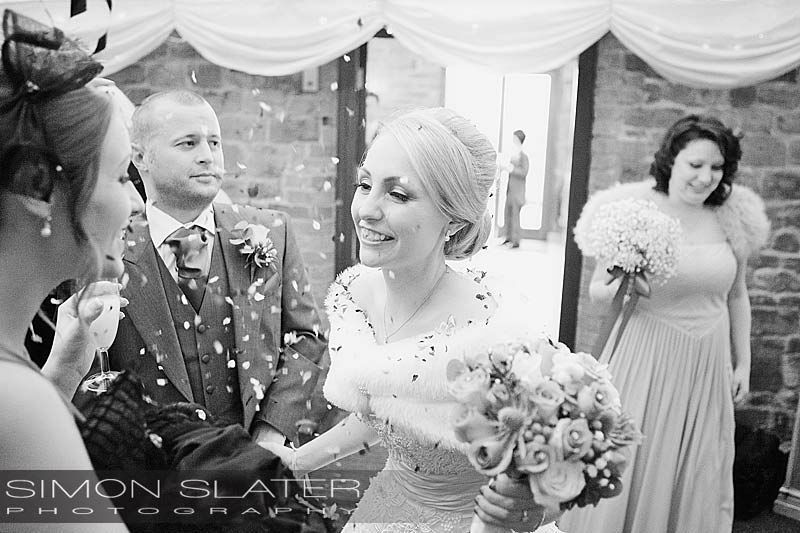 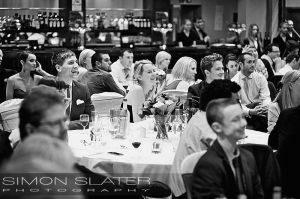 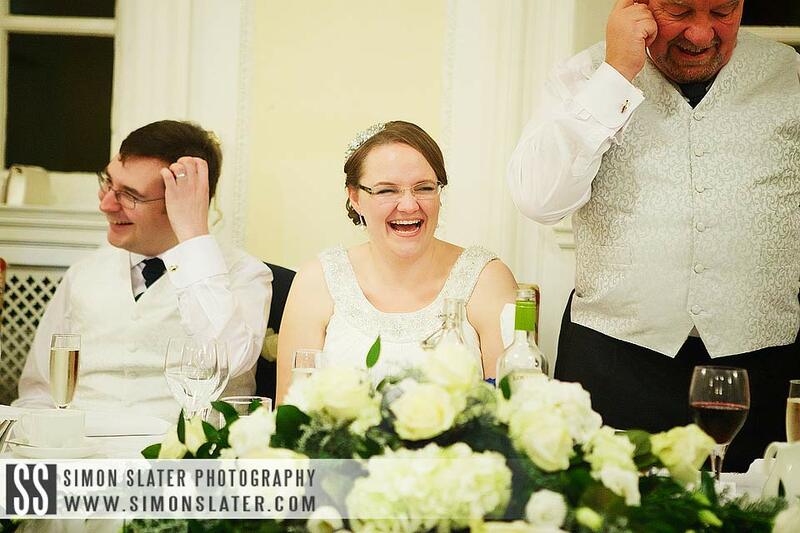 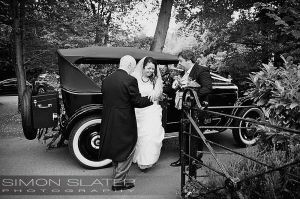 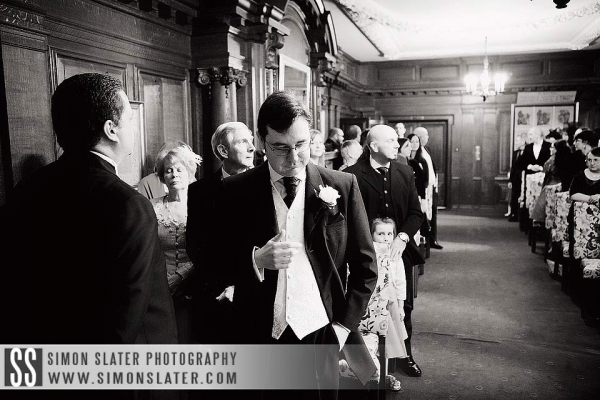 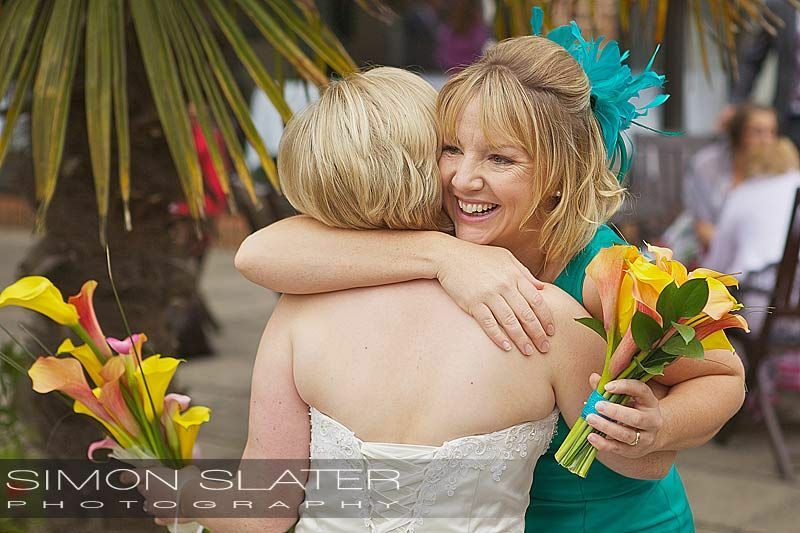 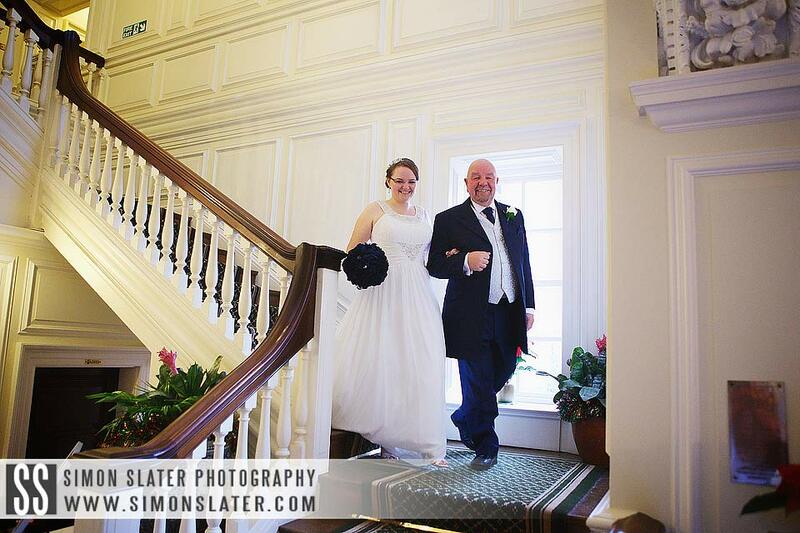 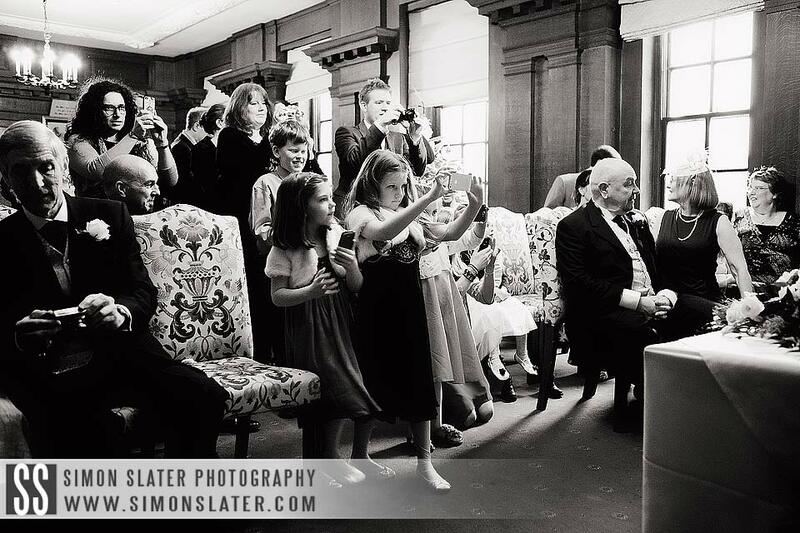 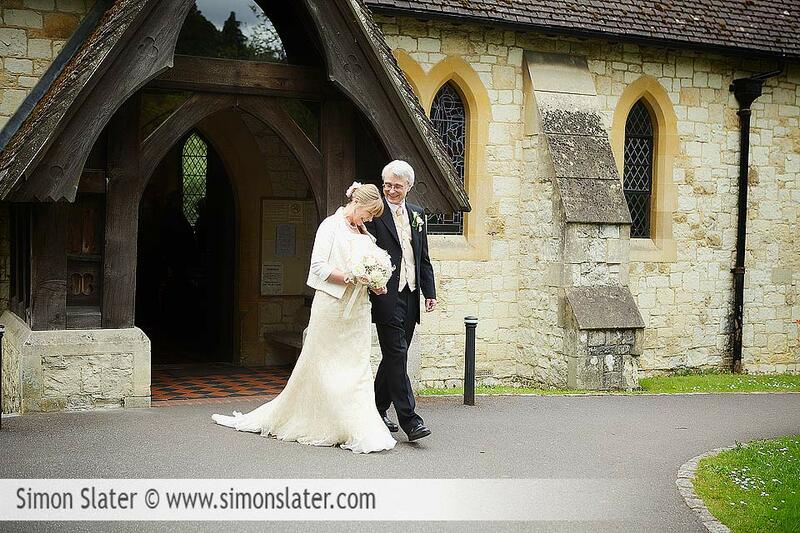 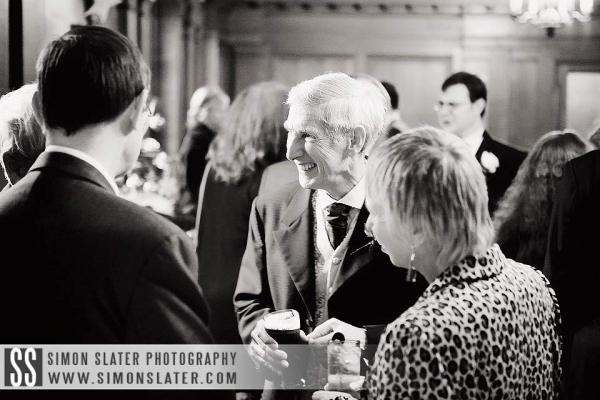 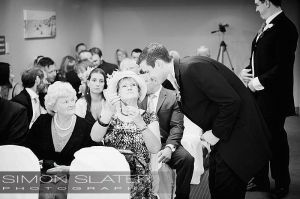 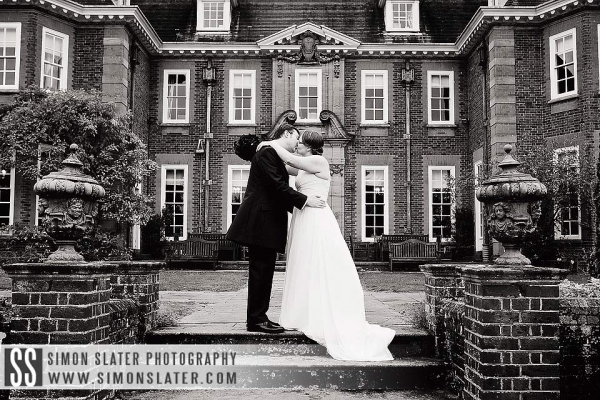 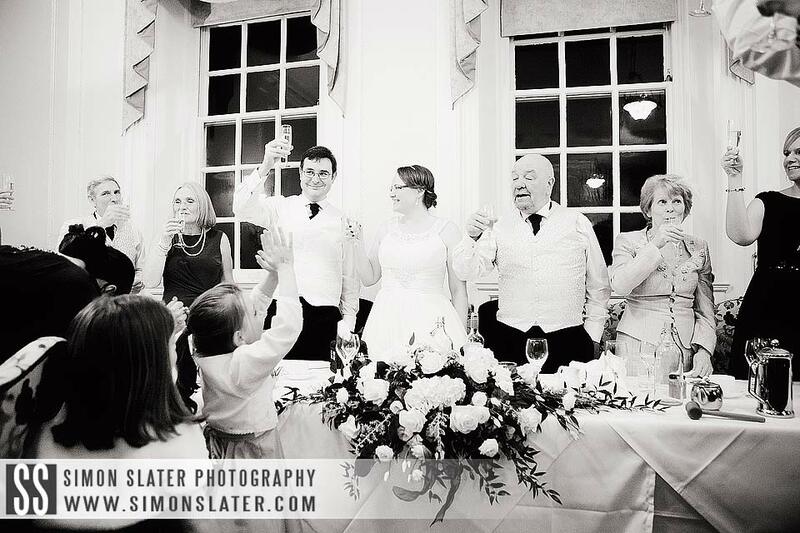 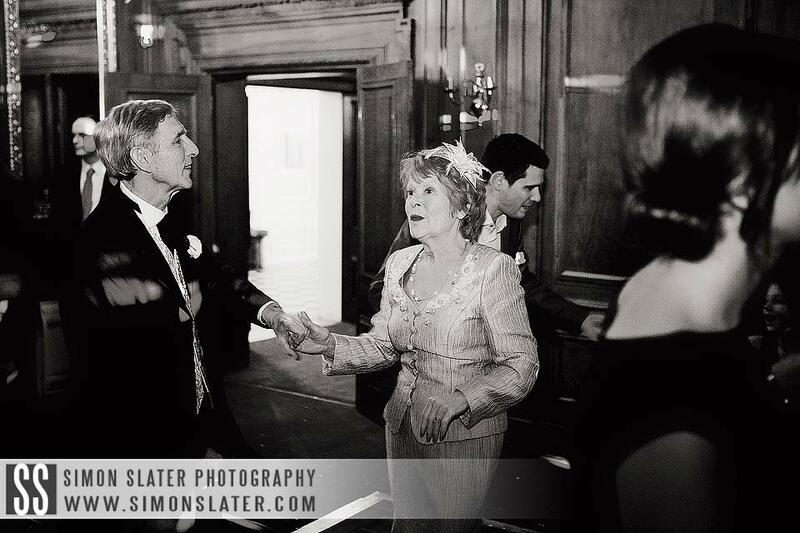 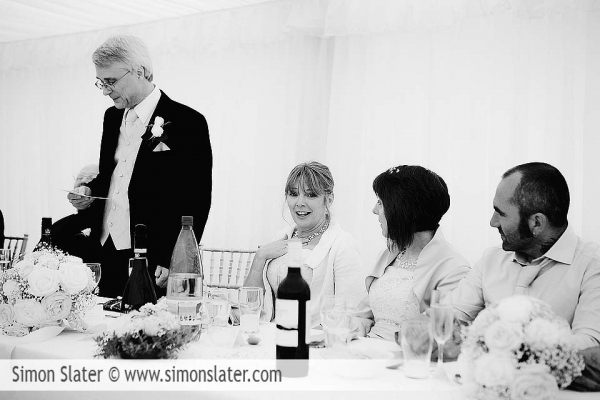 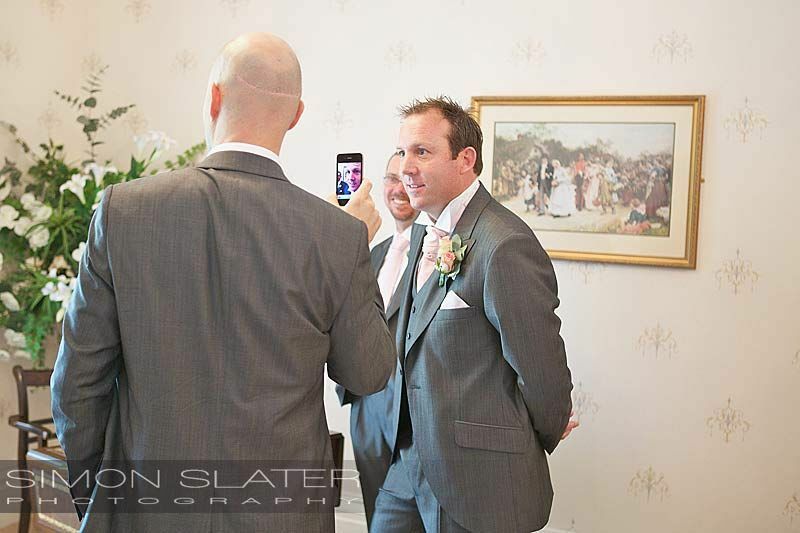 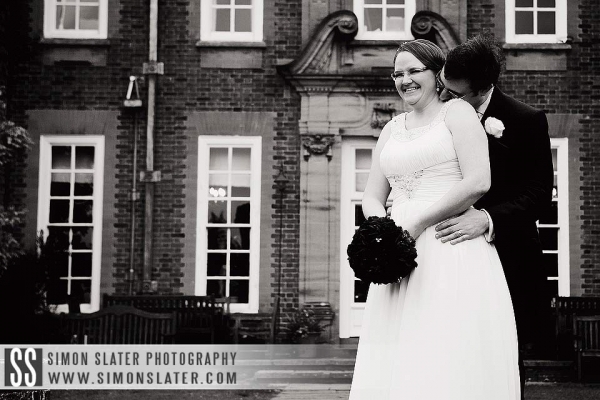 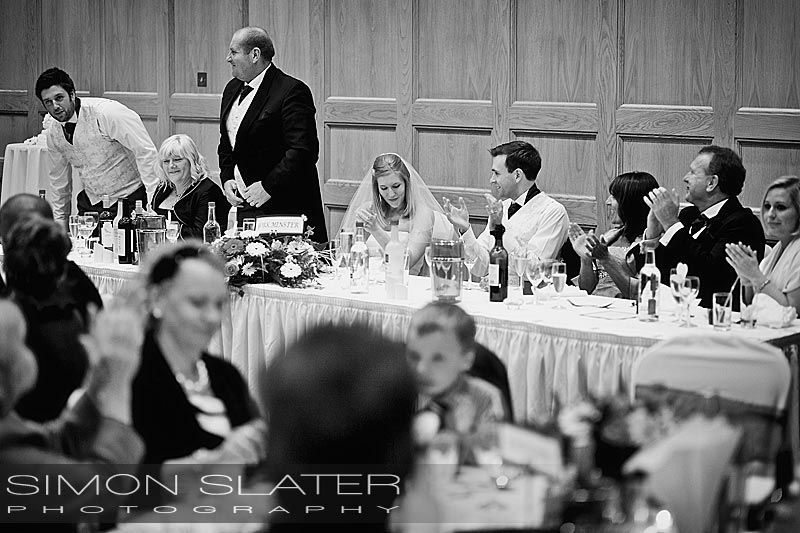 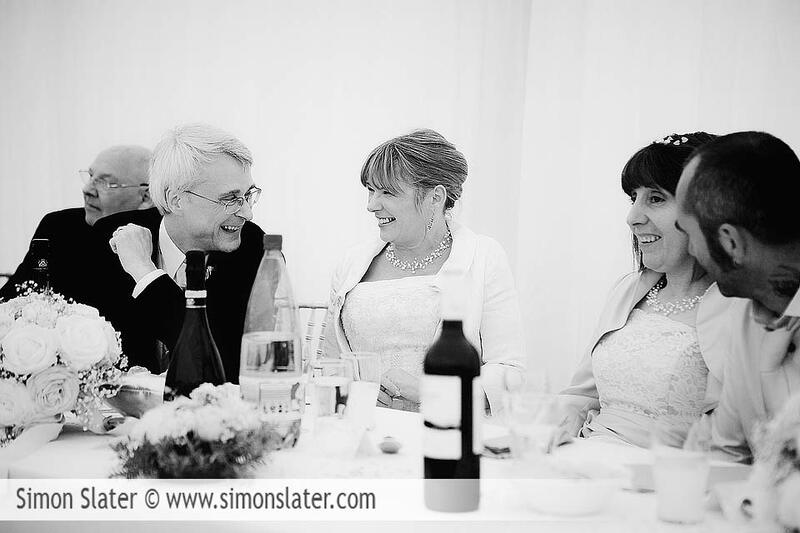 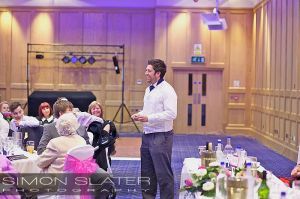 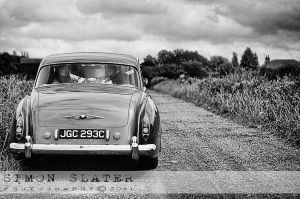 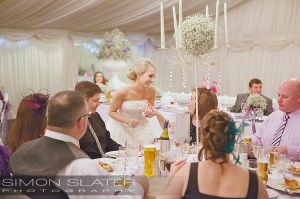 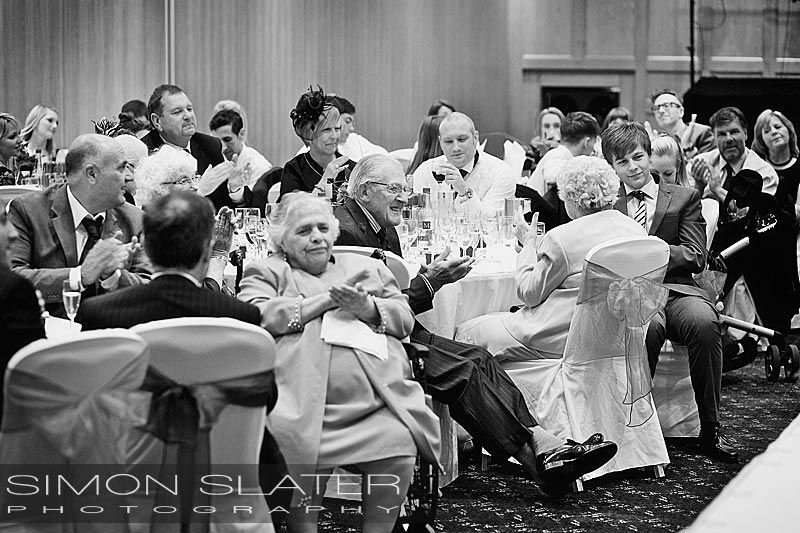 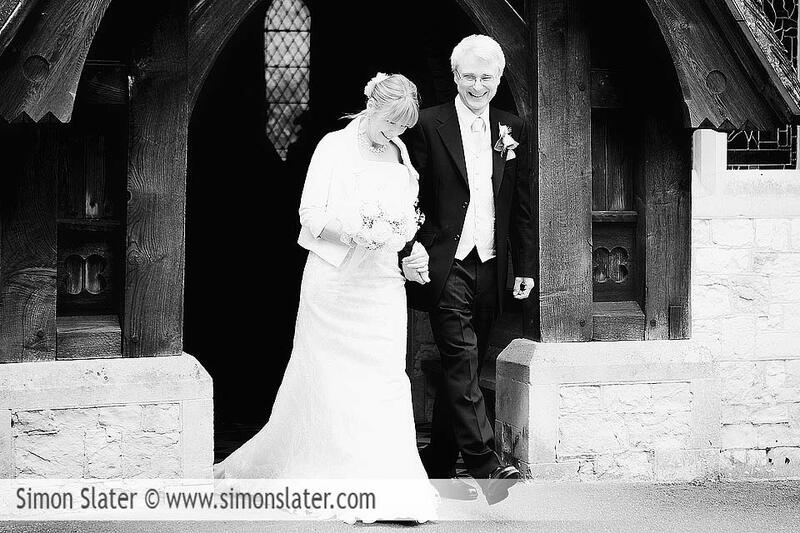 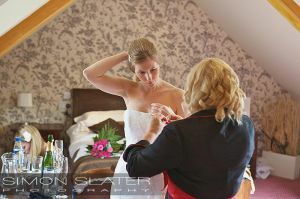 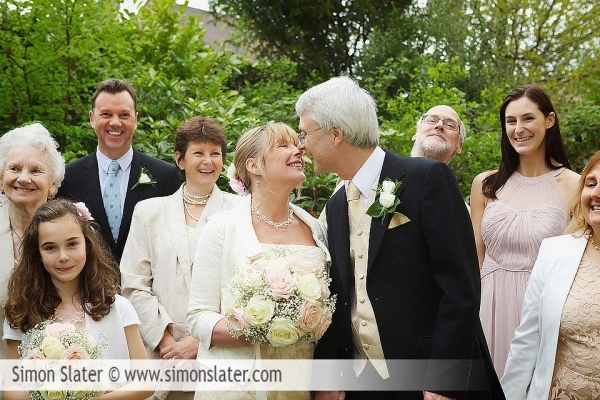 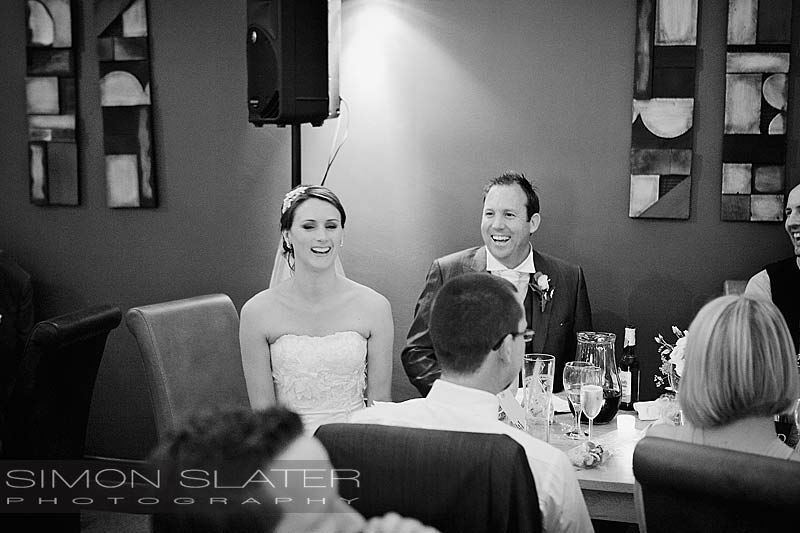 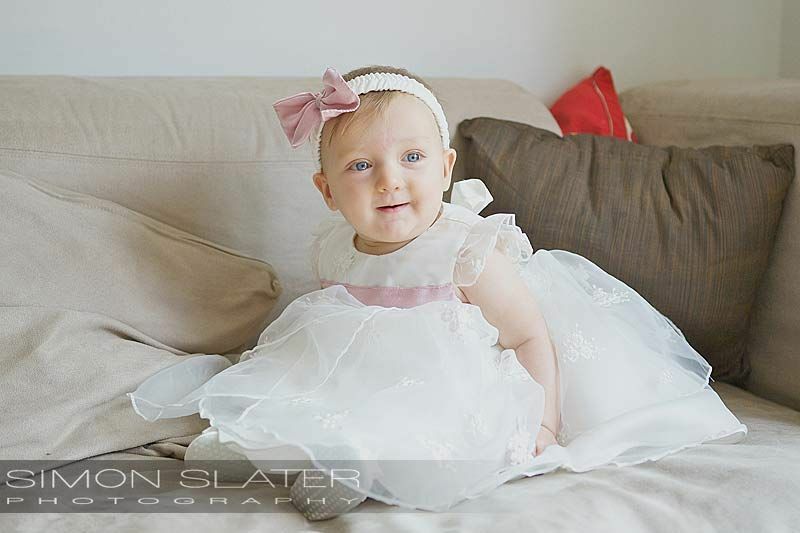 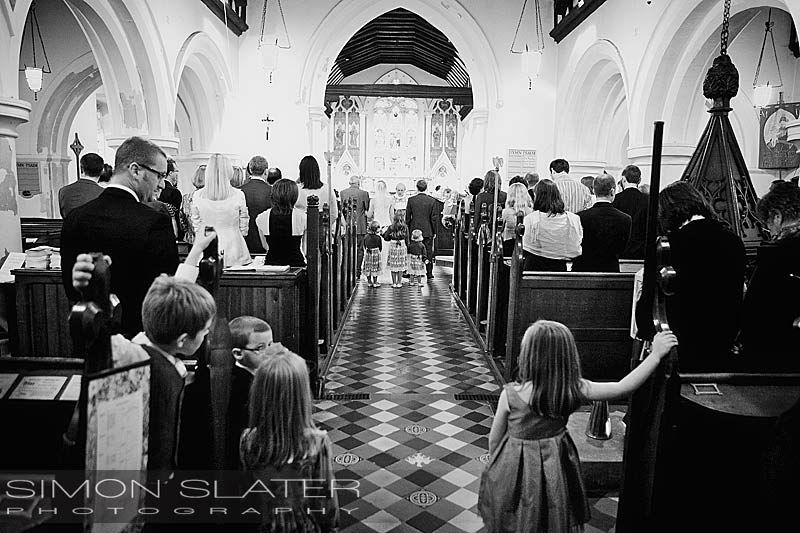 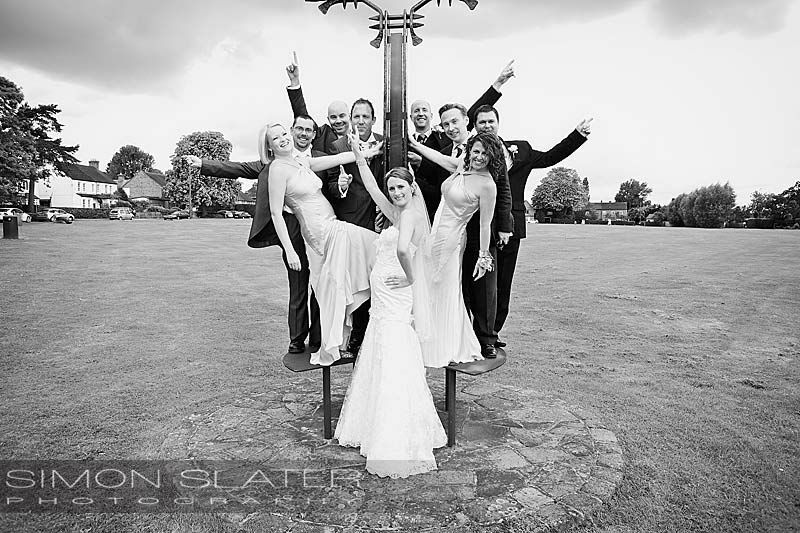 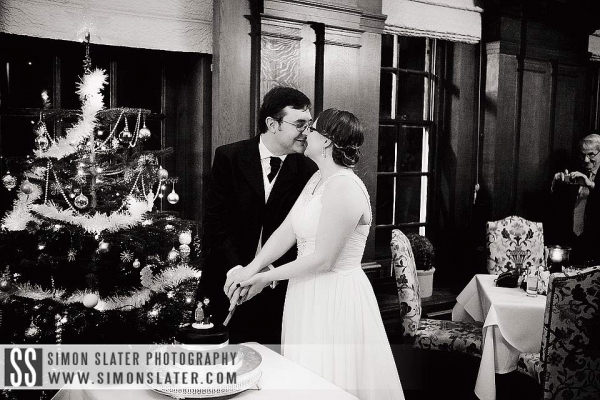 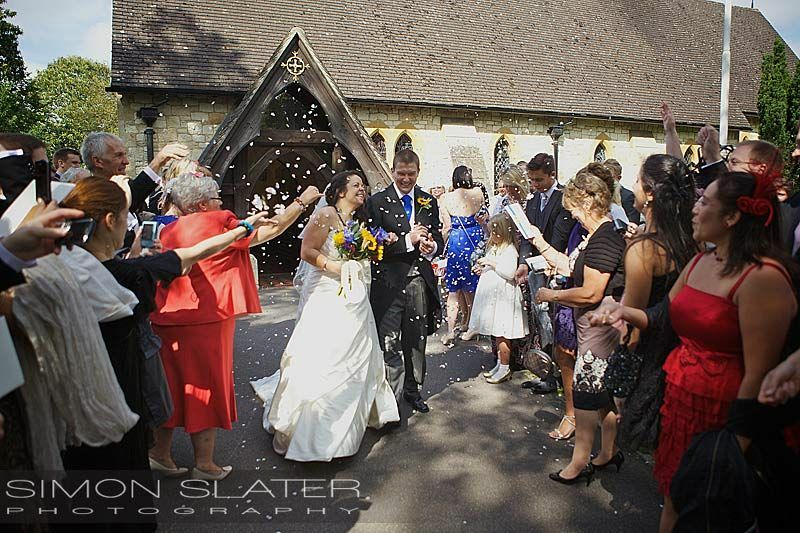 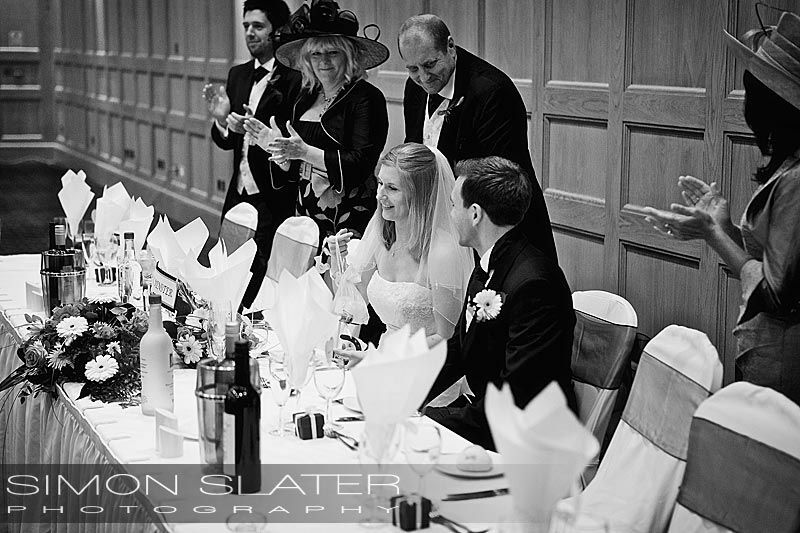 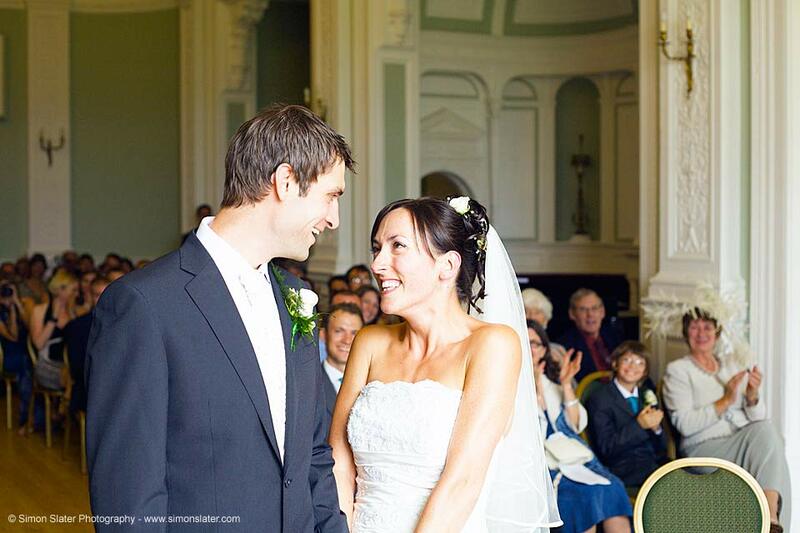 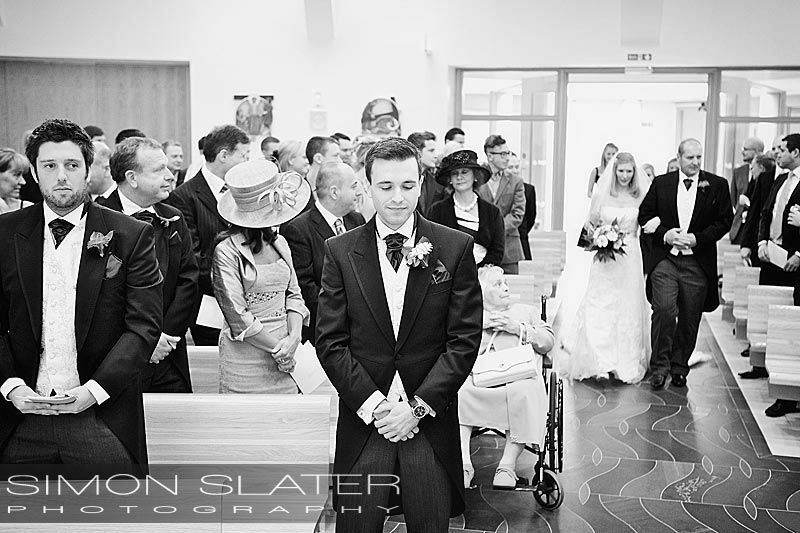 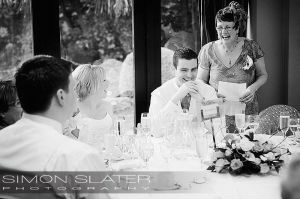 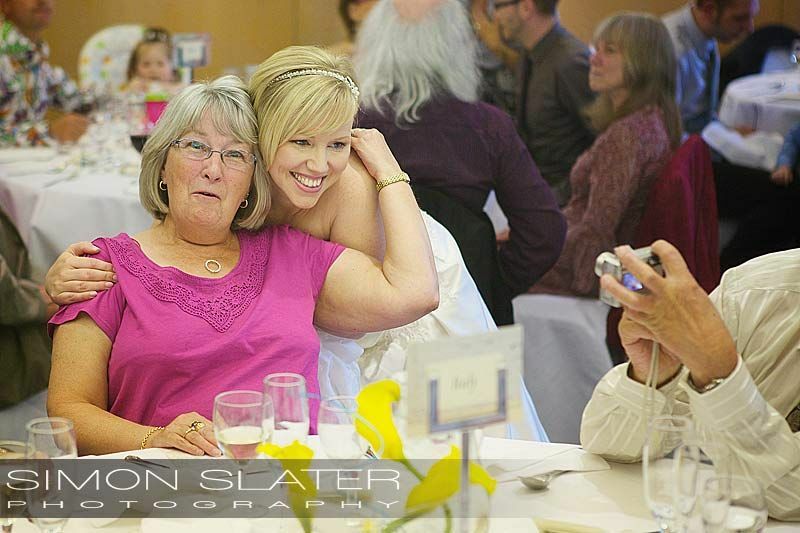 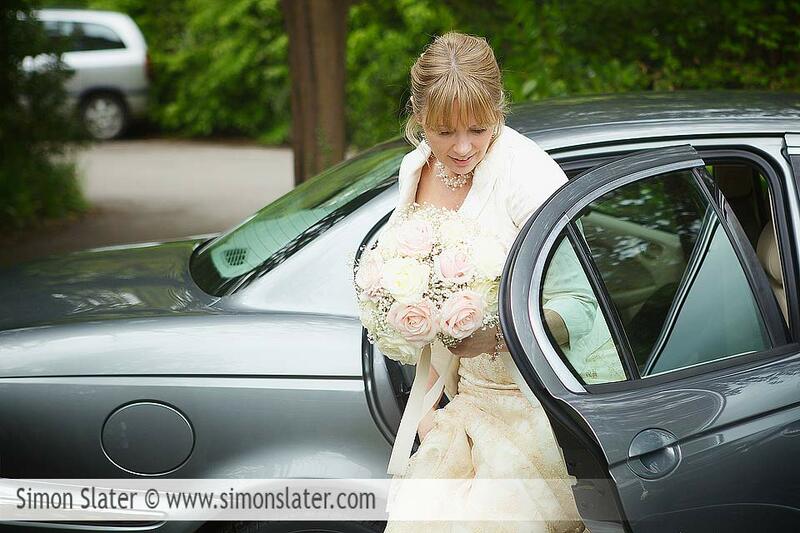 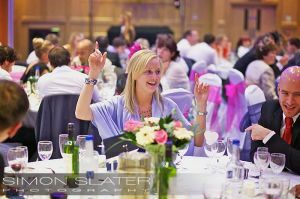 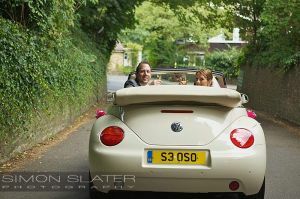 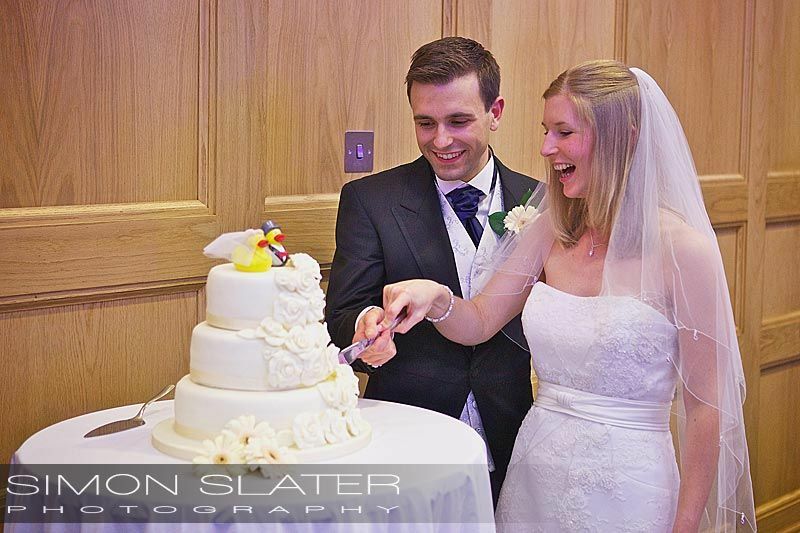 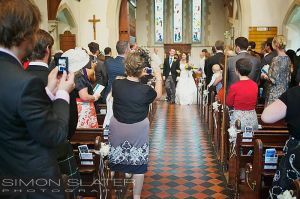 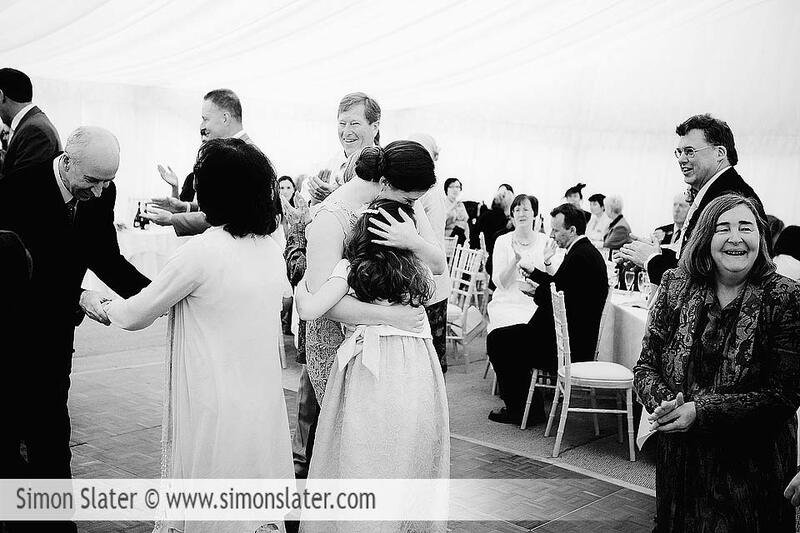 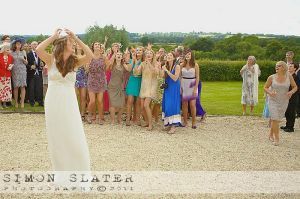 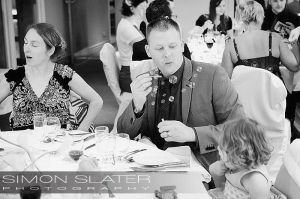 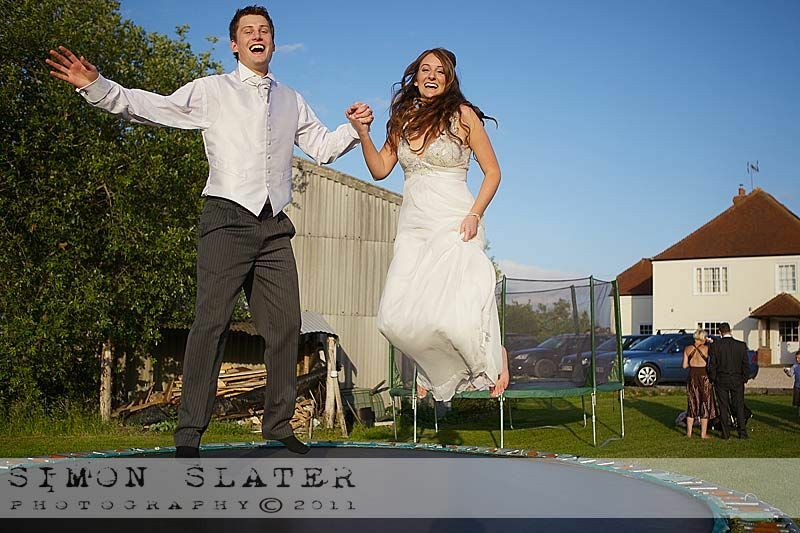 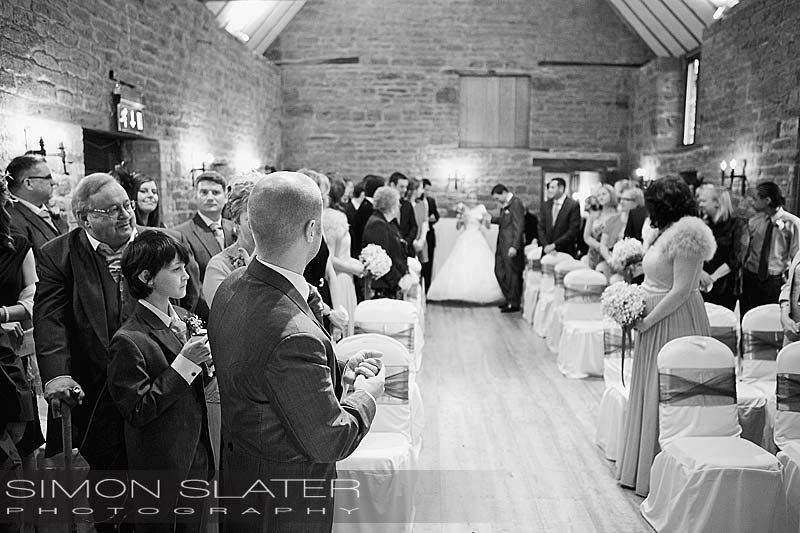 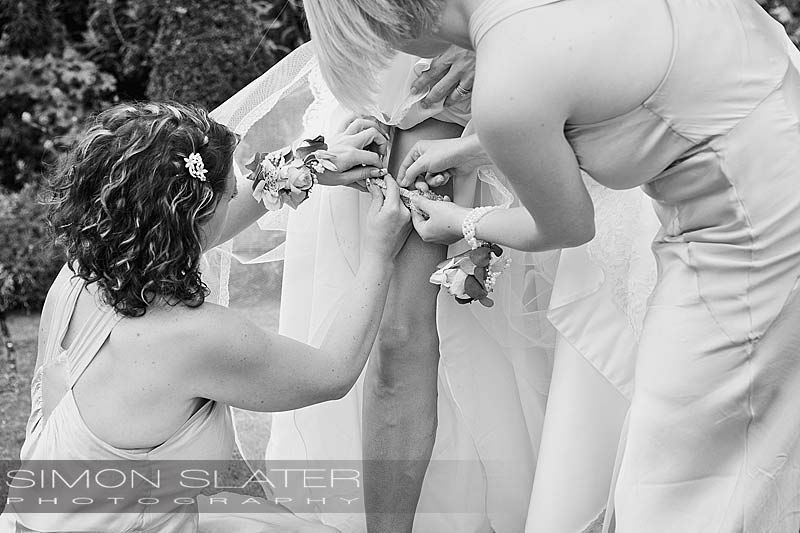 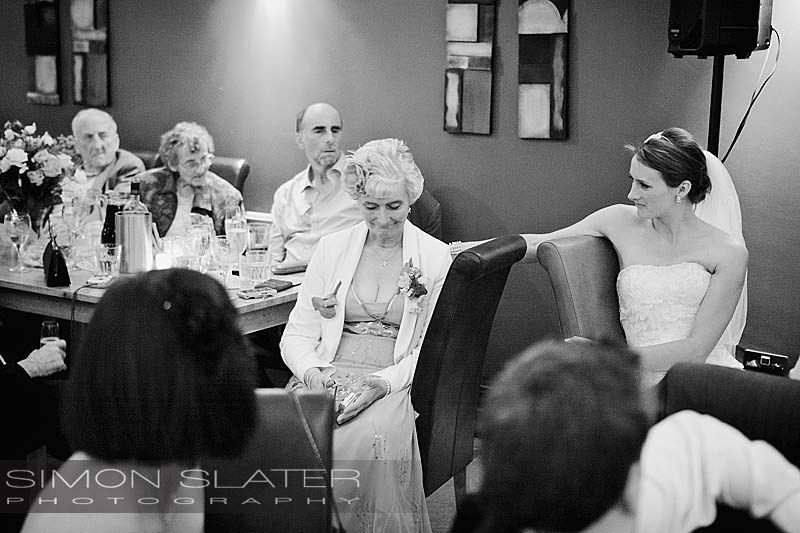 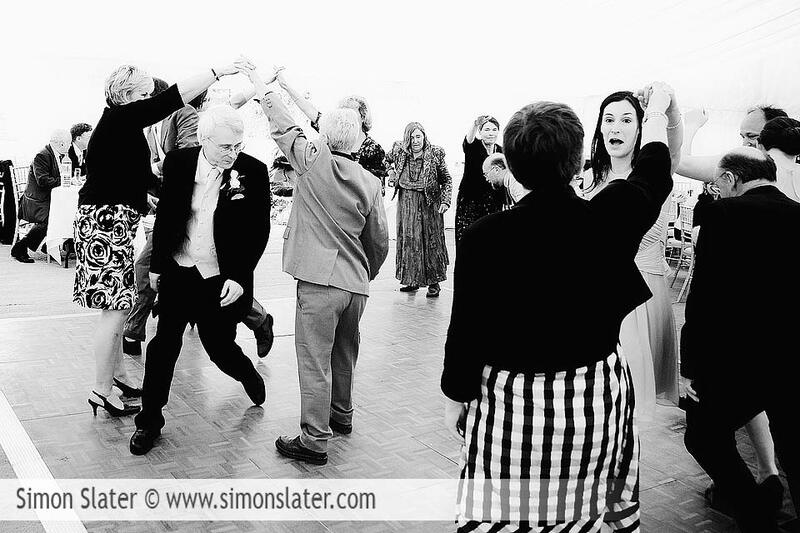 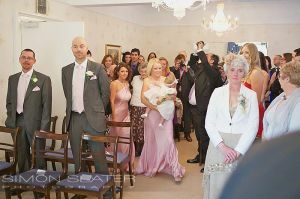 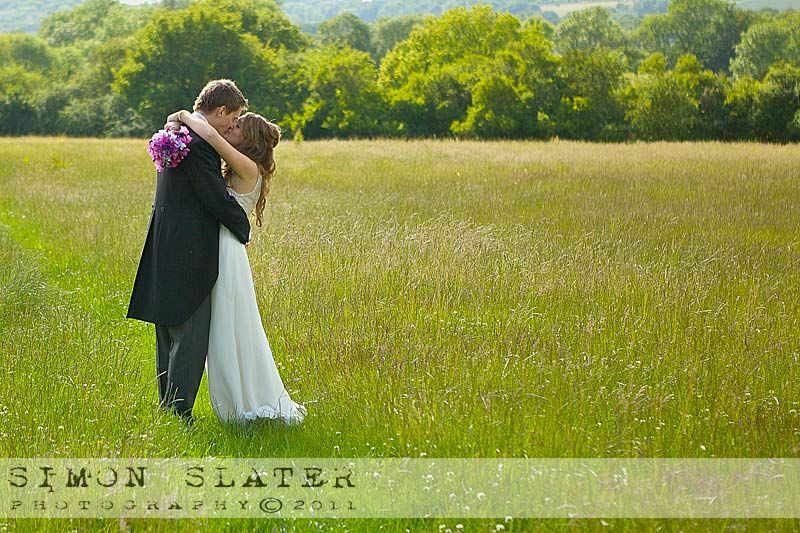 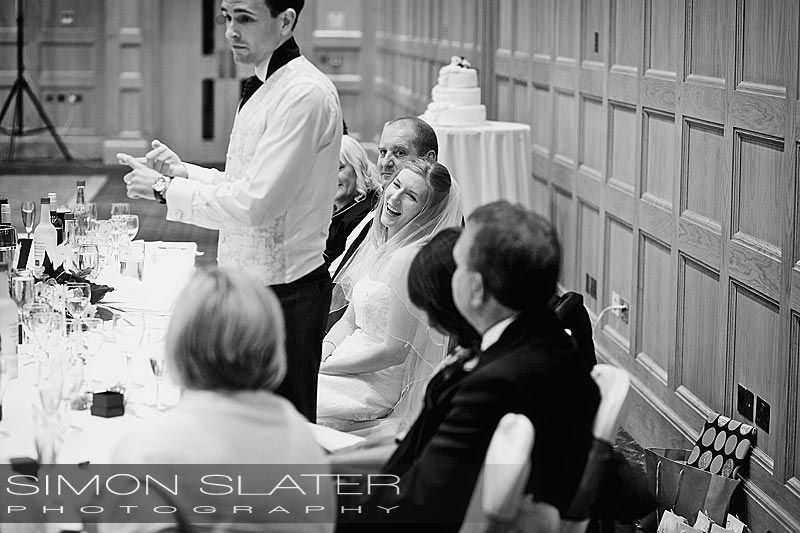 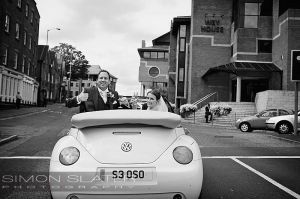 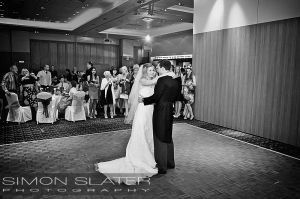 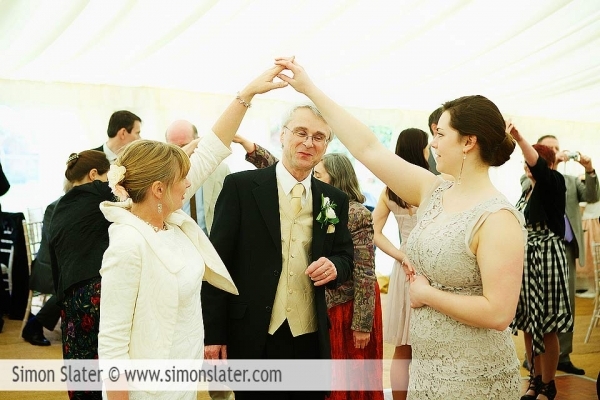 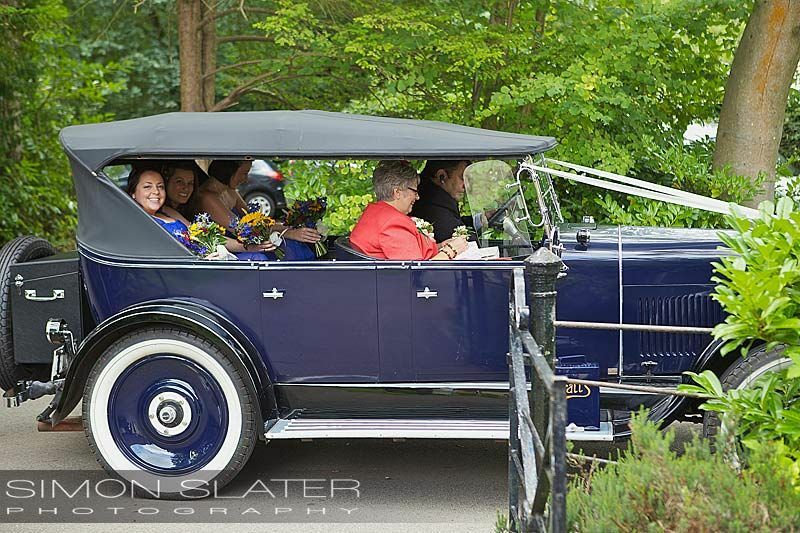 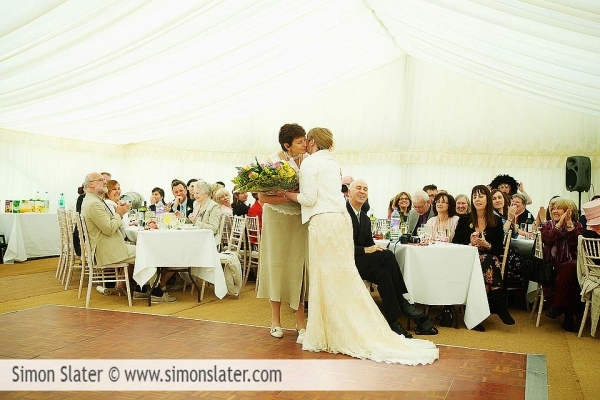 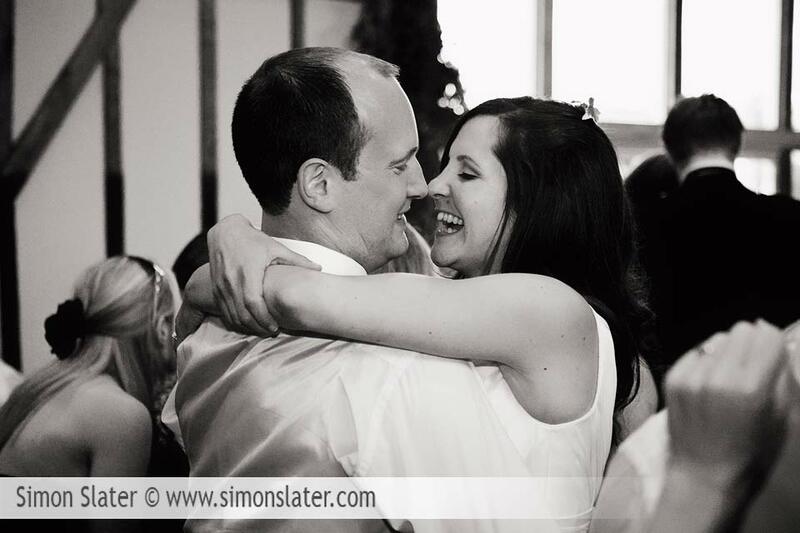 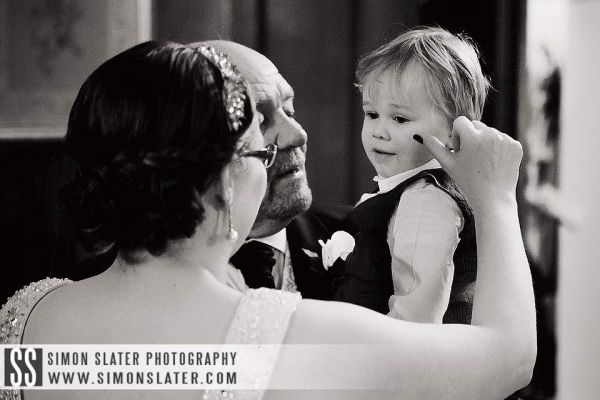 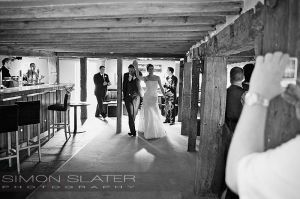 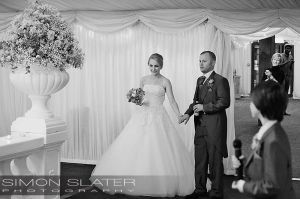 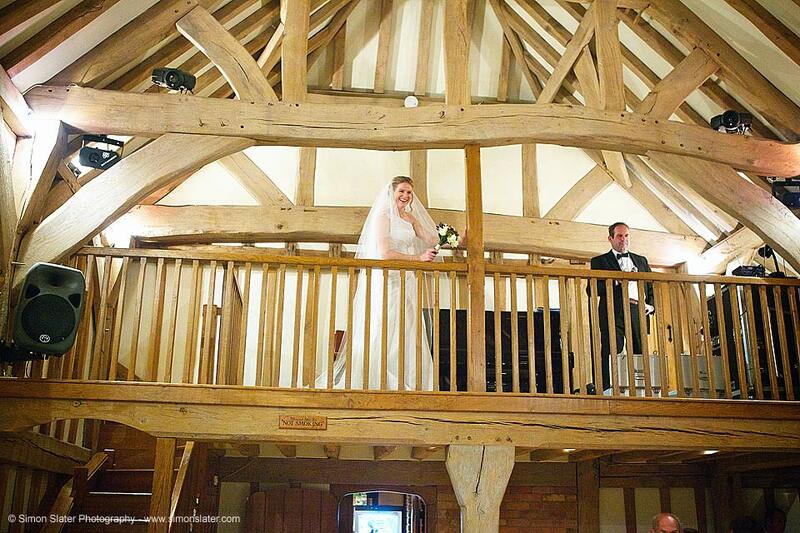 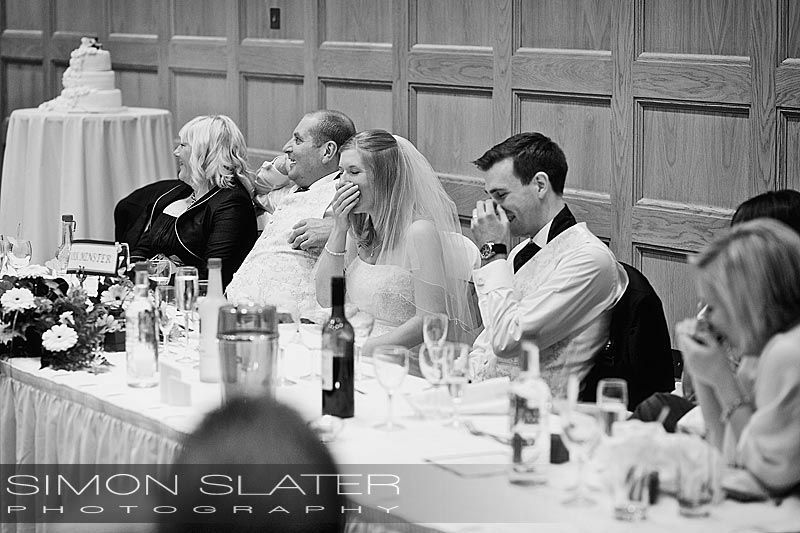 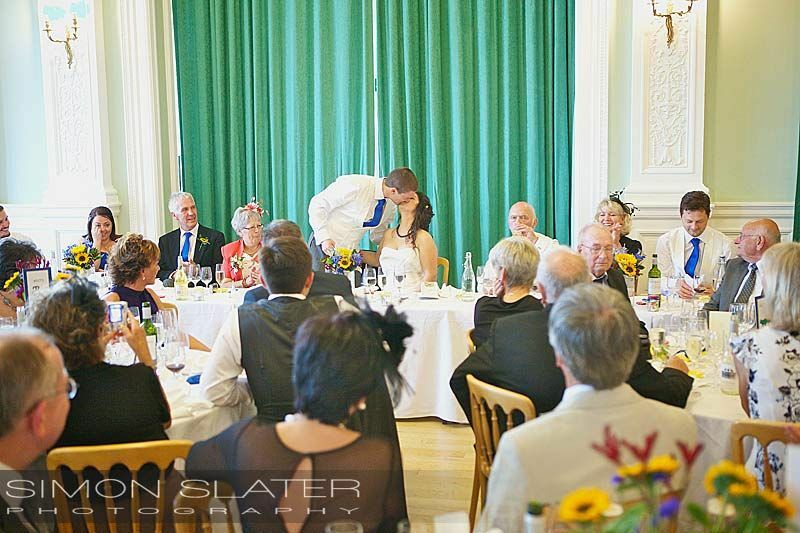 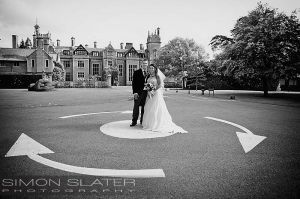 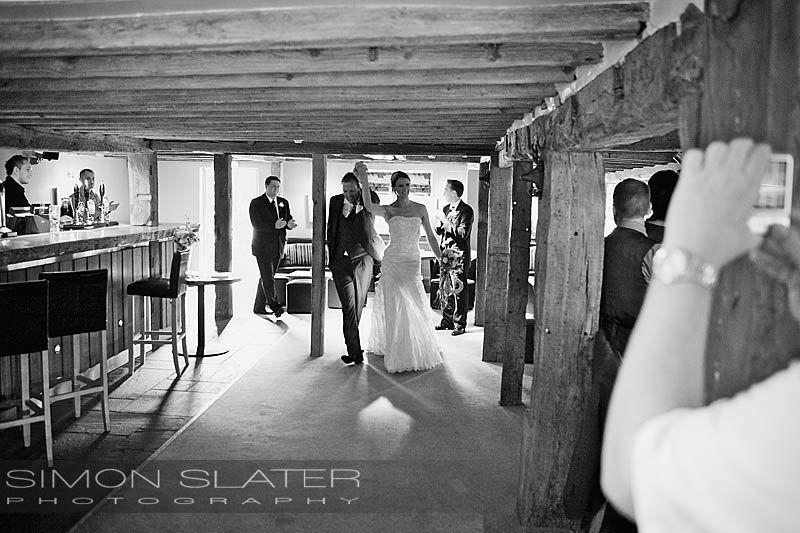 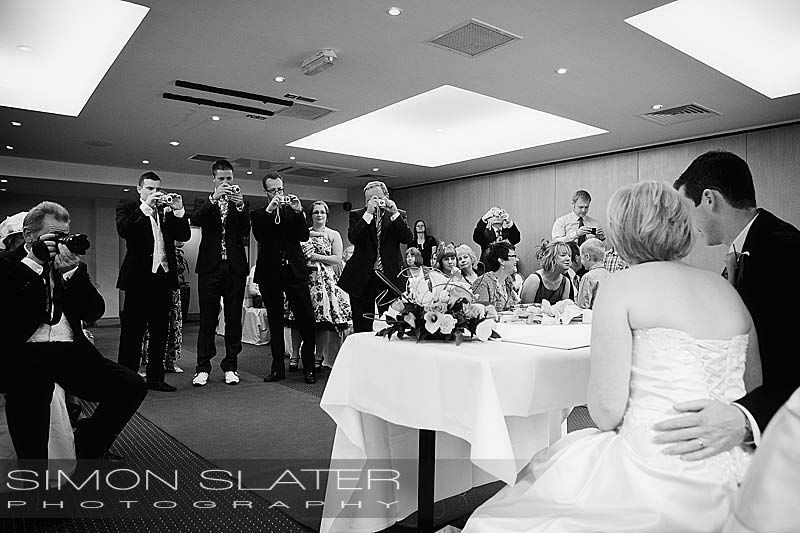 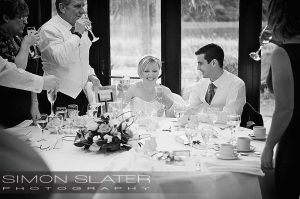 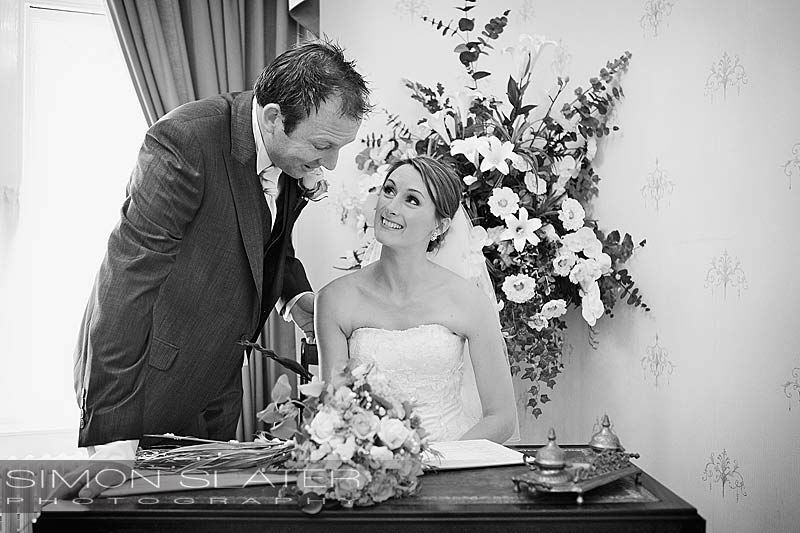 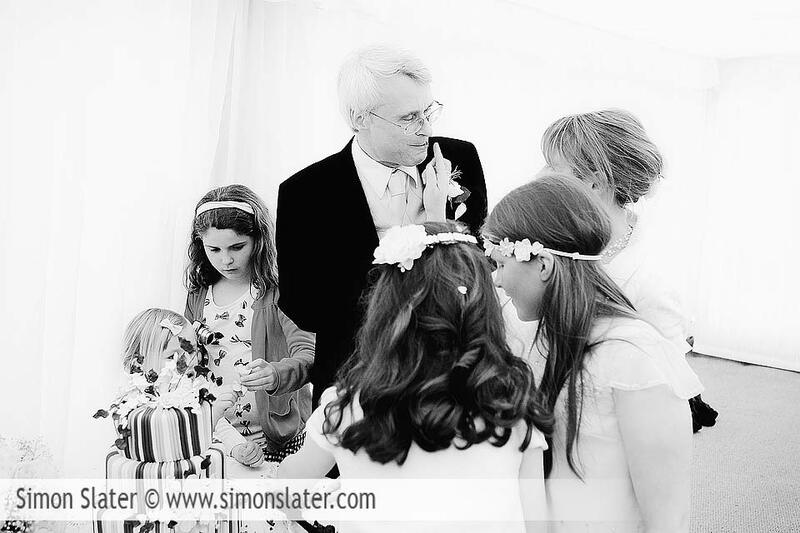 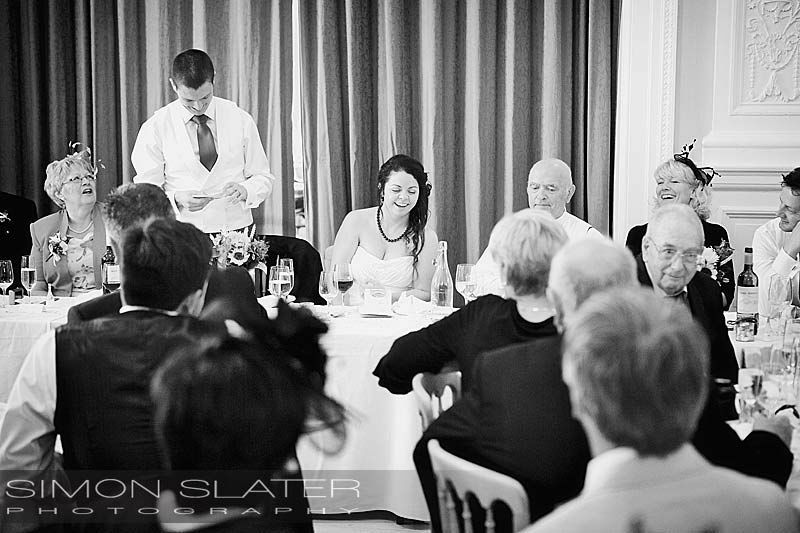 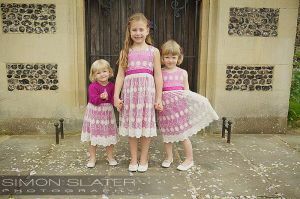 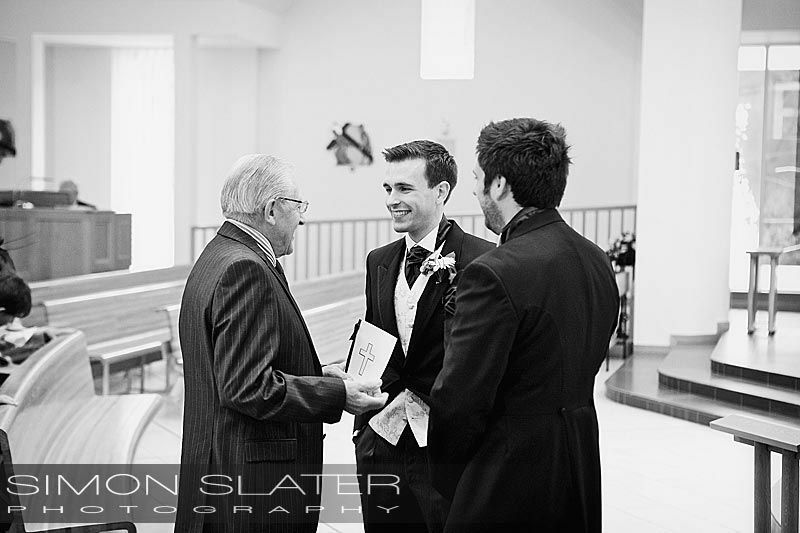 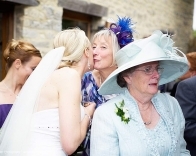 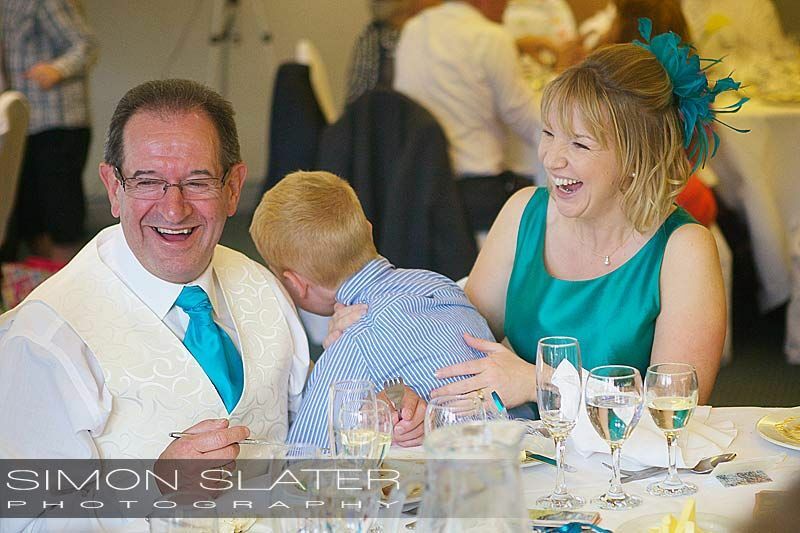 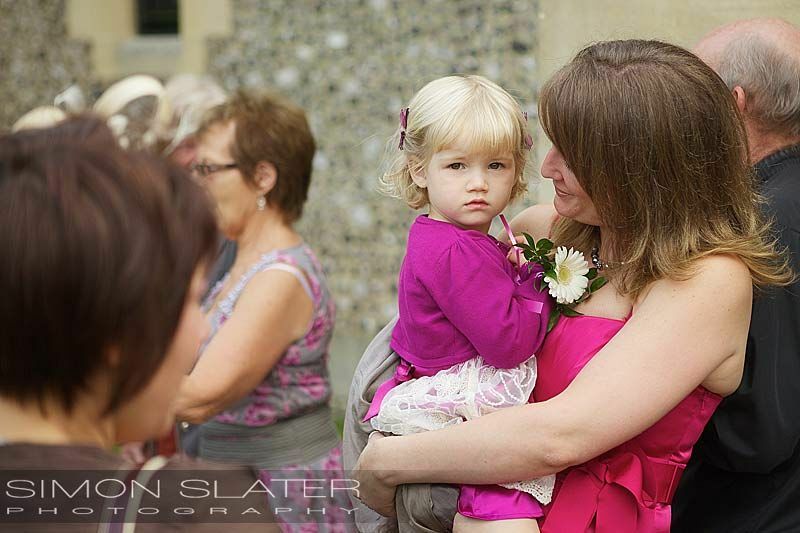 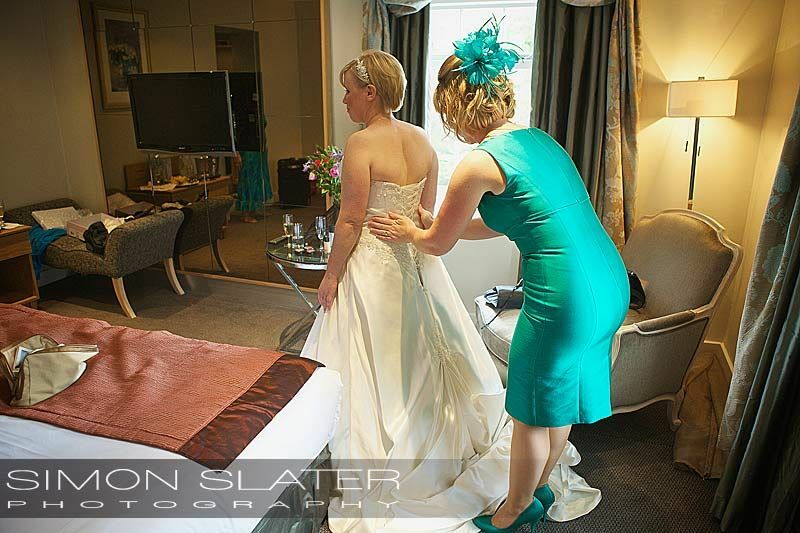 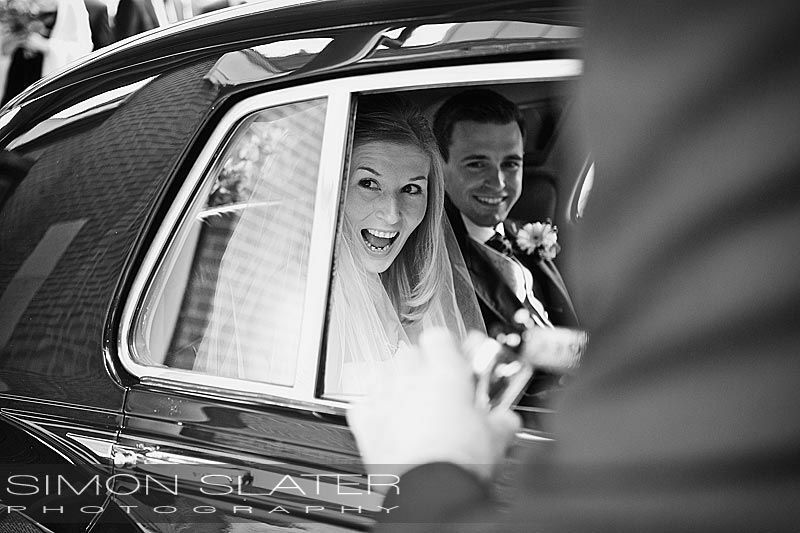 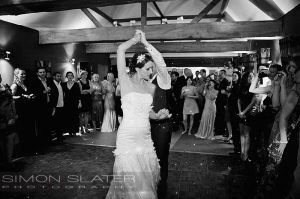 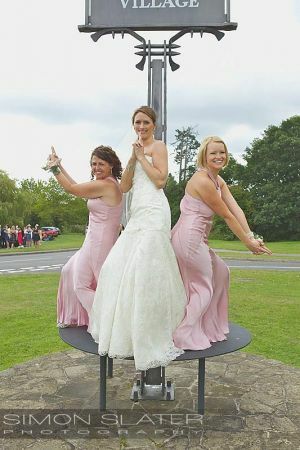 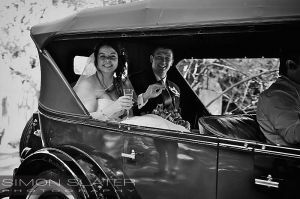 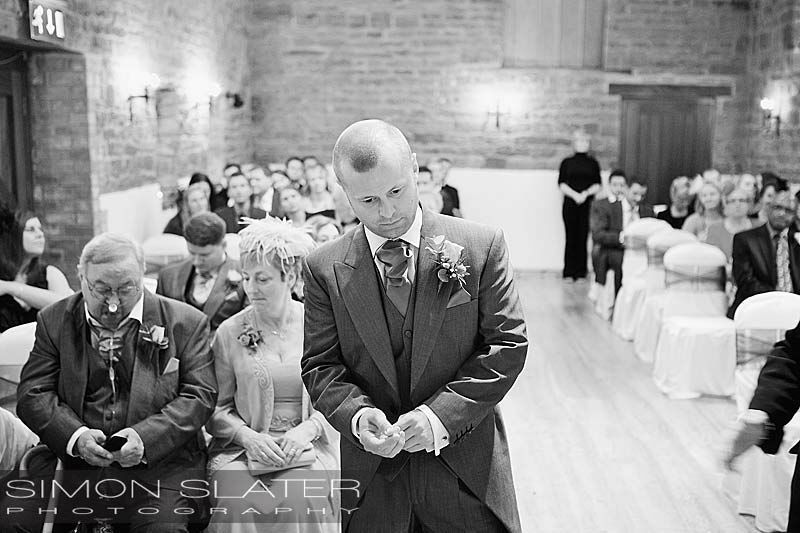 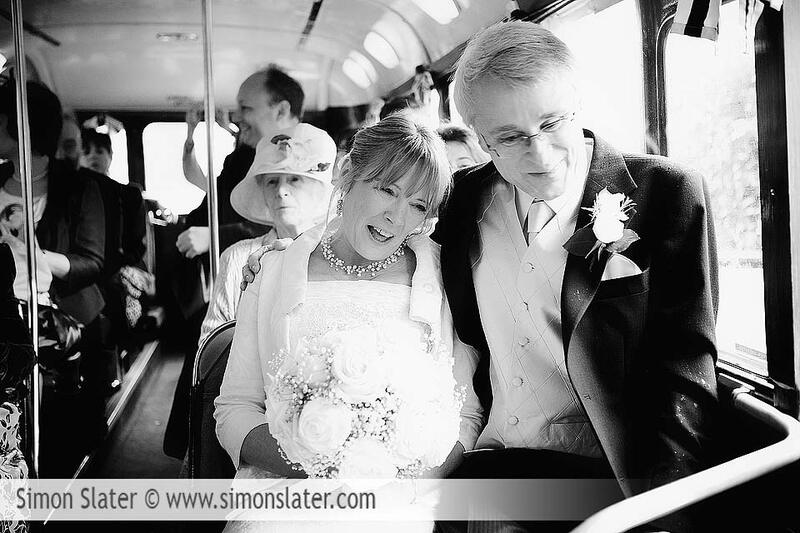 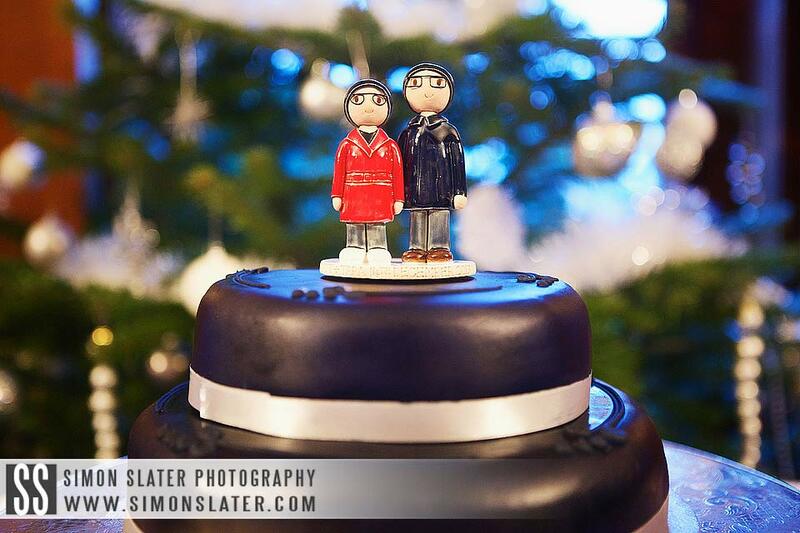 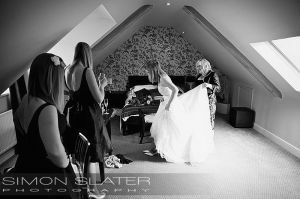 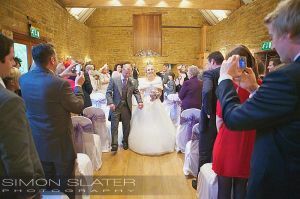 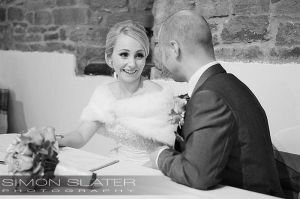 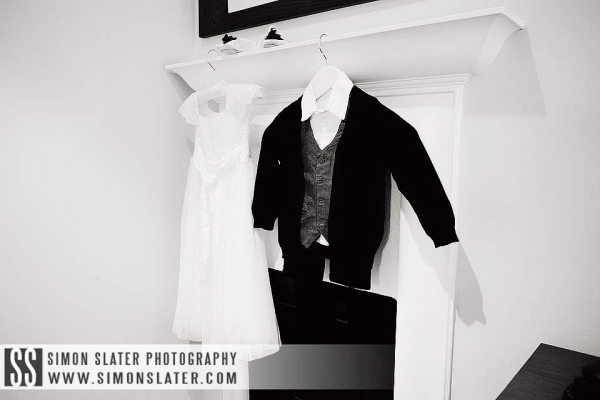 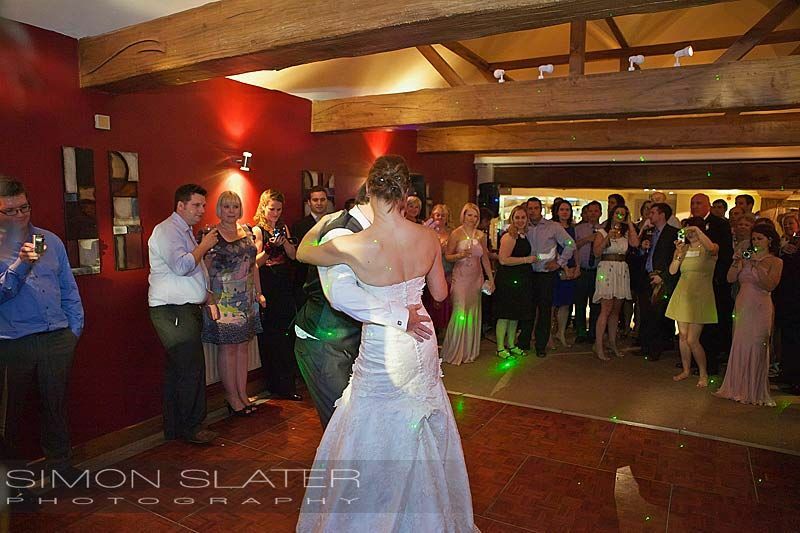 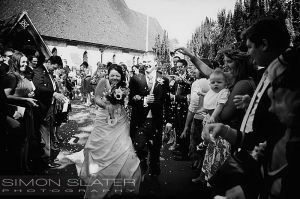 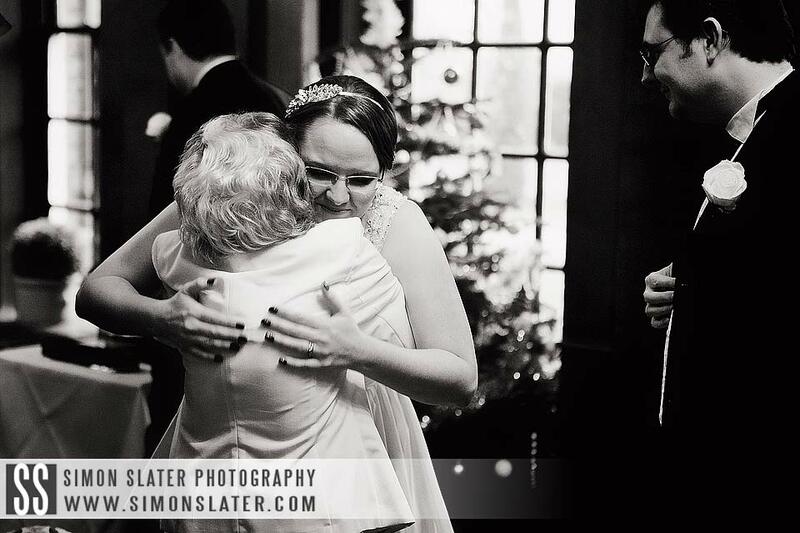 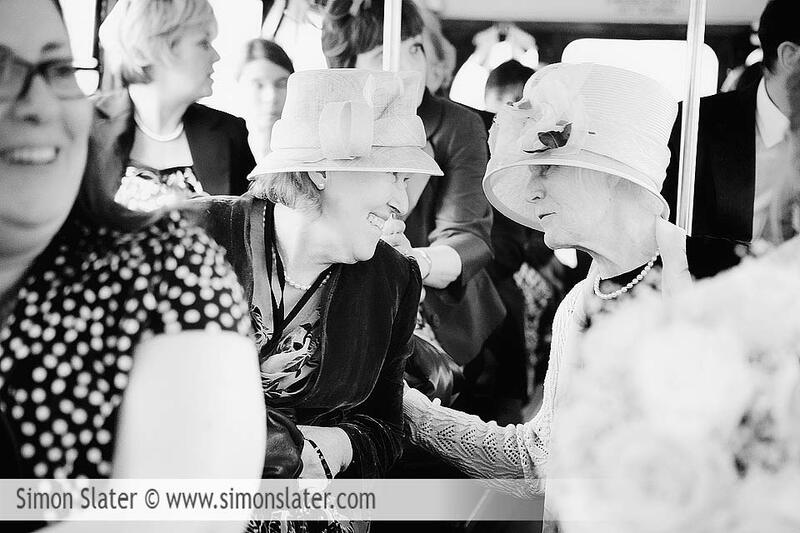 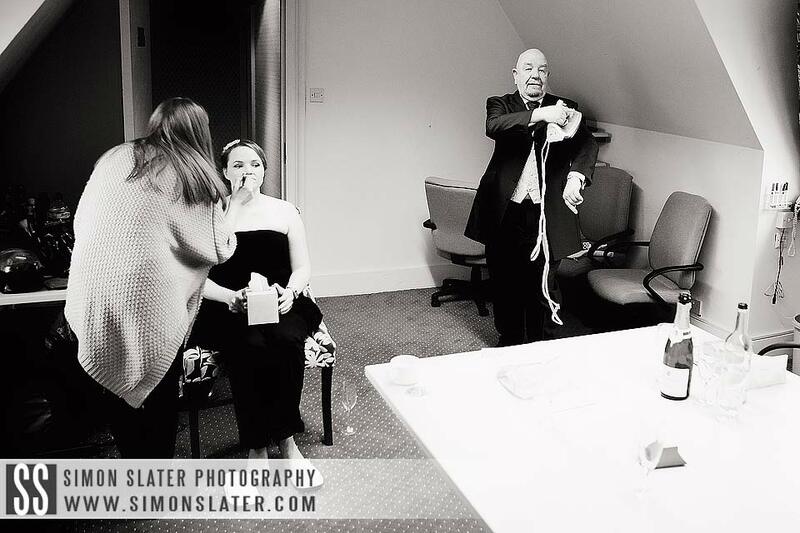 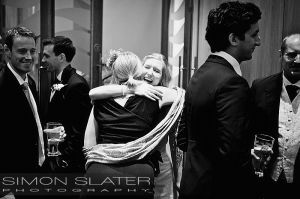 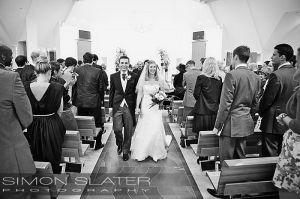 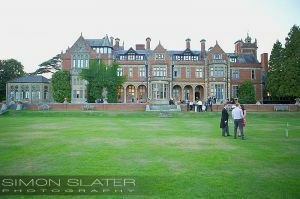 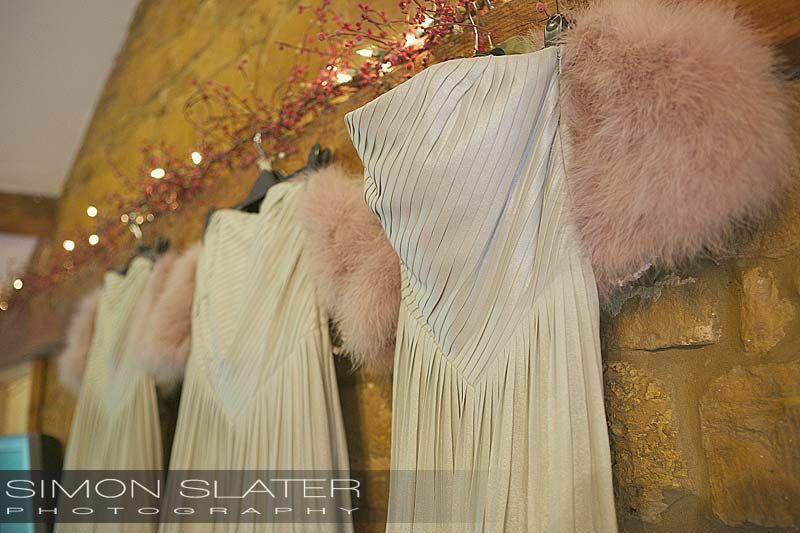 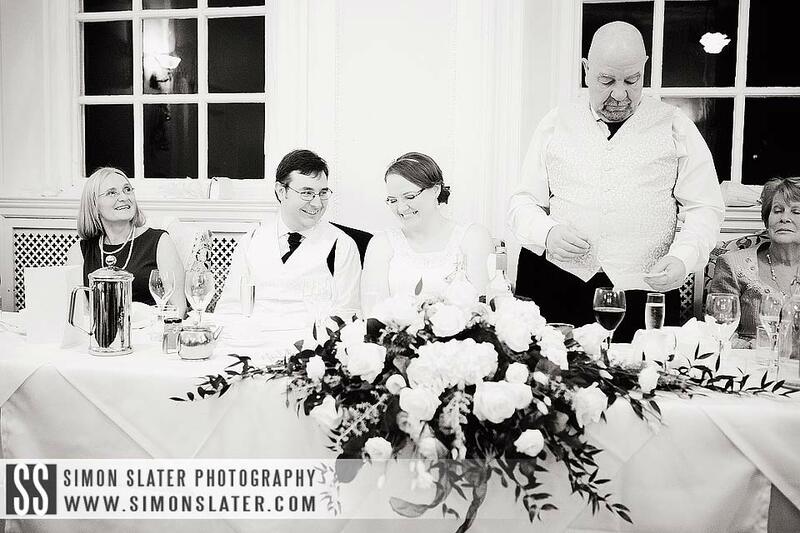 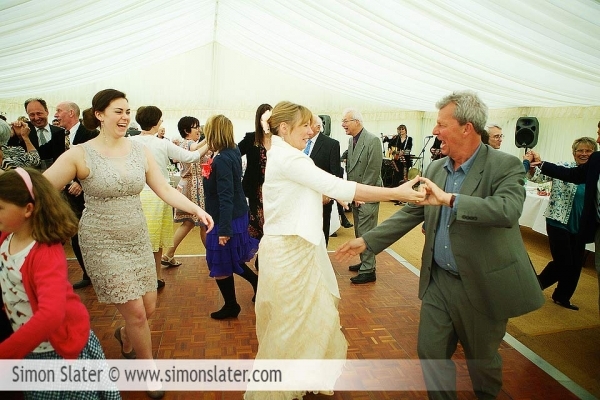 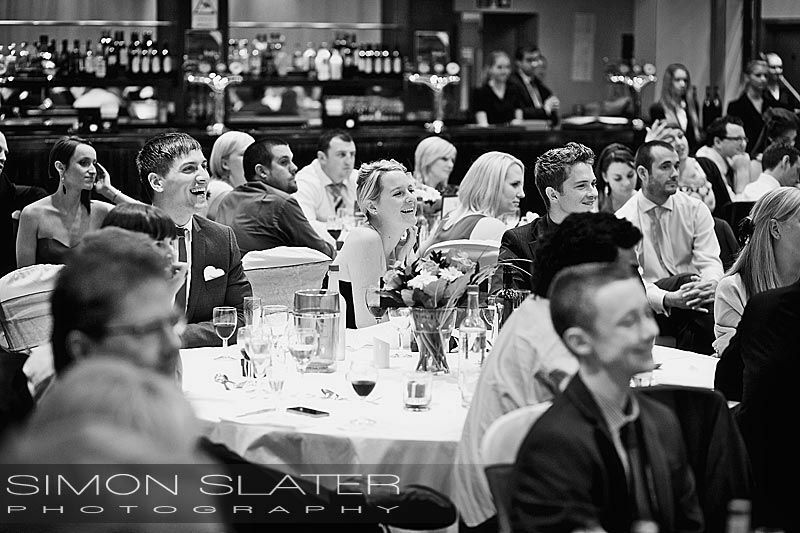 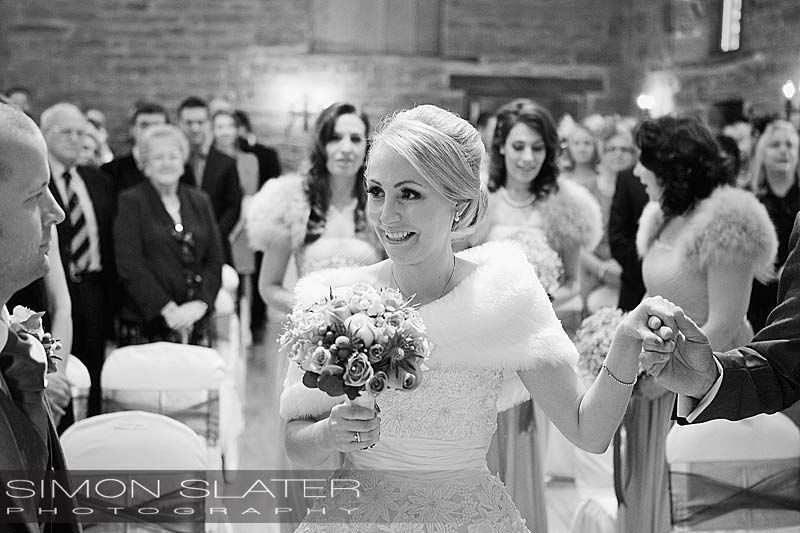 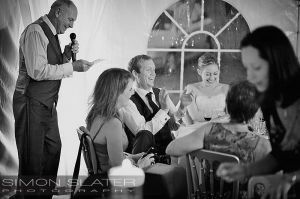 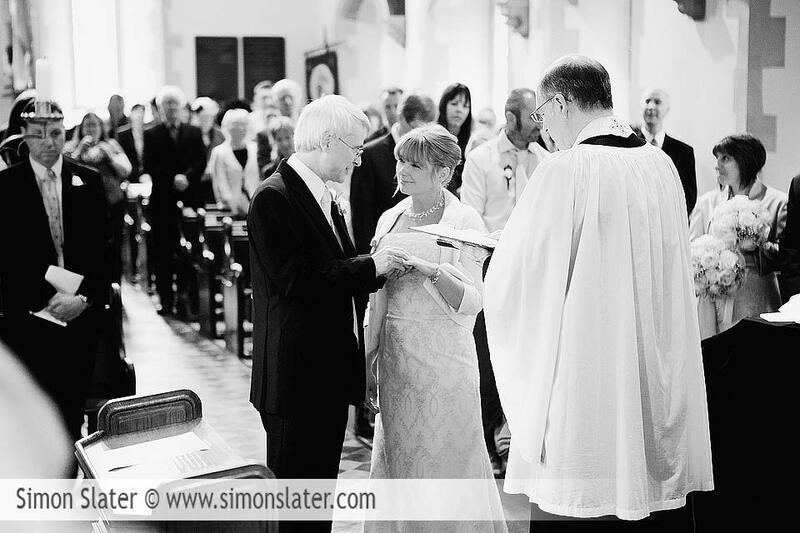 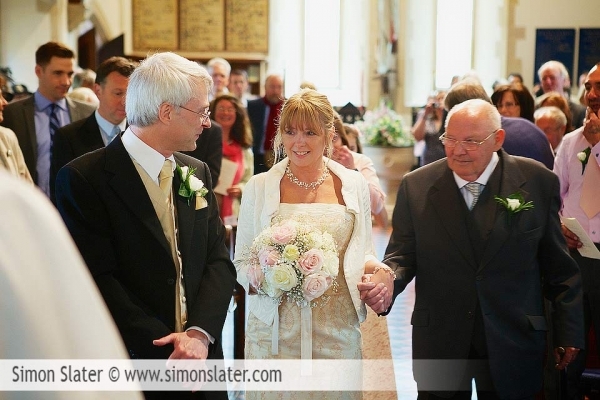 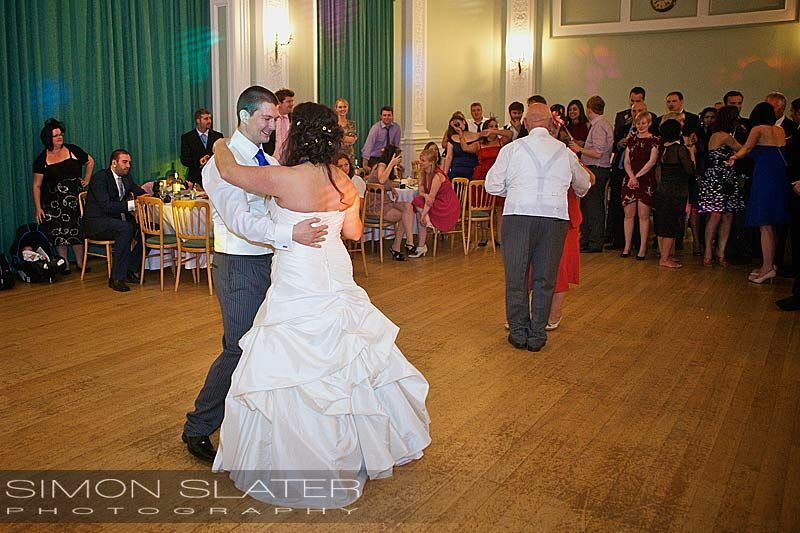 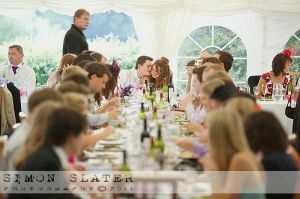 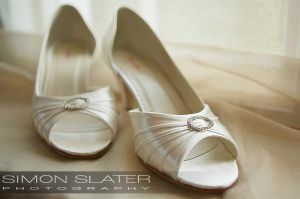 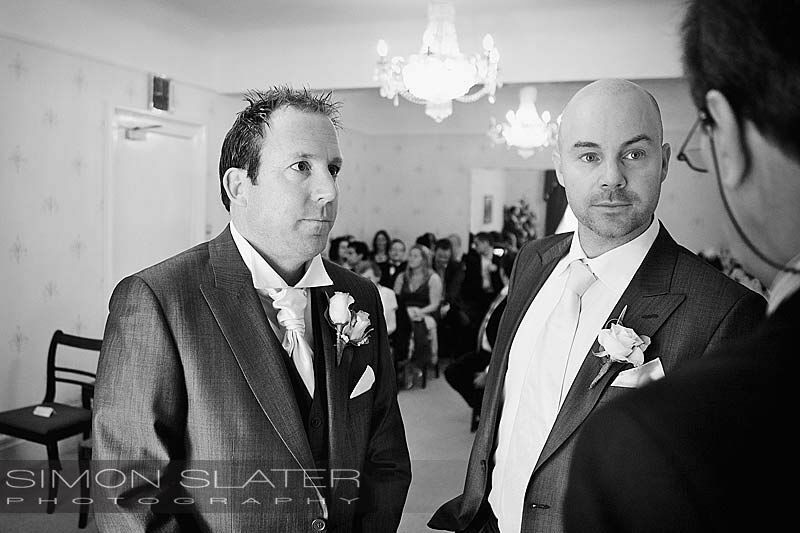 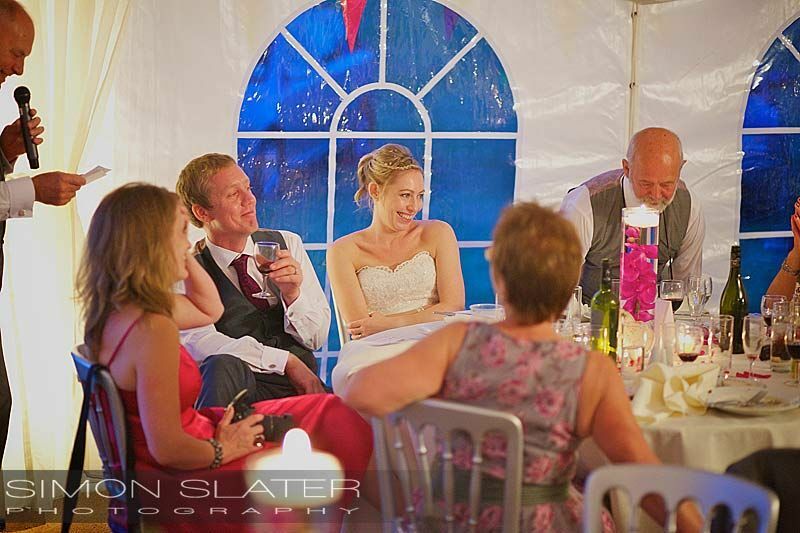 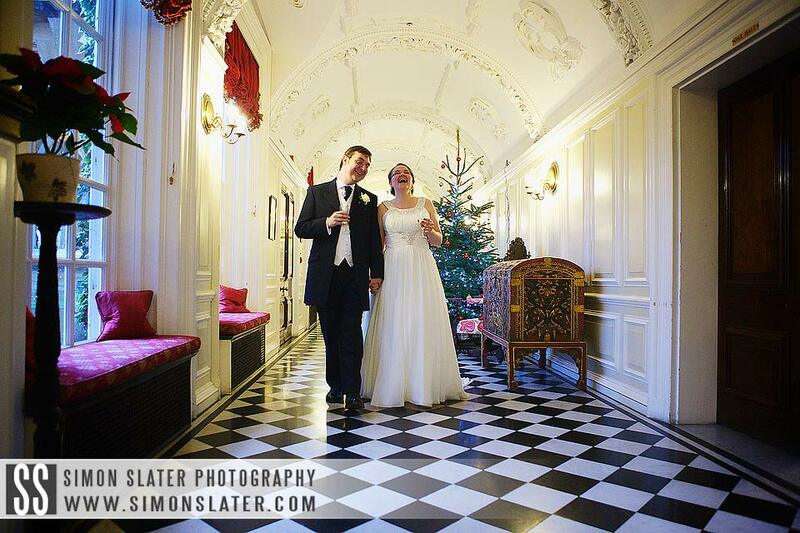 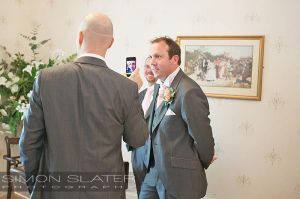 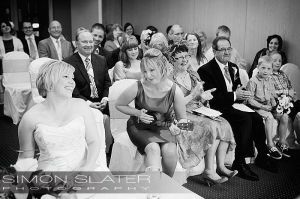 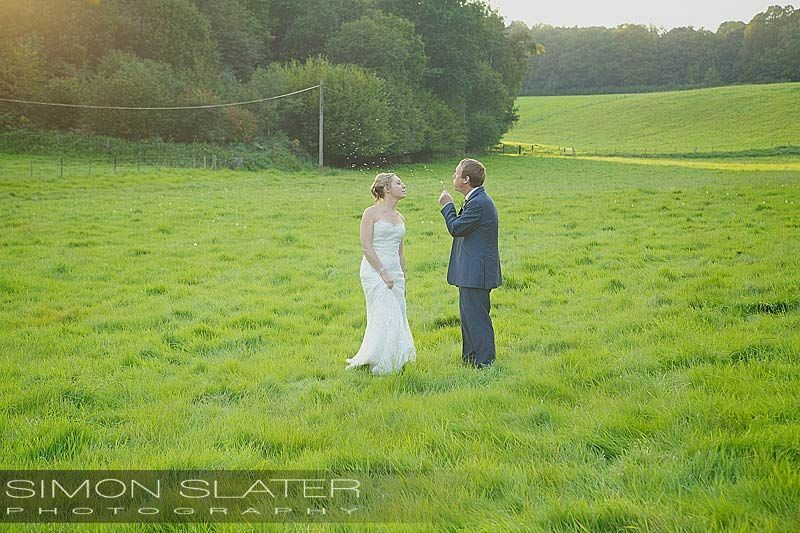 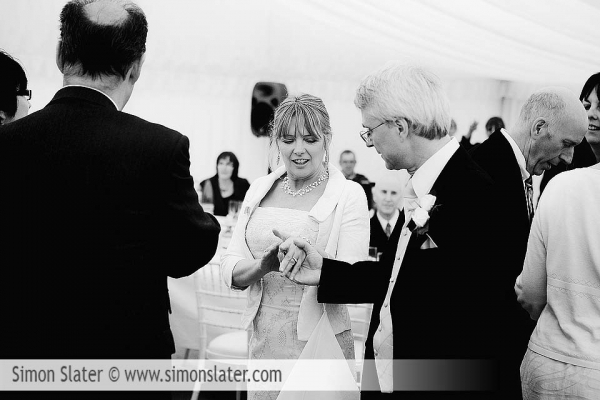 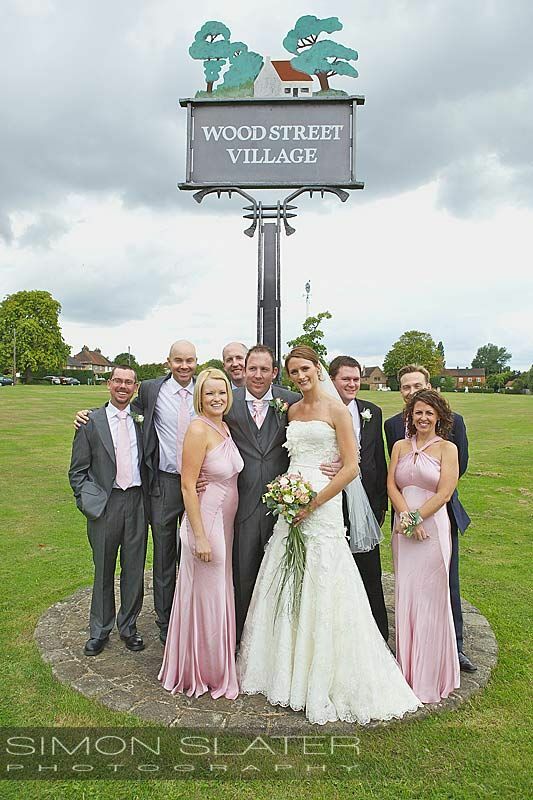 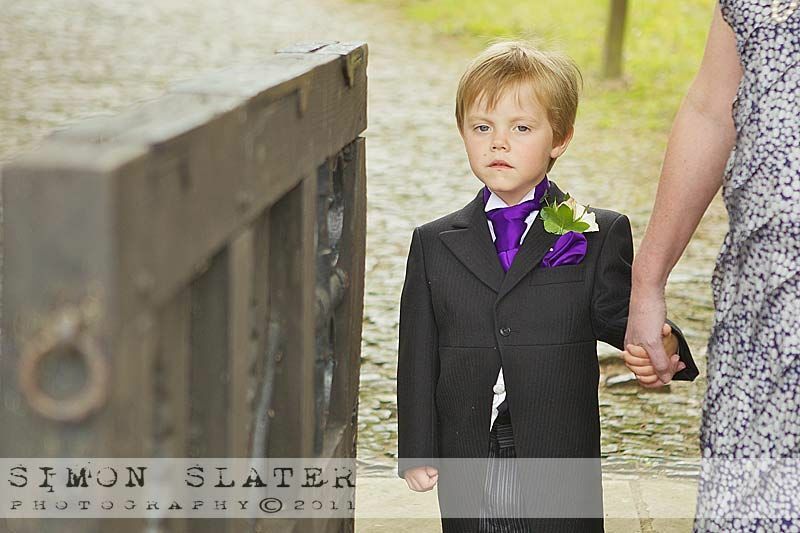 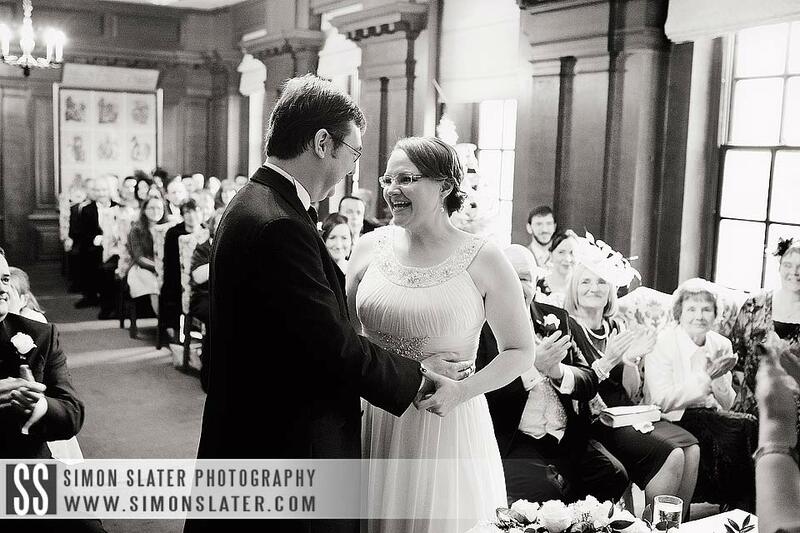 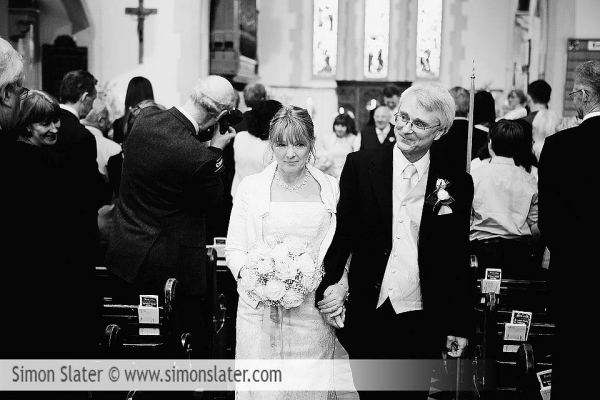 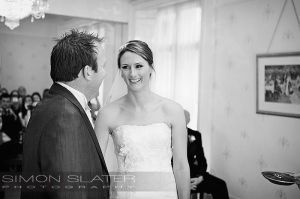 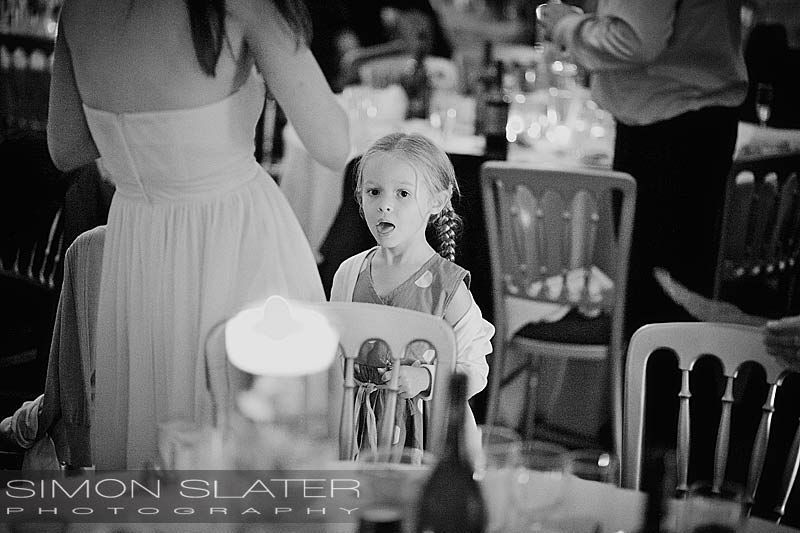 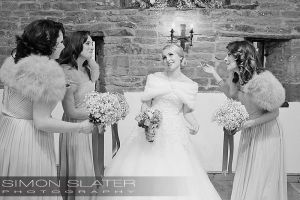 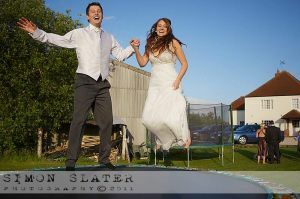 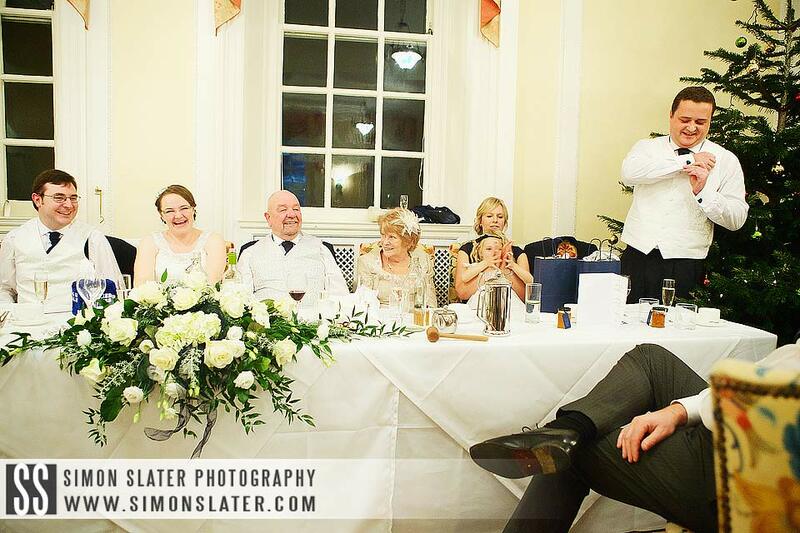 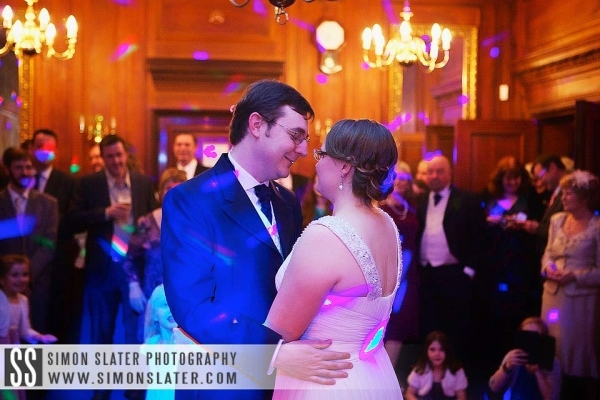 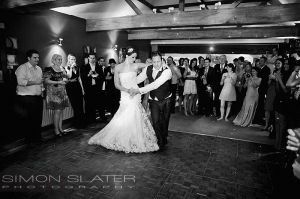 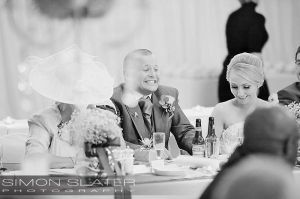 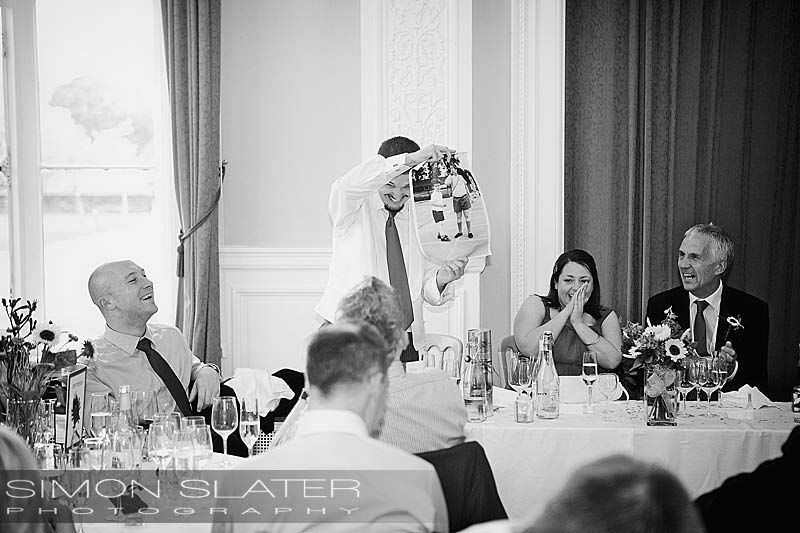 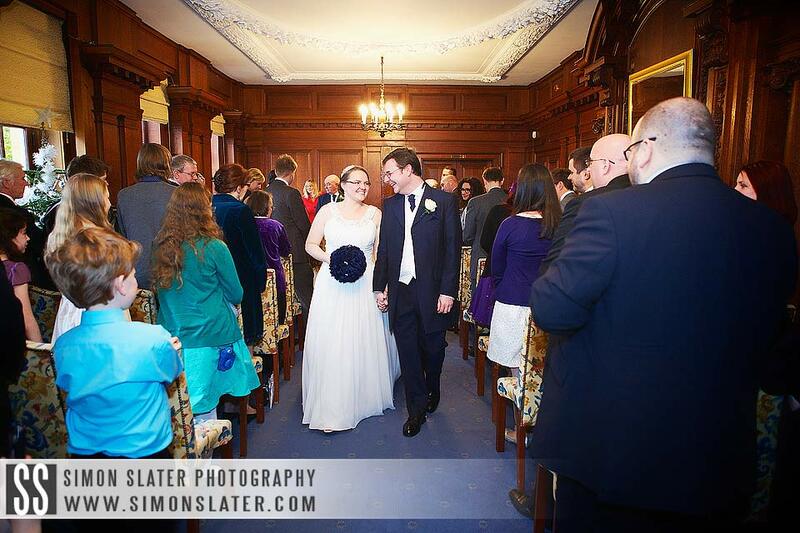 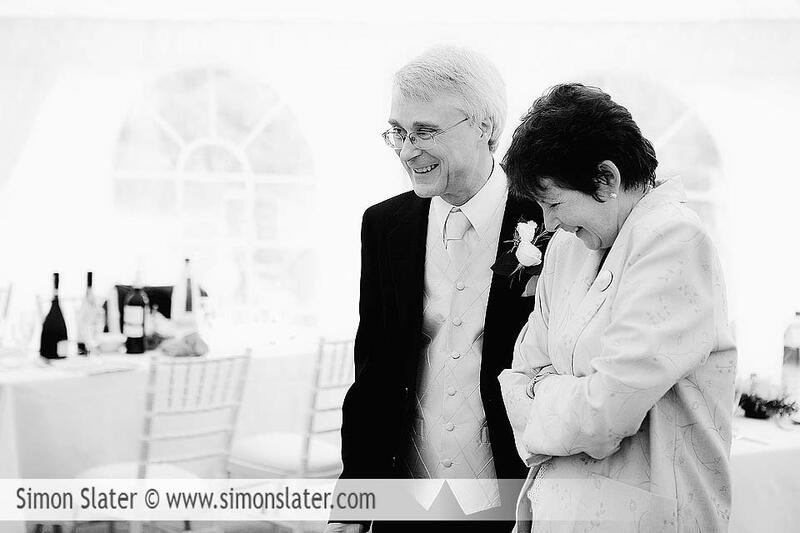 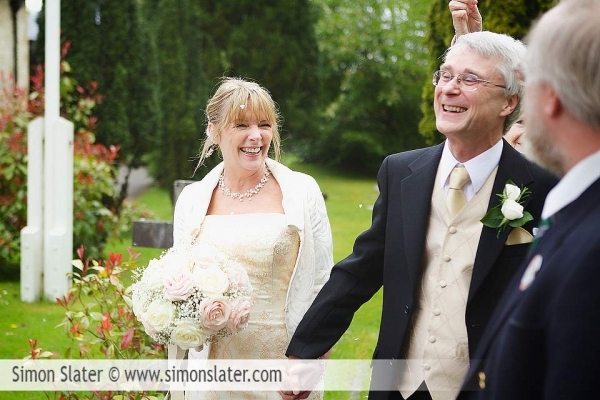 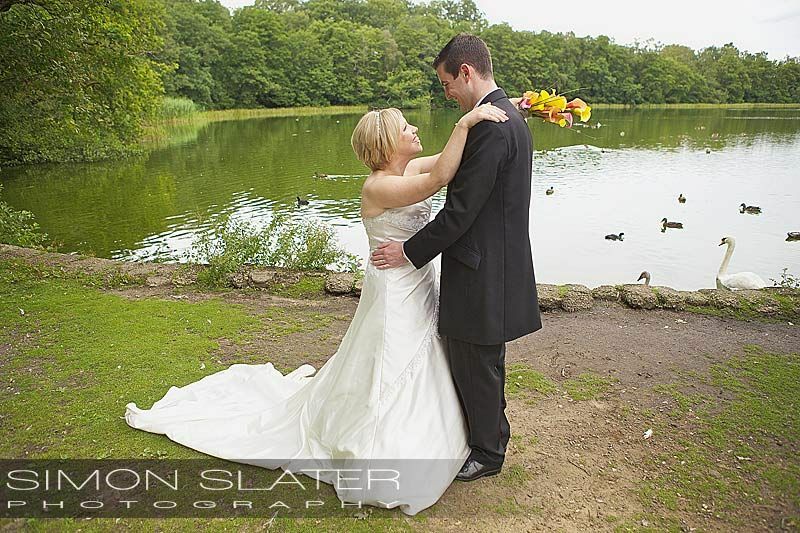 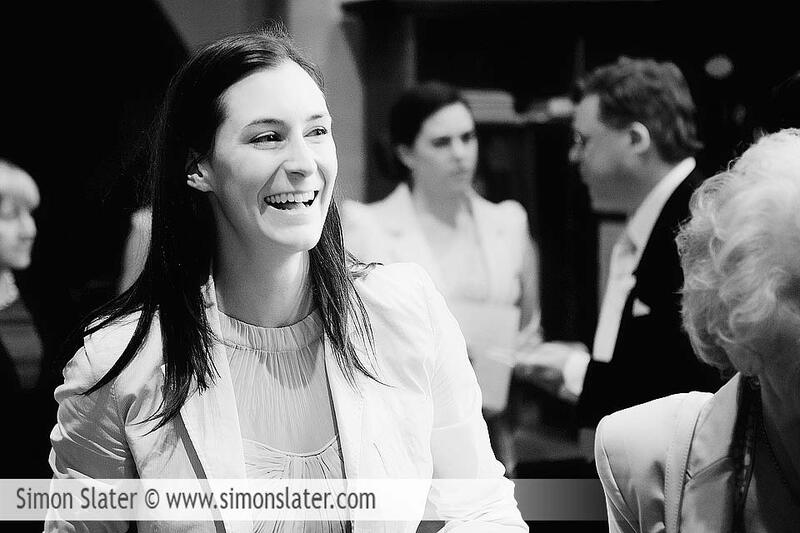 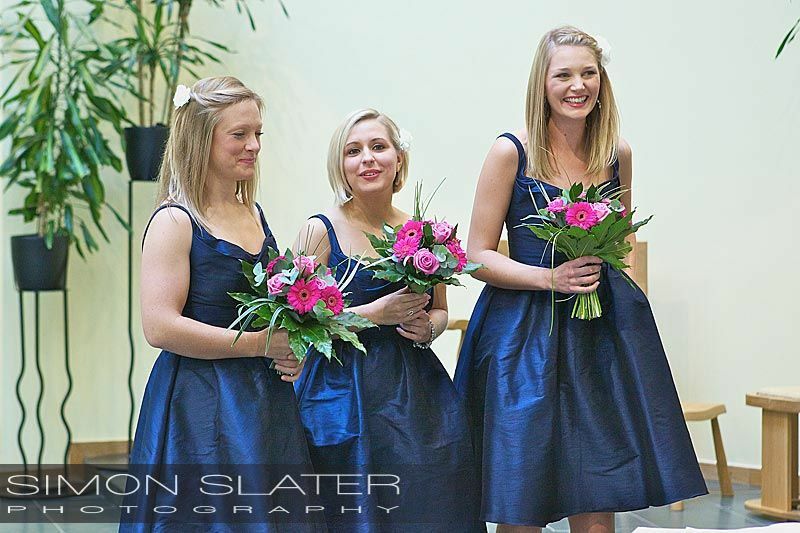 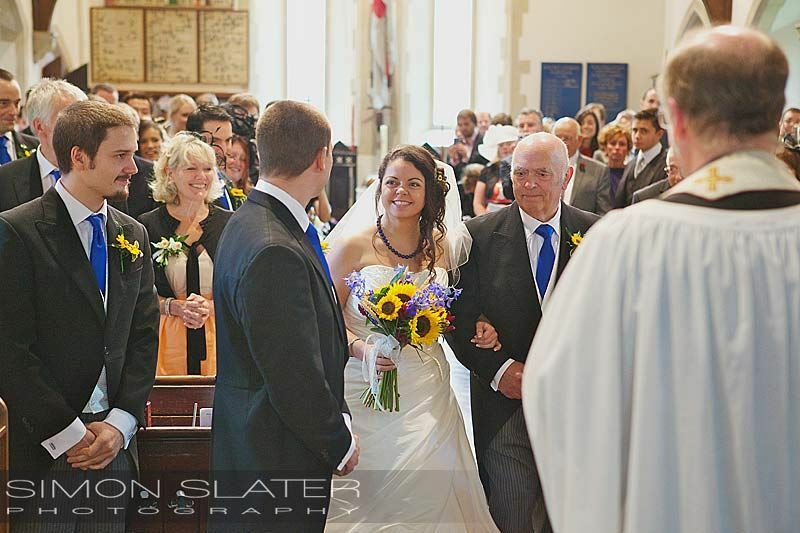 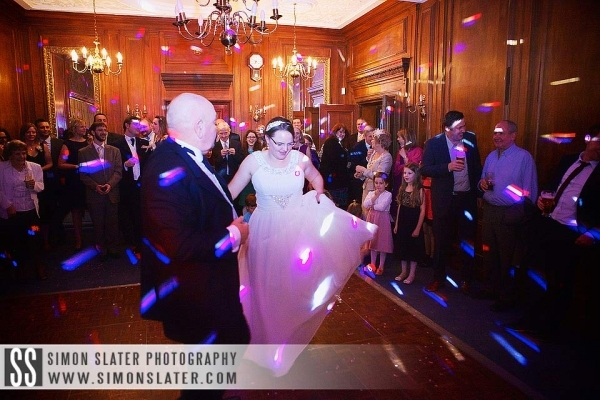 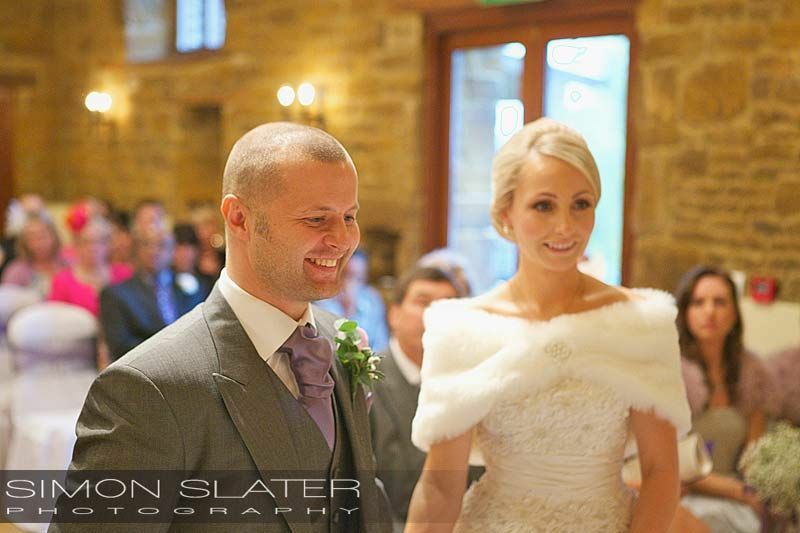 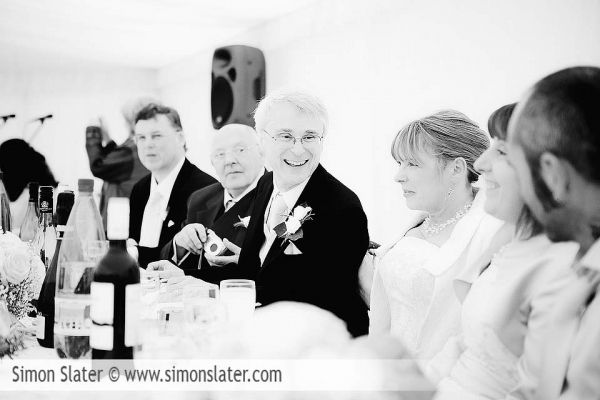 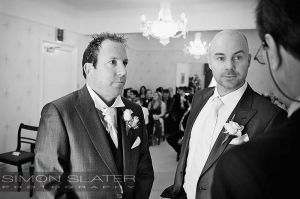 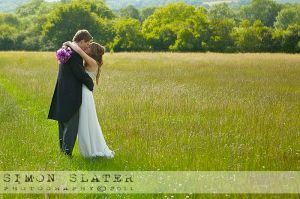 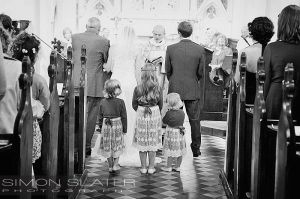 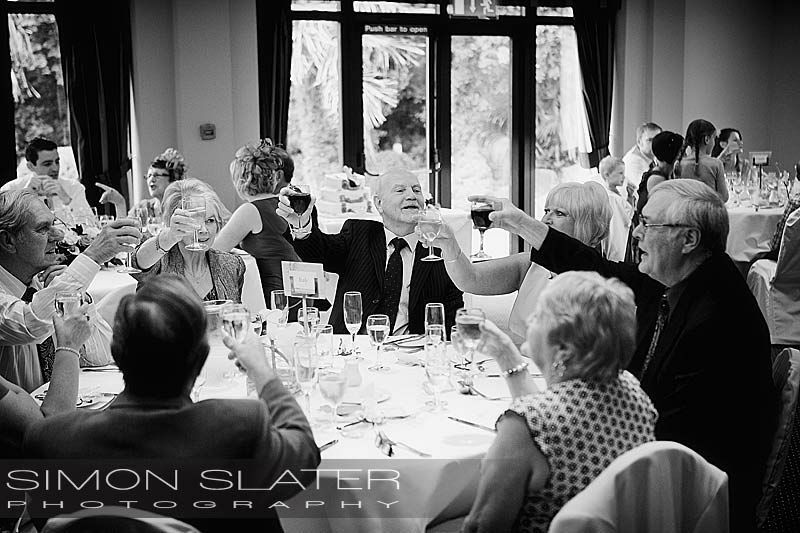 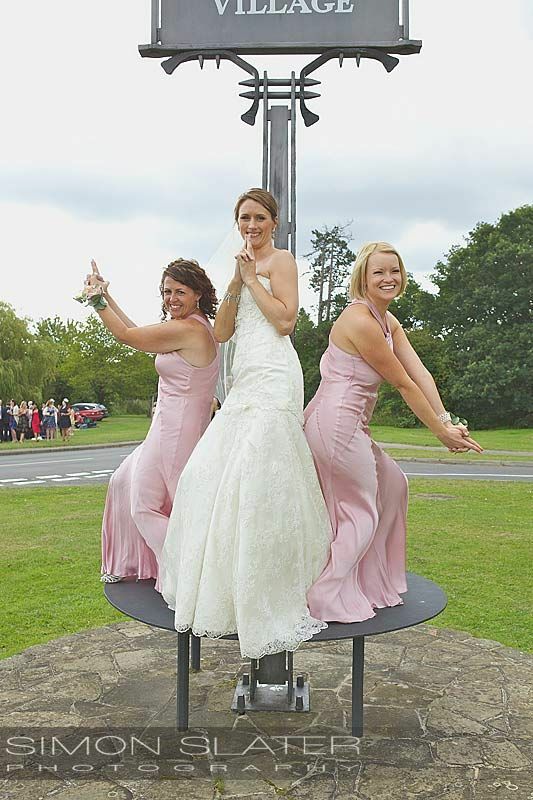 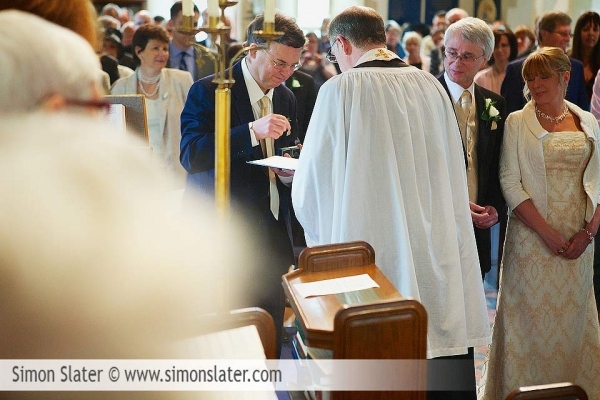 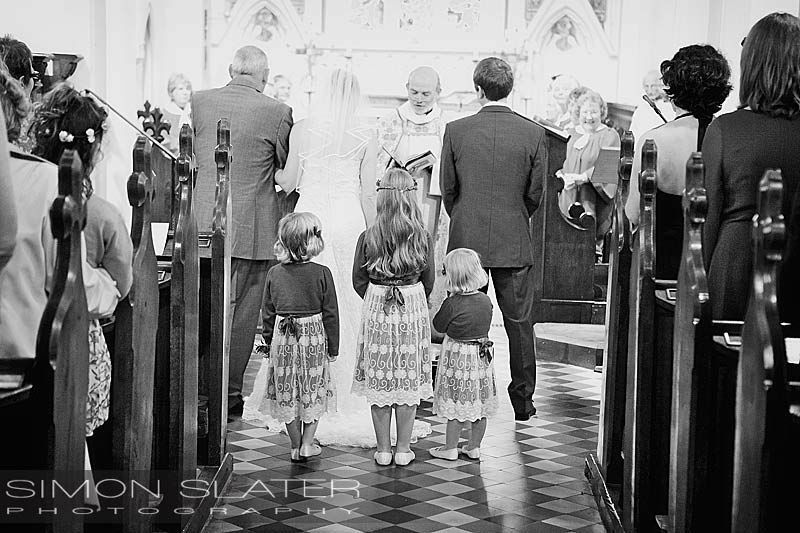 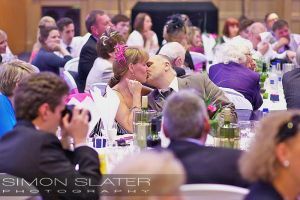 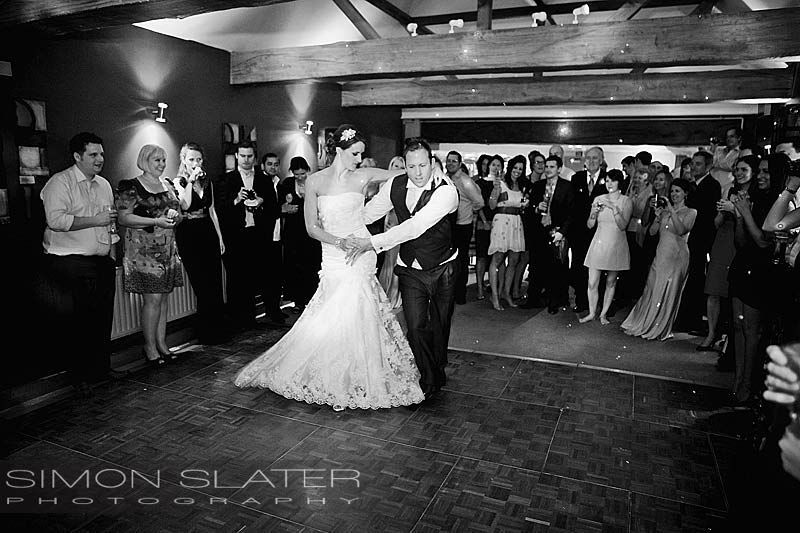 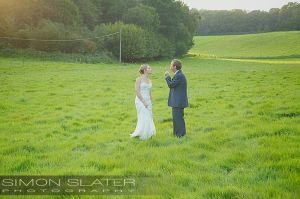 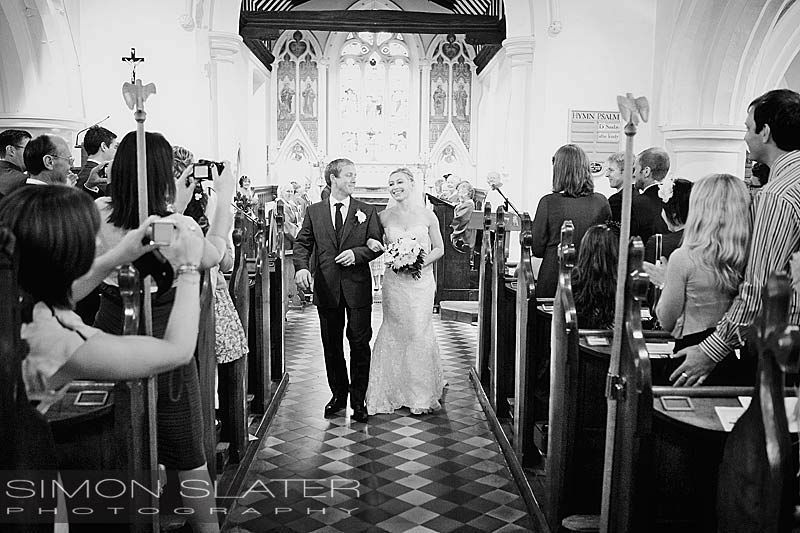 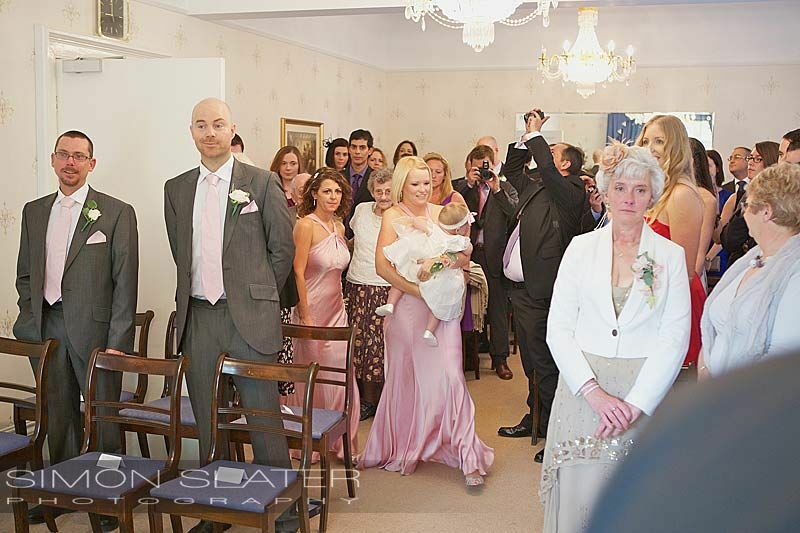 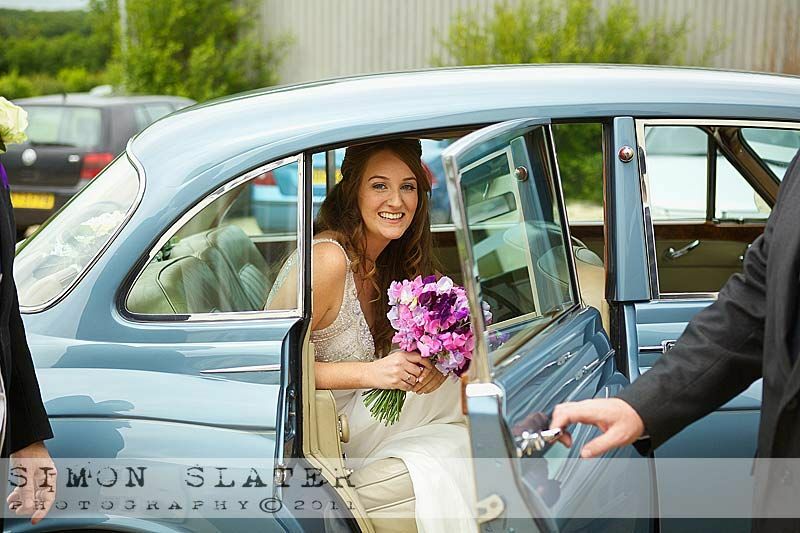 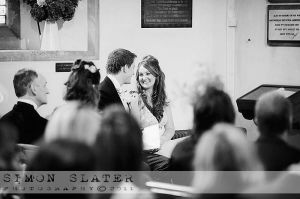 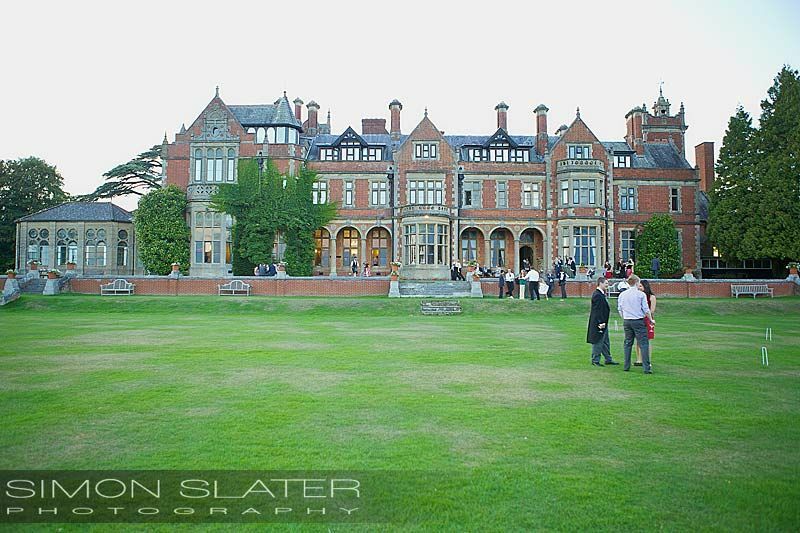 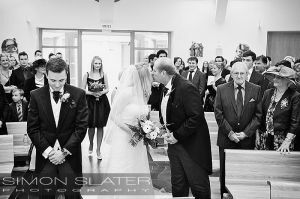 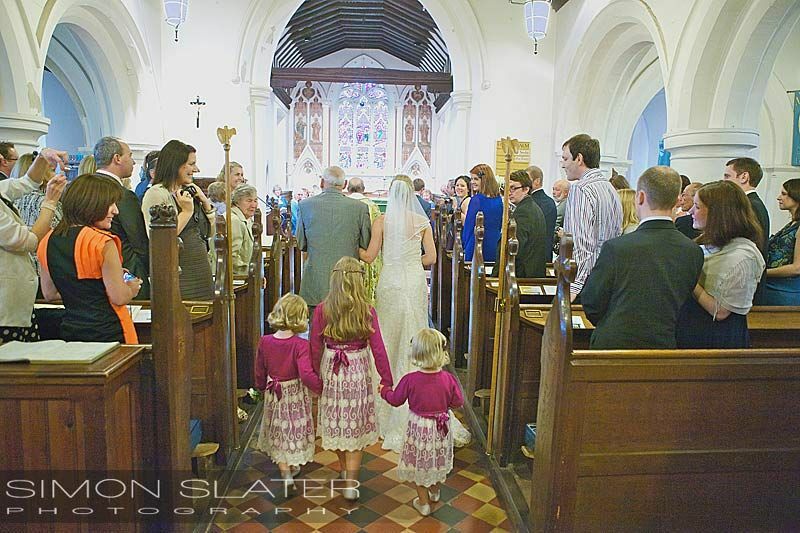 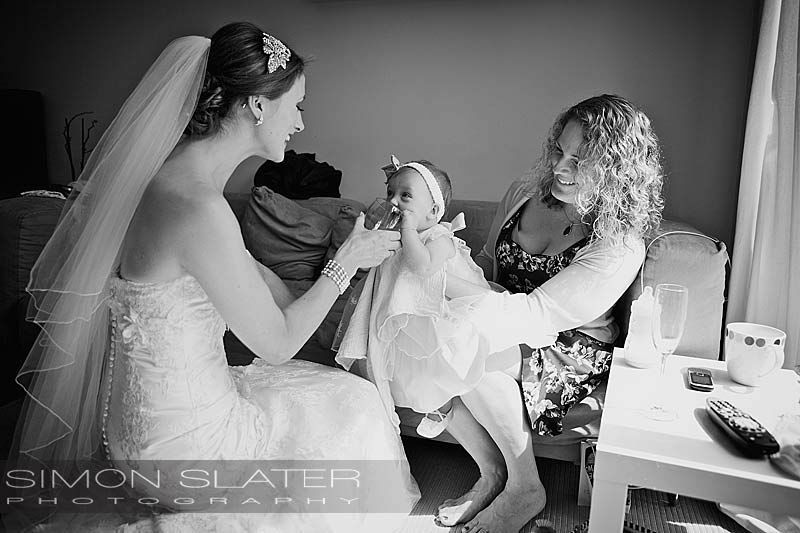 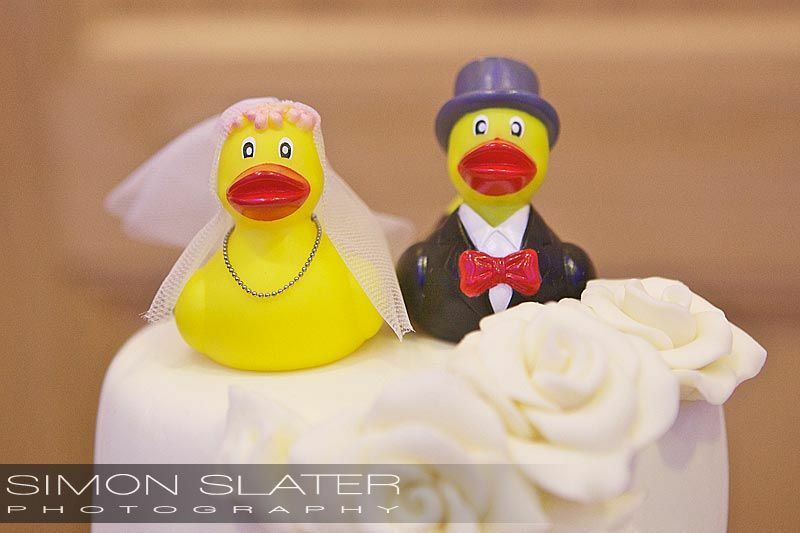 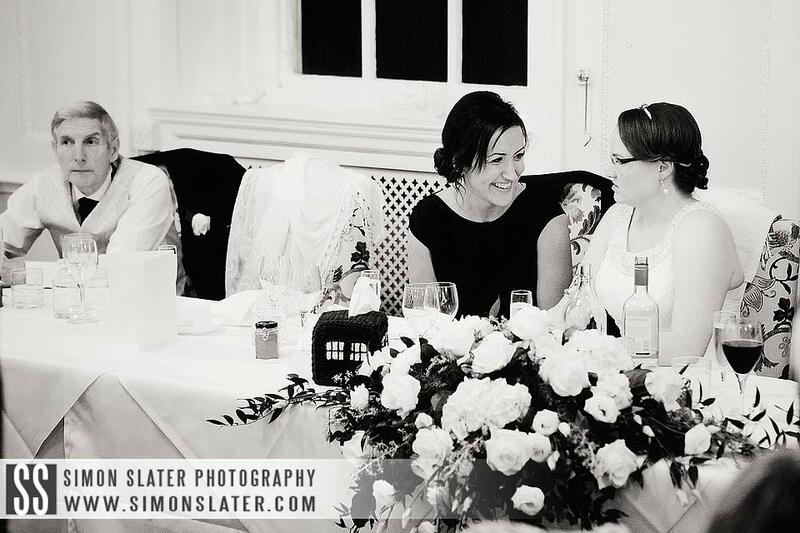 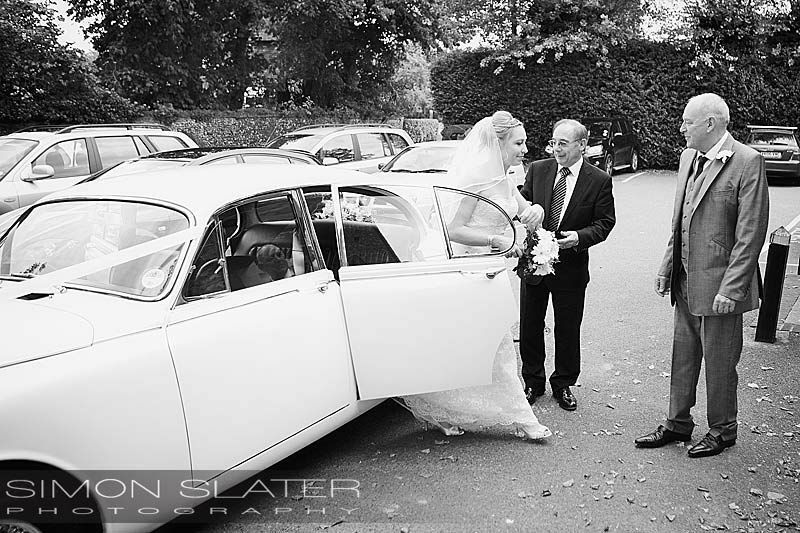 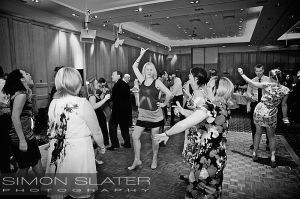 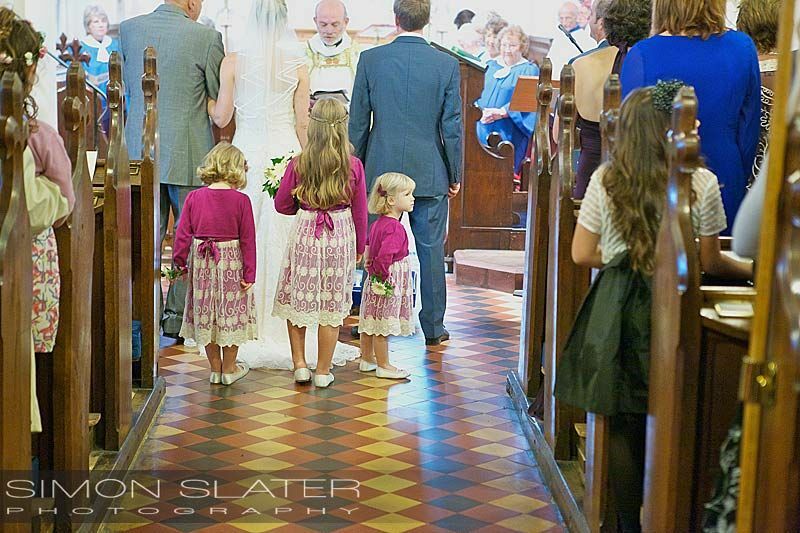 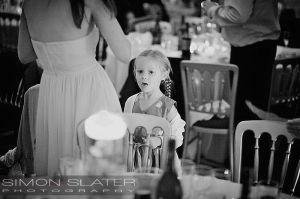 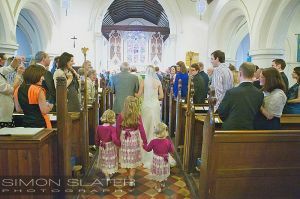 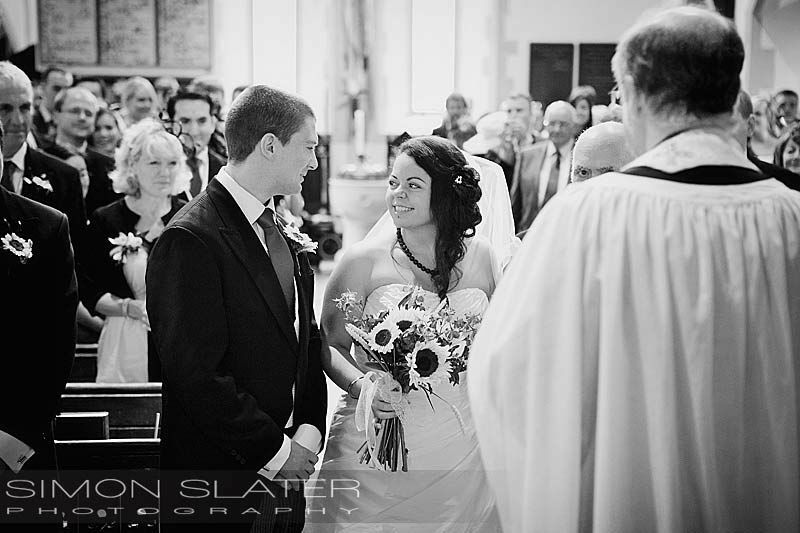 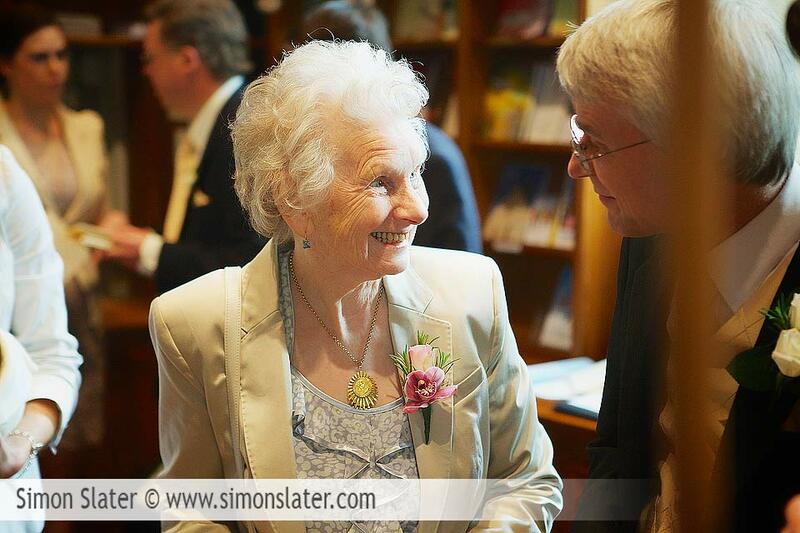 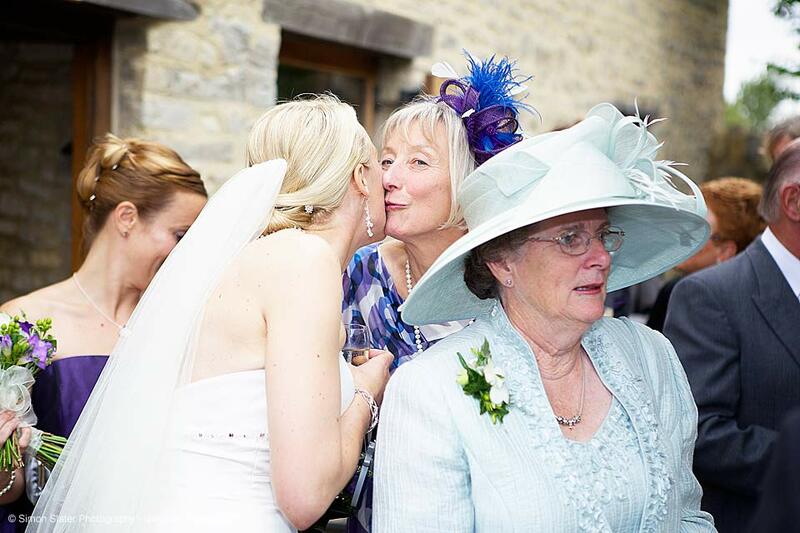 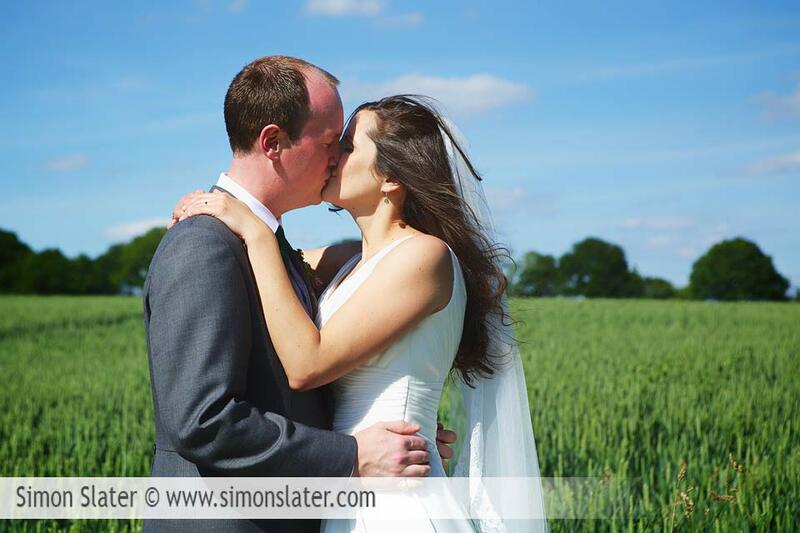 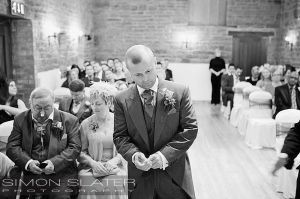 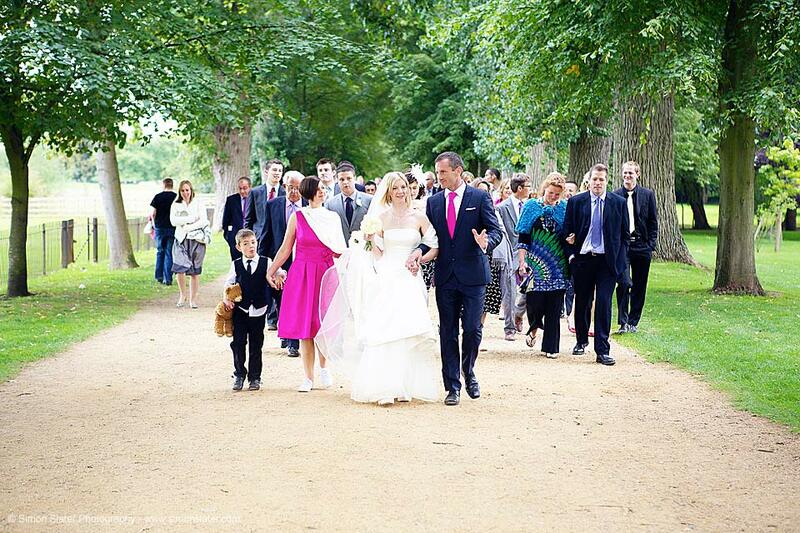 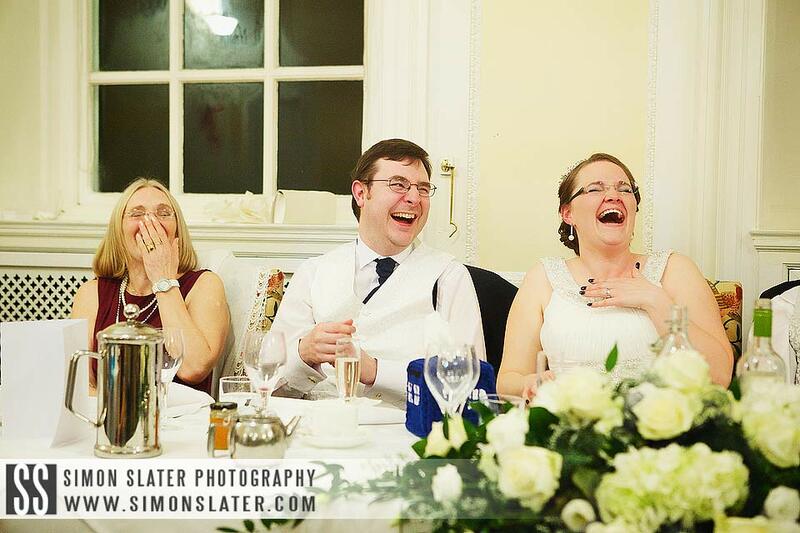 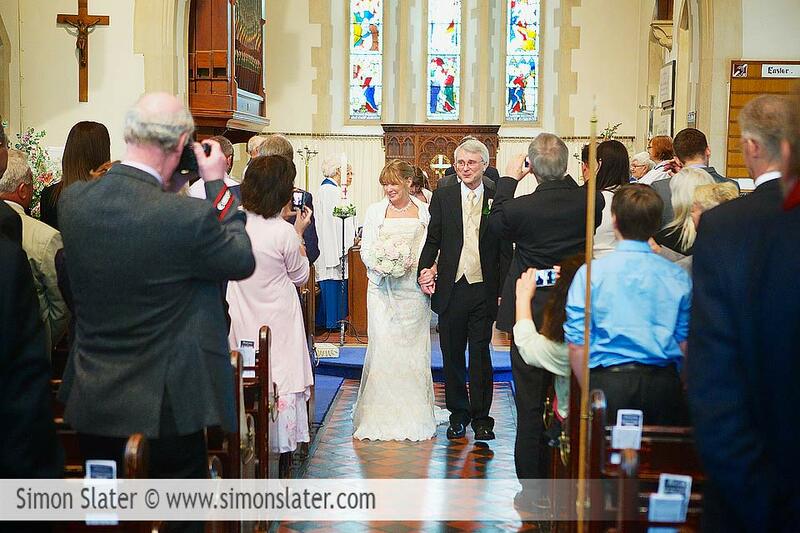 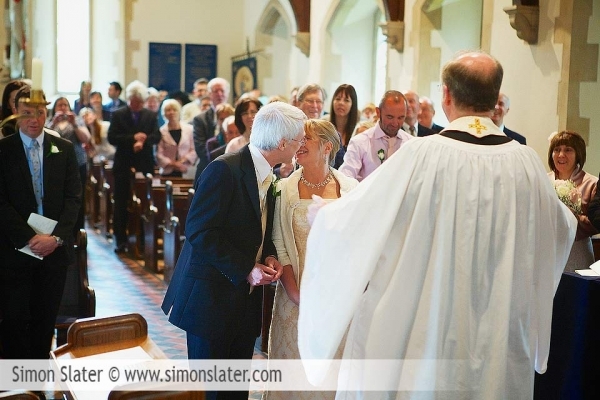 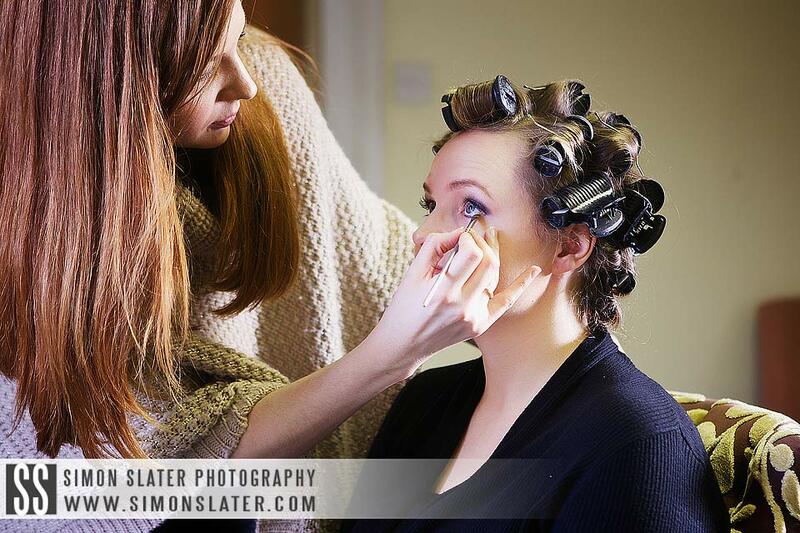 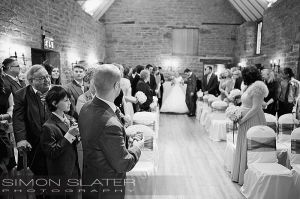 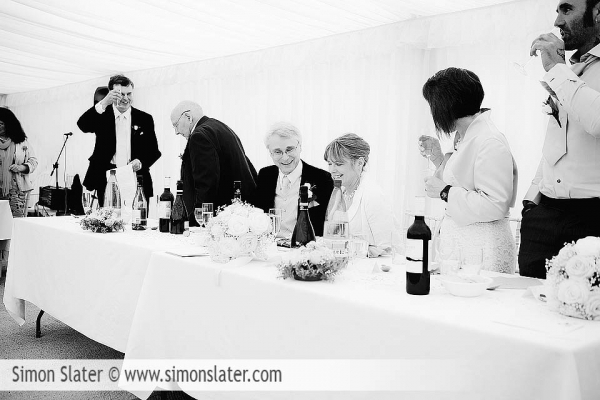 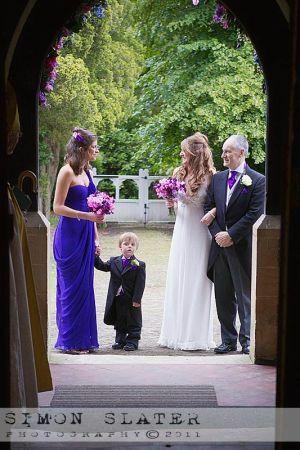 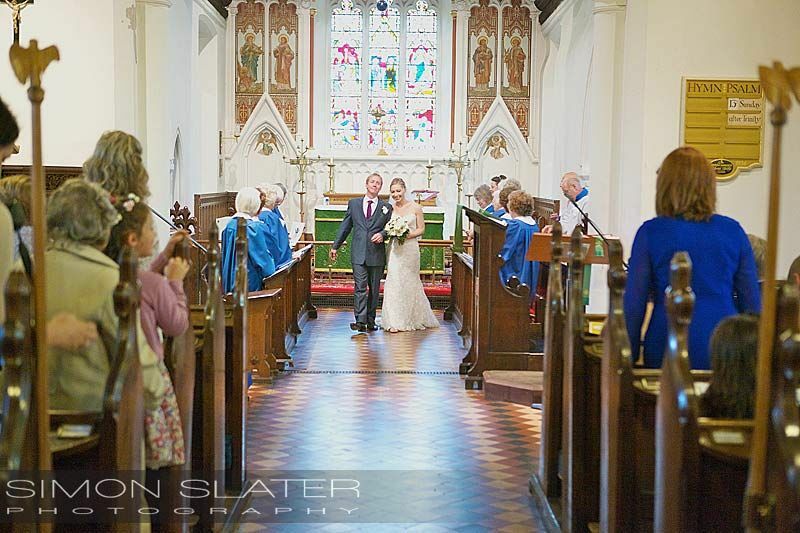 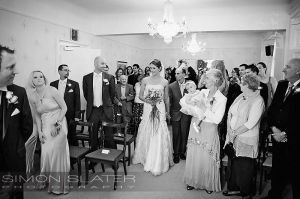 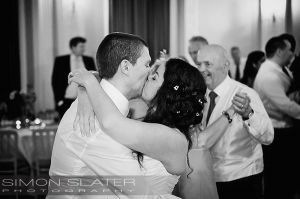 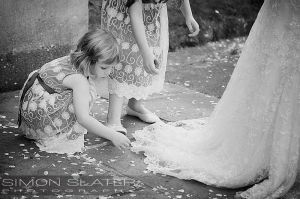 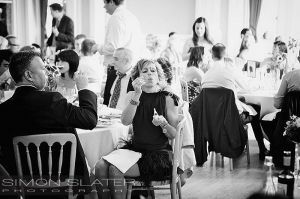 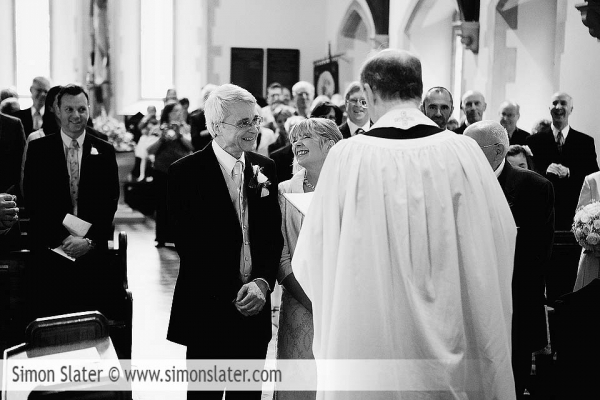 “Simon did a simply fantastic job for us on our big day. 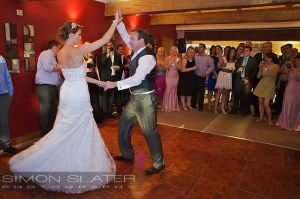 From the moment that we first met with him, he was eager to work with us to ensure that everything went as smoothly as possible – even when facing some banal questions from a fretting husband and wife to be! 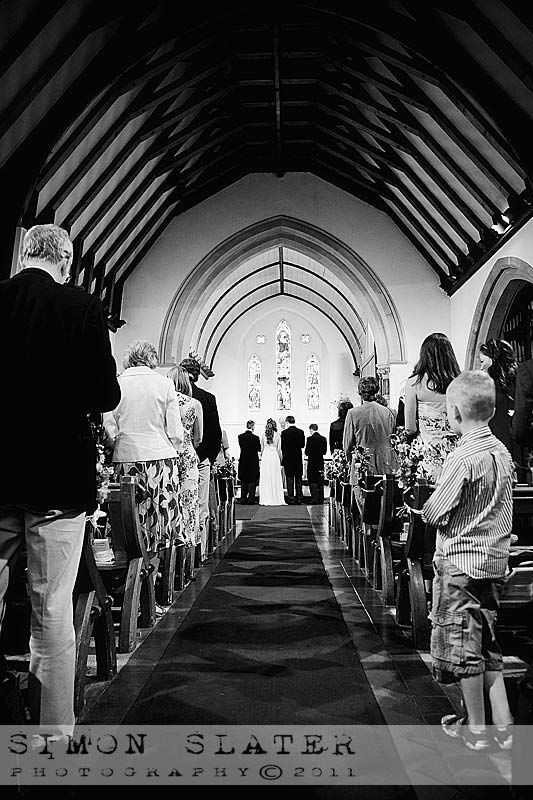 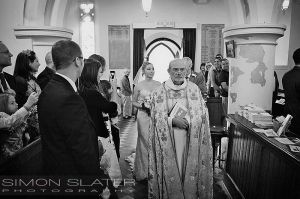 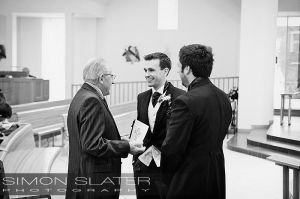 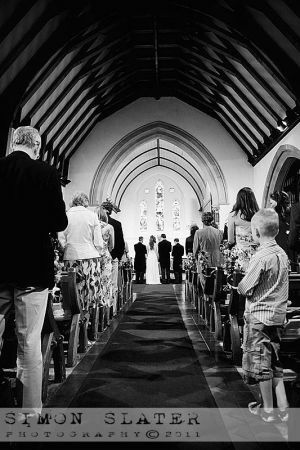 Simon took a great deal of care to visit and assess the venues prior to the day, even speaking with the priest to ensure that he knew the ’rules’ at our church. 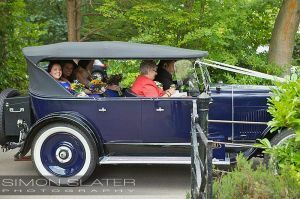 In addition to this, we wanted to find a scenic spot to stop off at between our ceremony and reception. 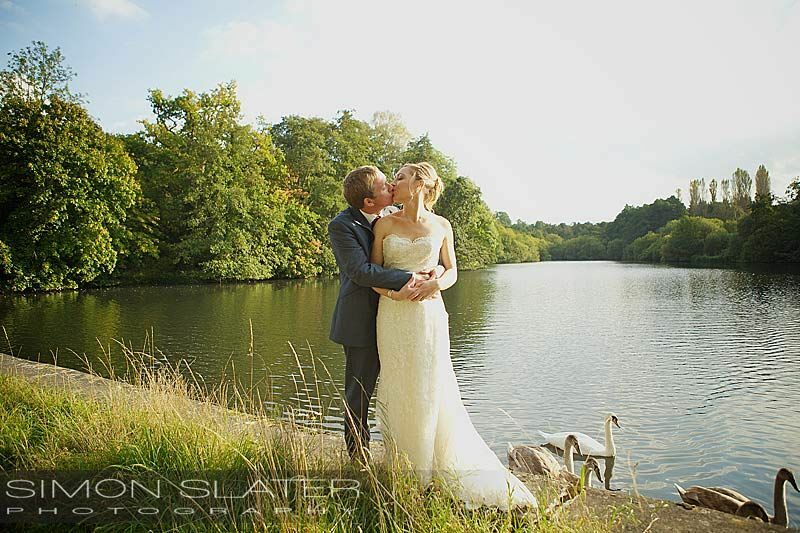 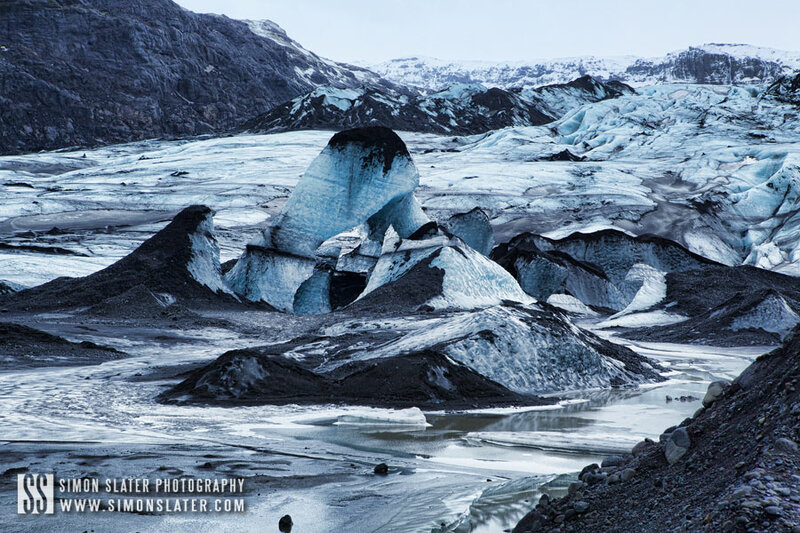 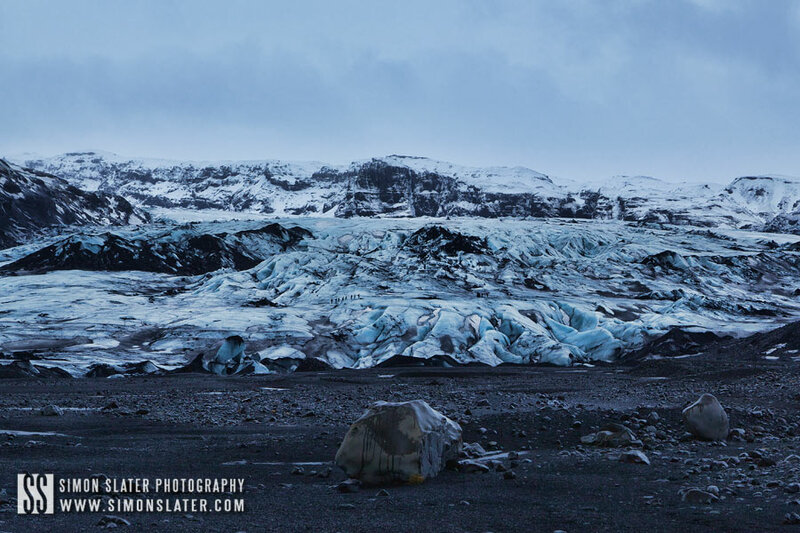 Simon gave us a number of different suggestions and we settled on an excellent spot that we never would have found otherwise – and it made for some fabulous photographs. On the day, a number of family members and friends remarked on how unobtrusive Simon was; Claire’s granddad was amazed at just how hard Simon was working – I don’t think he stopped for a moment for the whole day, and was very accommodating when we made some last minute tweaks on the day (notably to the number of group photos that we expected). 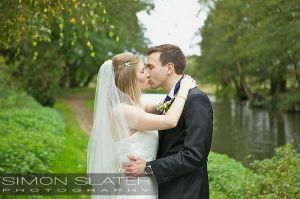 When we returned from honeymoon, the photos were waiting for us to view online, and Simon quickly made the changes that we requested. 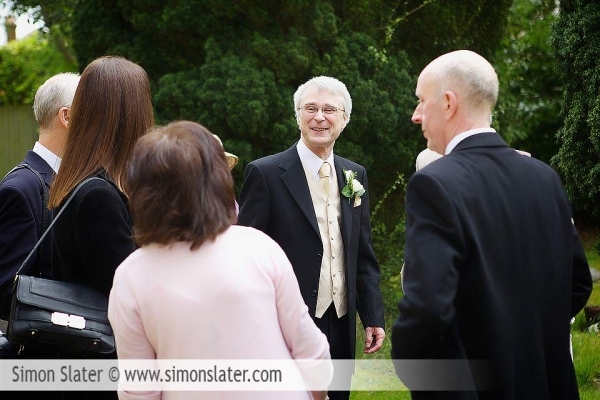 Once we were ready to order the album, he was again friendly and helpful, and the album arrived very quickly – Simon even gave us notice of when it would arrive so that we could decide where best to send it/ensure that we were in. 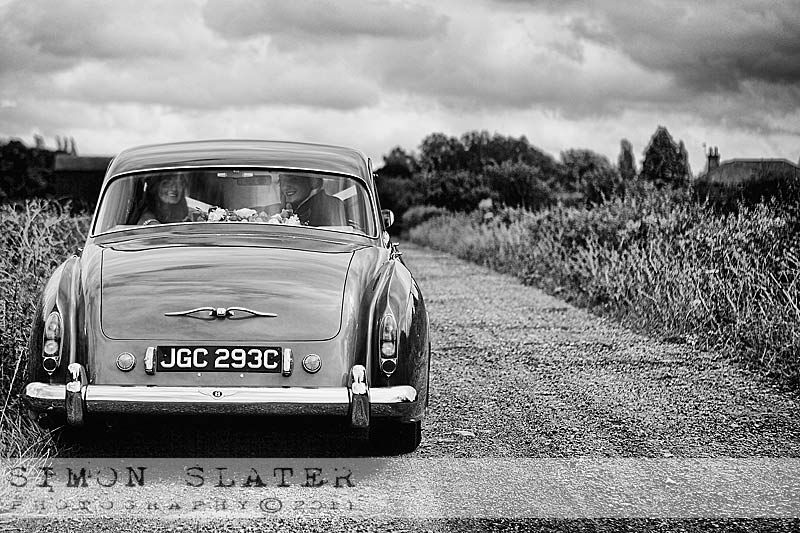 The album itself looks superb and we are very pleased. 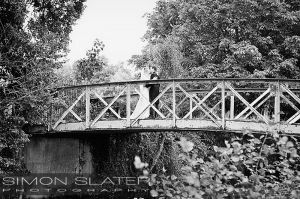 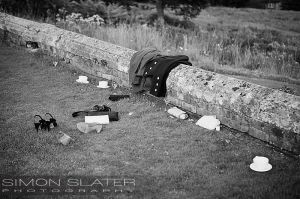 Towards the middle of August I had the pleasure of photographing a friends wedding, Ali and Adam at Guildford Registry Office, Surrey. 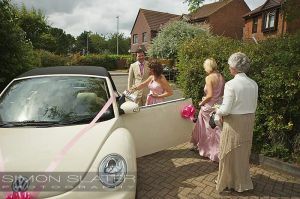 Ali was taken to the registry office with her step father in a cream convertible Beetle adorned with pink ribbons. 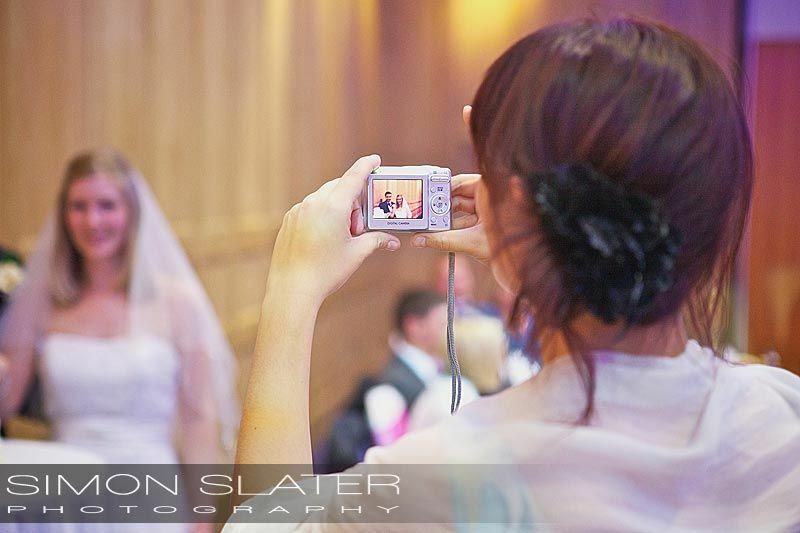 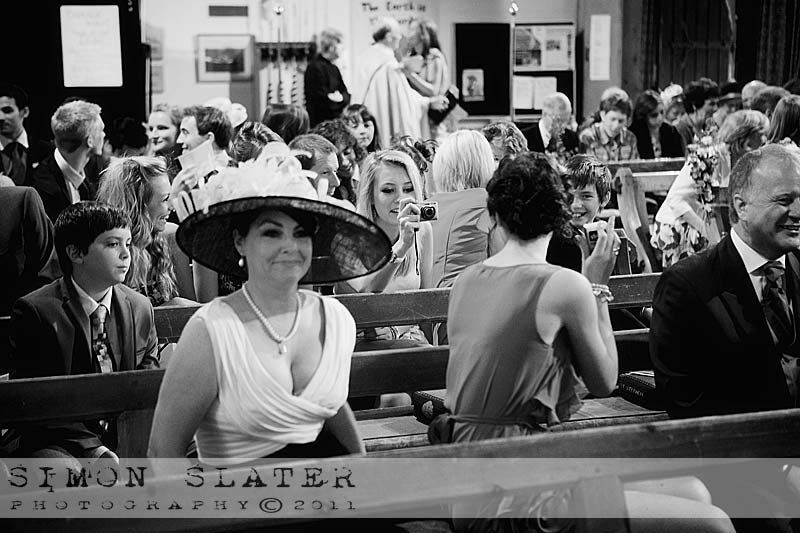 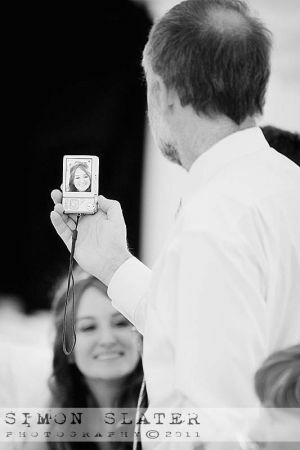 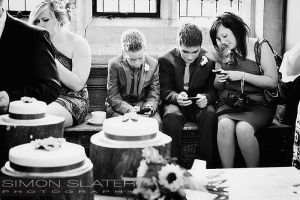 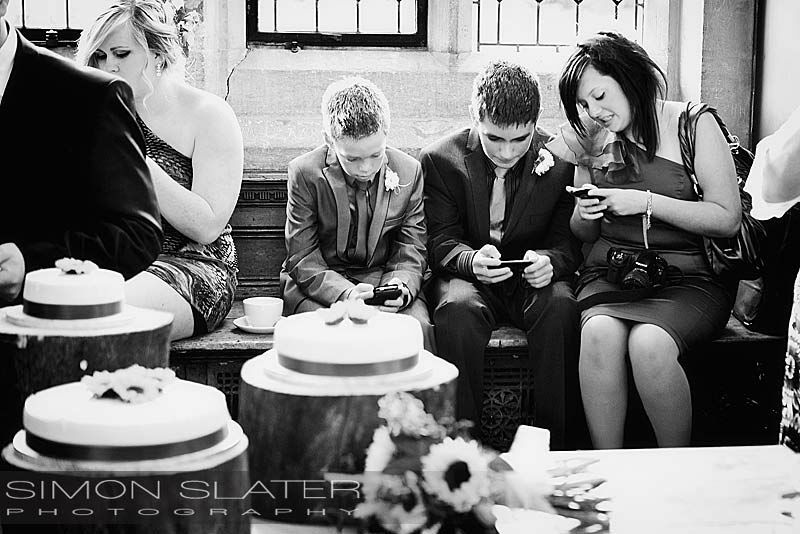 Quite strange to be photographing a wedding, but also part of it!! 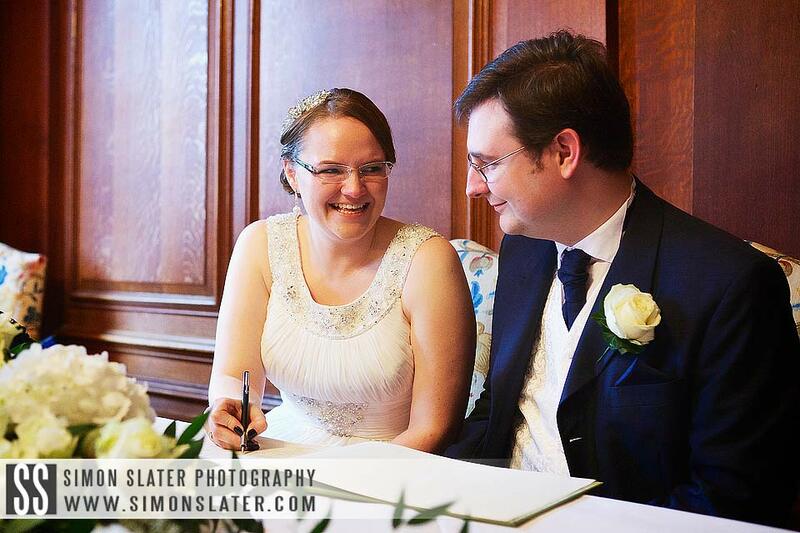 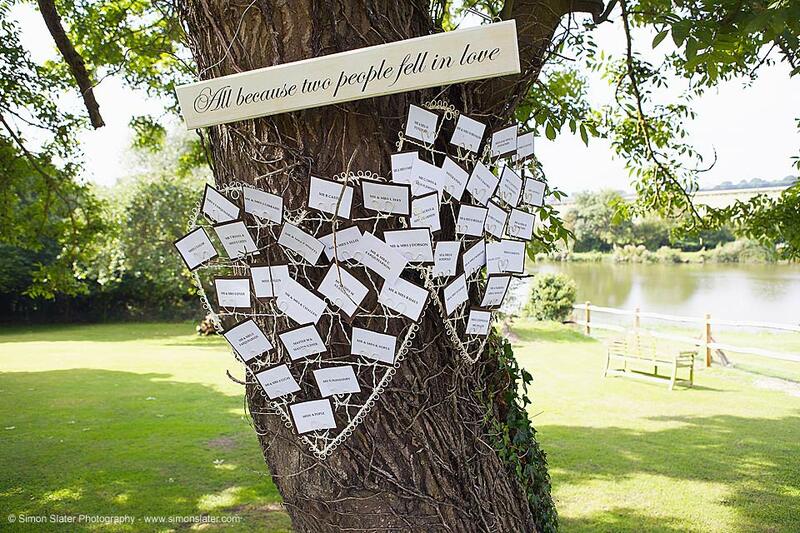 Ali and Adam were married in the registry office by 14:30 hrs, Congratulations again to Mr & Mrs Hollingsworth. 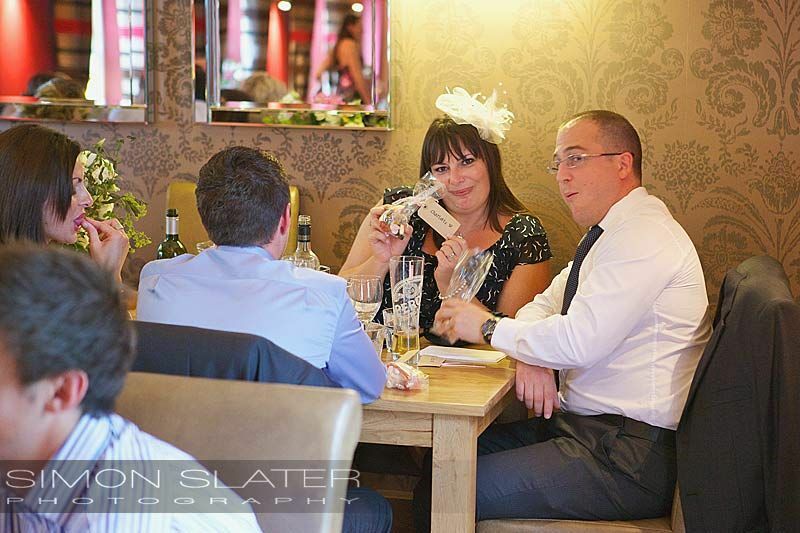 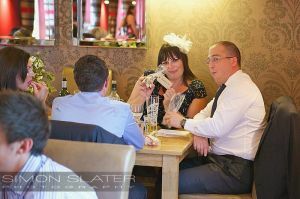 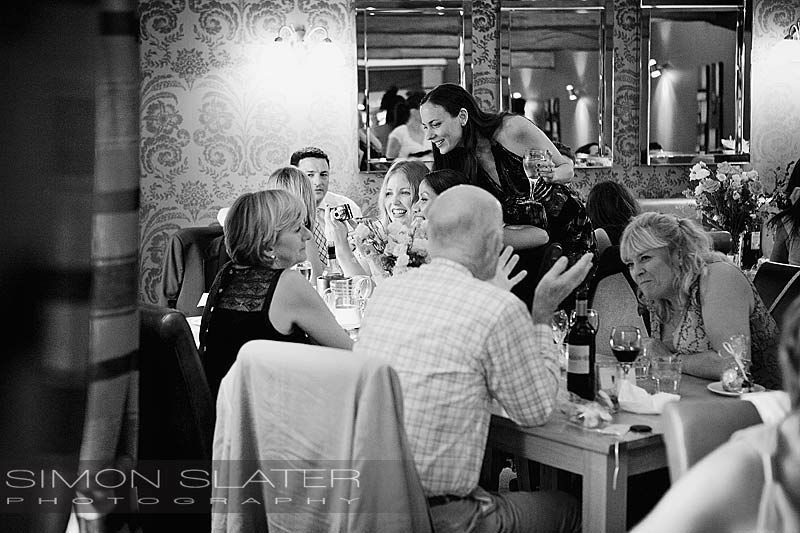 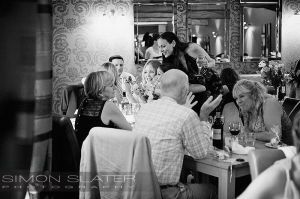 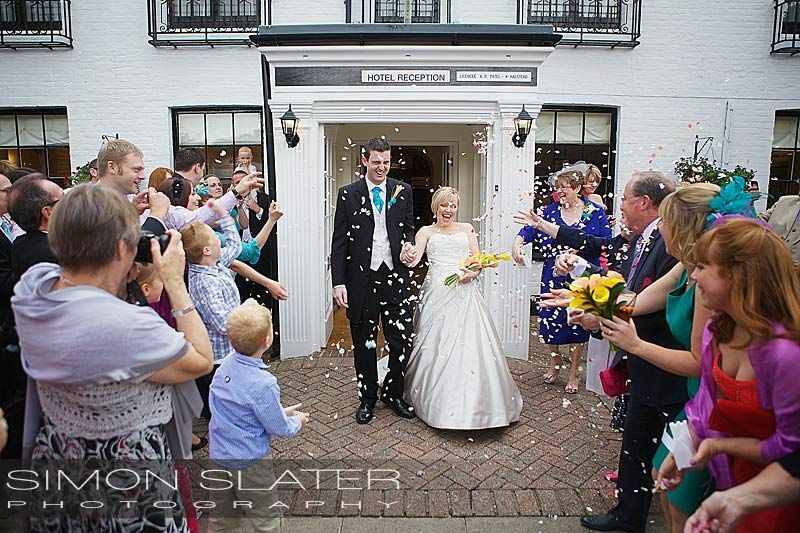 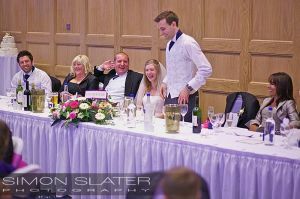 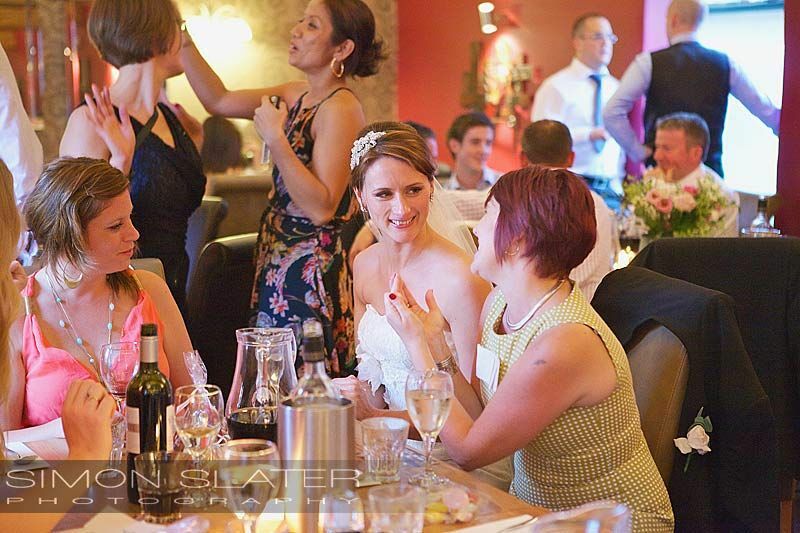 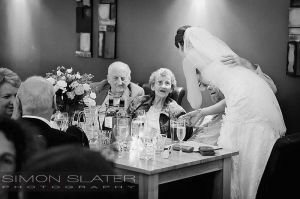 The bride and groom, wedding party, family and friends all made their way to The White Hart in Wood Street Village, Surrey for a champagne reception and evening celebrations. 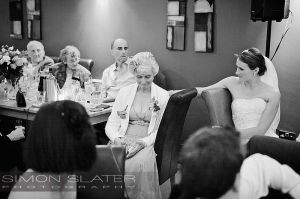 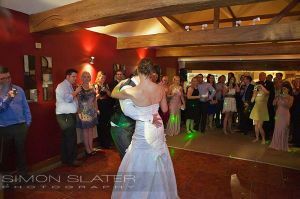 The wedding reception, speeches, cutting off the cake, first dance and evening celebrations were all held in The White Hart pub. 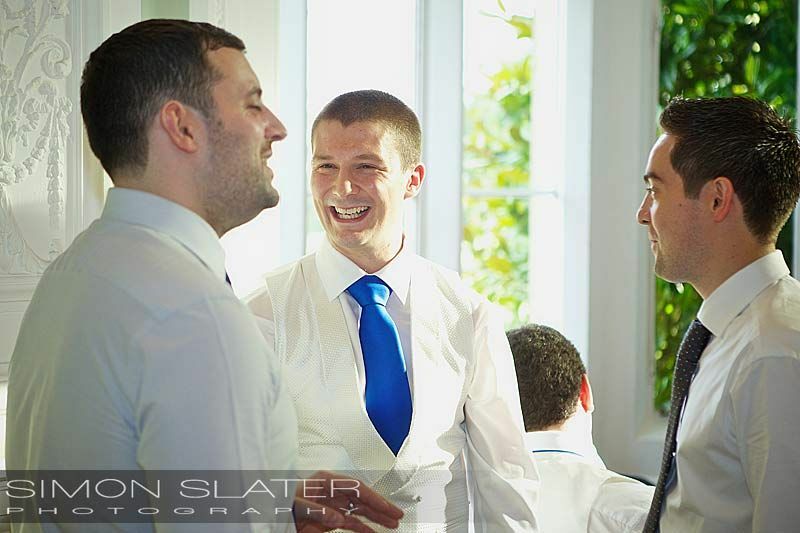 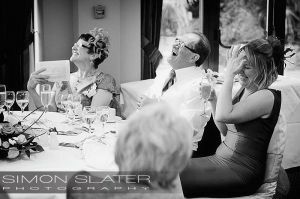 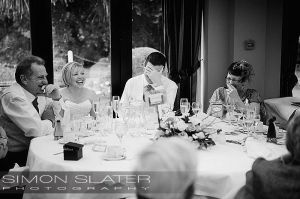 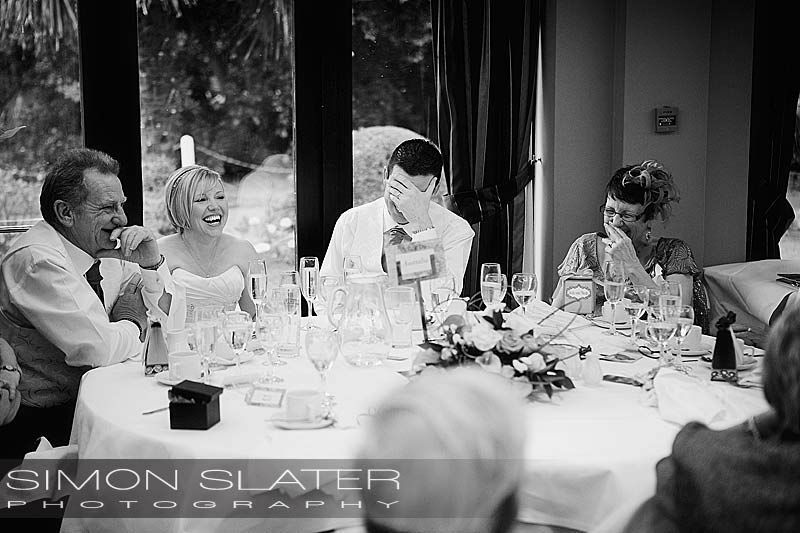 As you can see from some of the photos Ali and Adam had a great day and were truly up for a laugh in front of the camera.